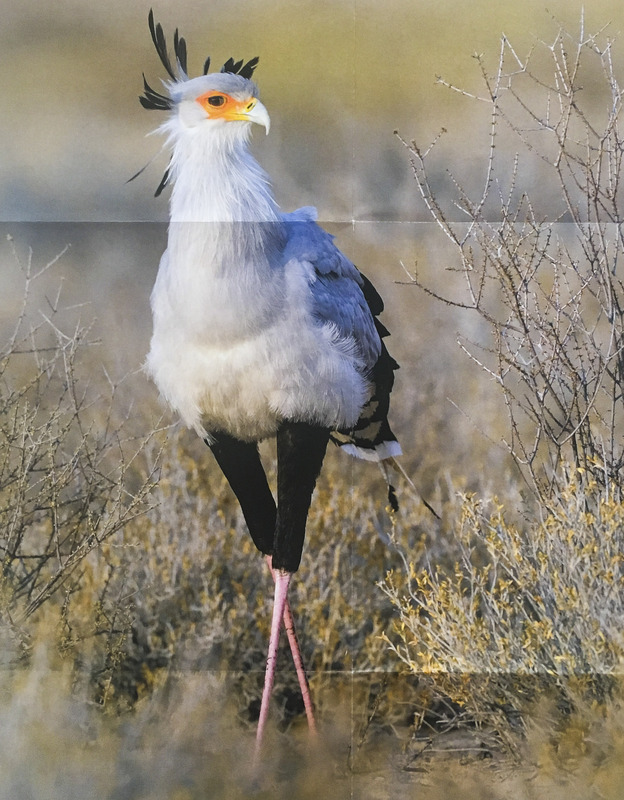 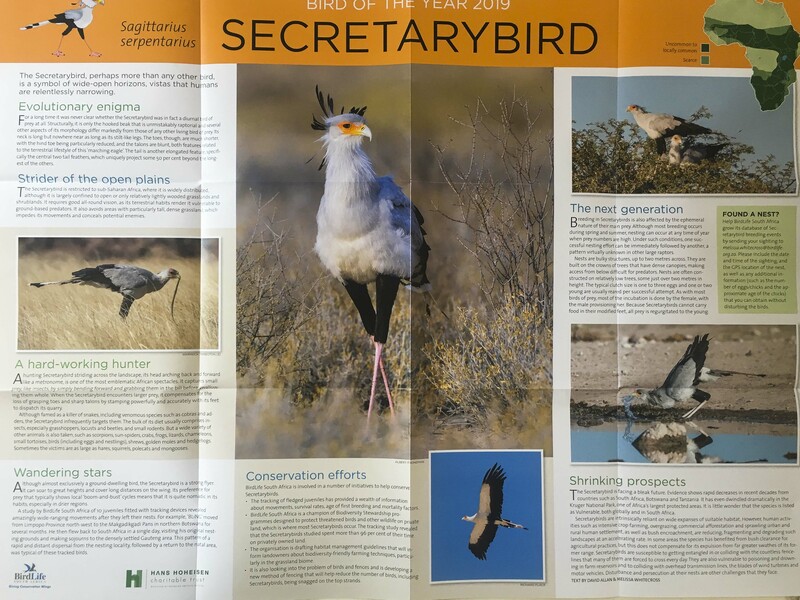 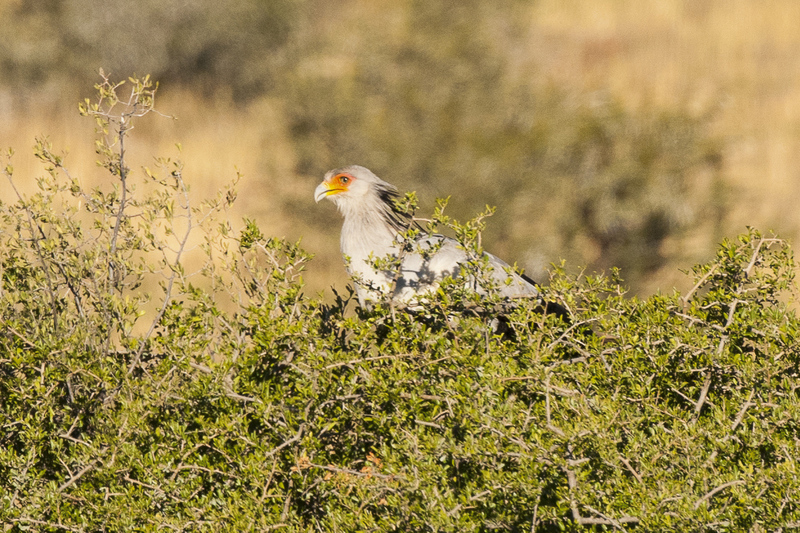 Each year Birdlife South Africa chooses a Bird of the Year and for 2019 the chosen bird is the very unique Secretary Bird. 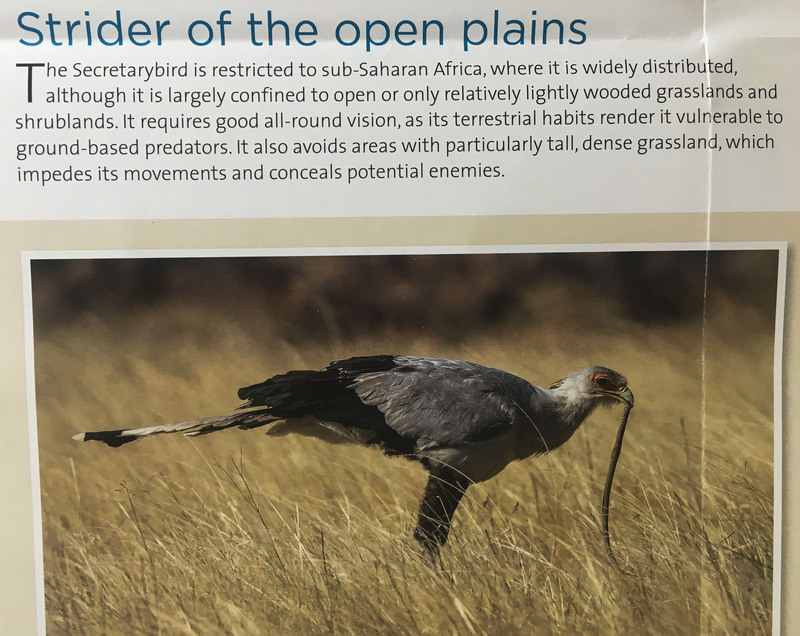 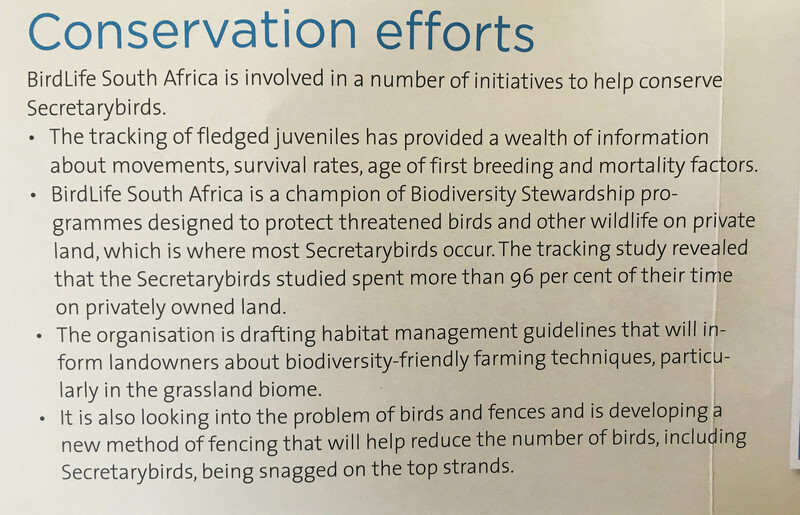 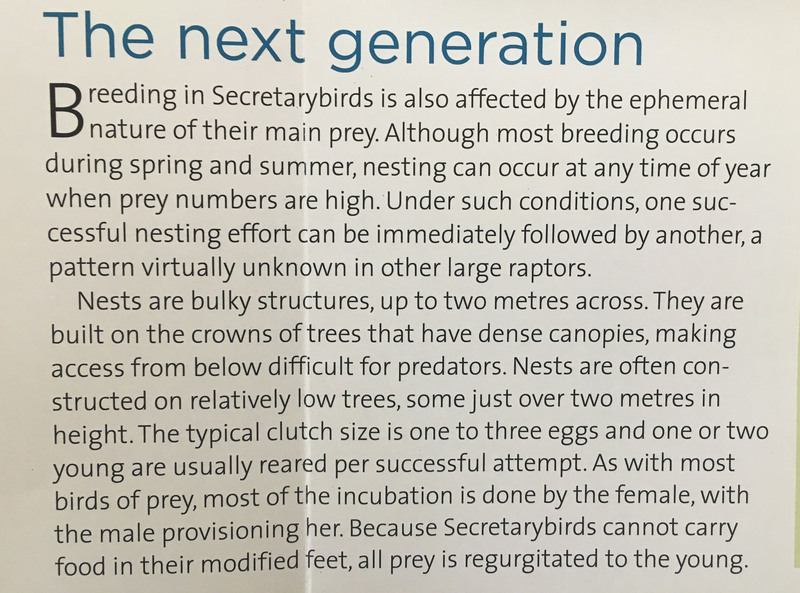 To celebrate this, Birdlife SA included a very informative poster in the latest African Birdlife magazine, which I thought I would share here – however the only way to share an A1 size poster in a blog is by chopping it up into smaller, hopefully readable, chunks, which I have attempted to do with my iphone camera. 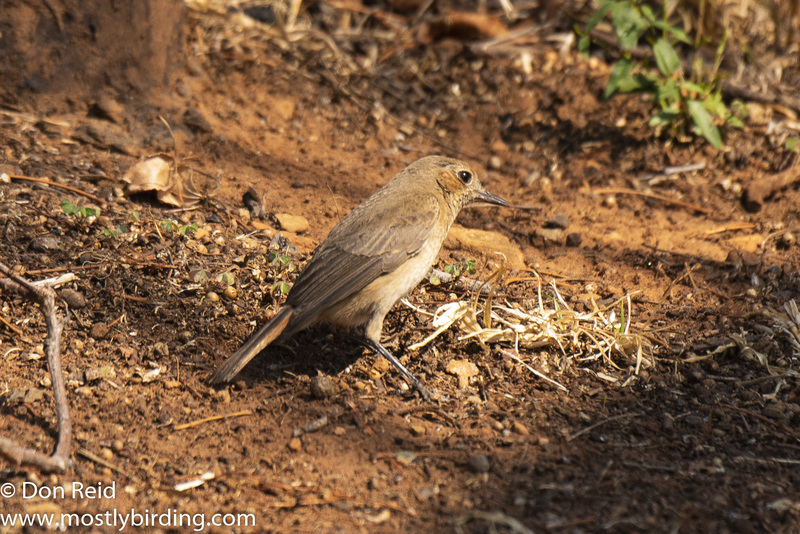 Niki, my trusted birding companion, accompanies me on all my birding trips and I have to admit I just cannot get along without her – she has eyes like a hawk which can help to identify those distant birds in a trice with just one quick glance and is content to endure hours of travel on sometimes bumpy, dusty roads with nary a complaint. 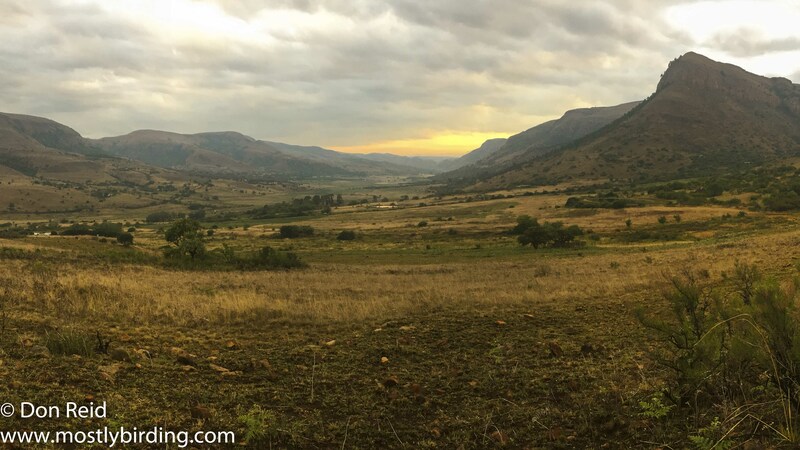 So I was deeply concerned when Niki started showing signs of weariness and a distinct lack of focus towards the end of 2018 and I resolved to book her into a clinic as soon as we were back in Gauteng in January 2019. 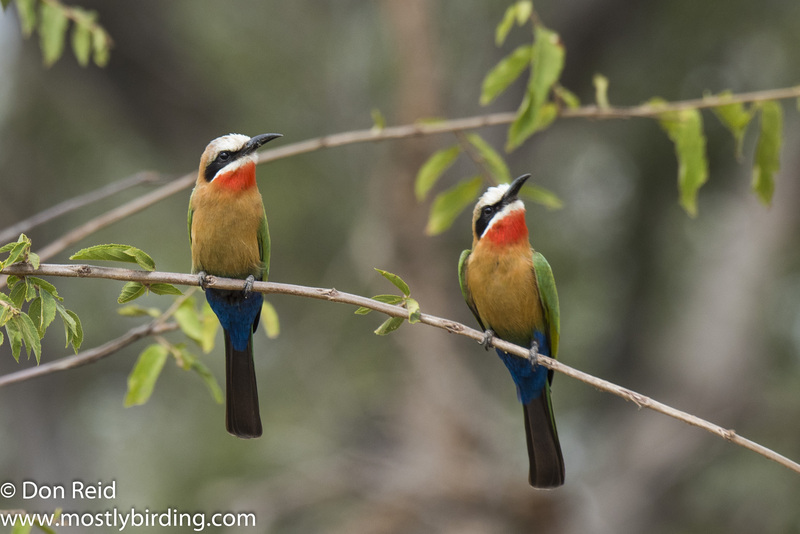 Niki went to the clinic without complaint and I booked her in on a Monday, hoping that her stay would not be long – they sent a message later setting out the proposed treatment and estimated that she would have to stay for at least a week for the treatment to have the desired effect, which I replied was acceptable. 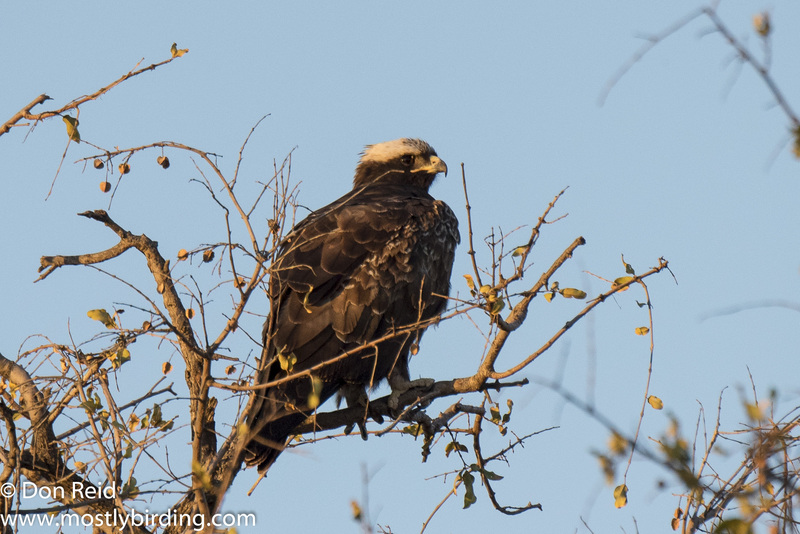 The week without Niki was difficult and my birding outing was just not the same without her on the seat beside me, but I knew it was something that had done. 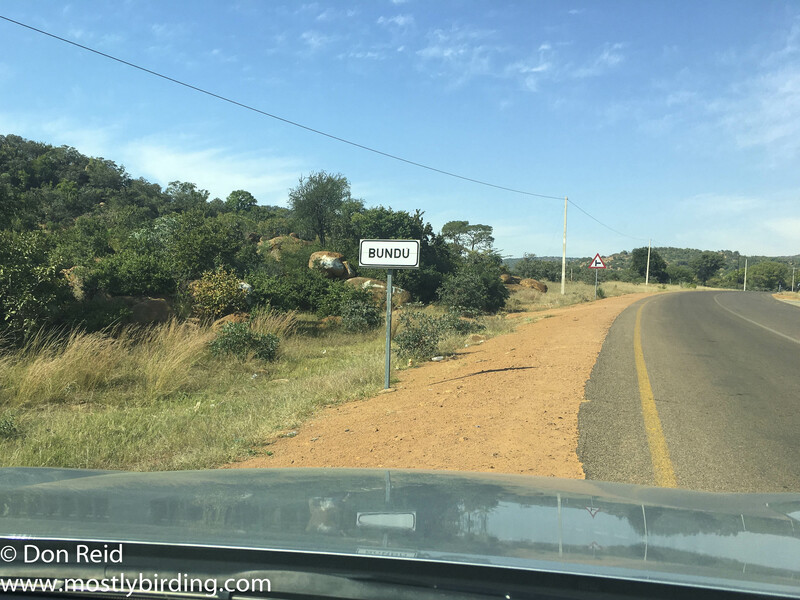 I resisted the temptation to visit Niki in the clinic, being so far from our house and patiently waited for the message to tell me I could come and fetch her. 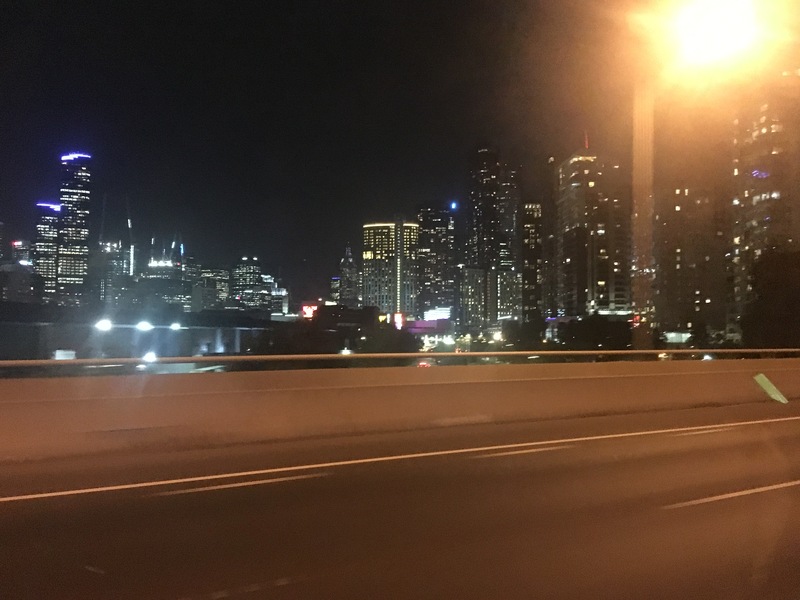 At last the message came to my phone – she was ready to go home! 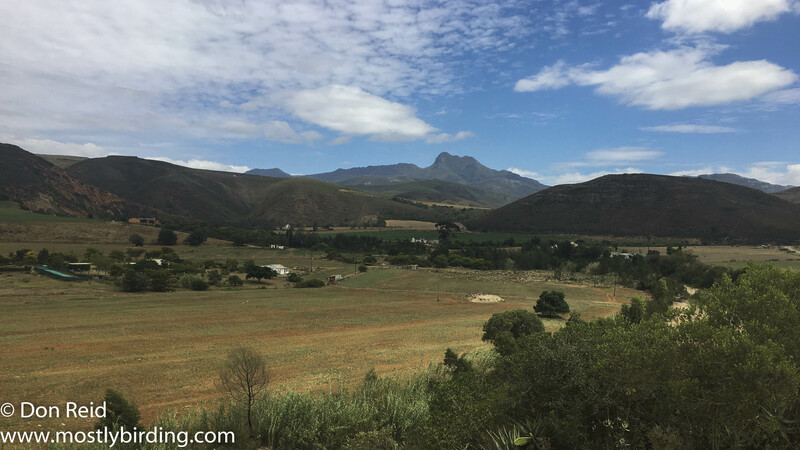 Next morning I drove to the clinic and fetched Niki – what a relief to hold her in my arms again! 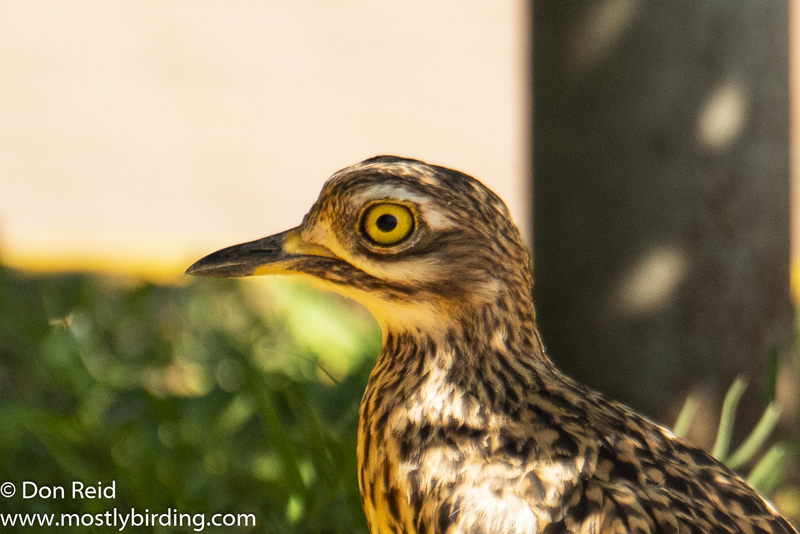 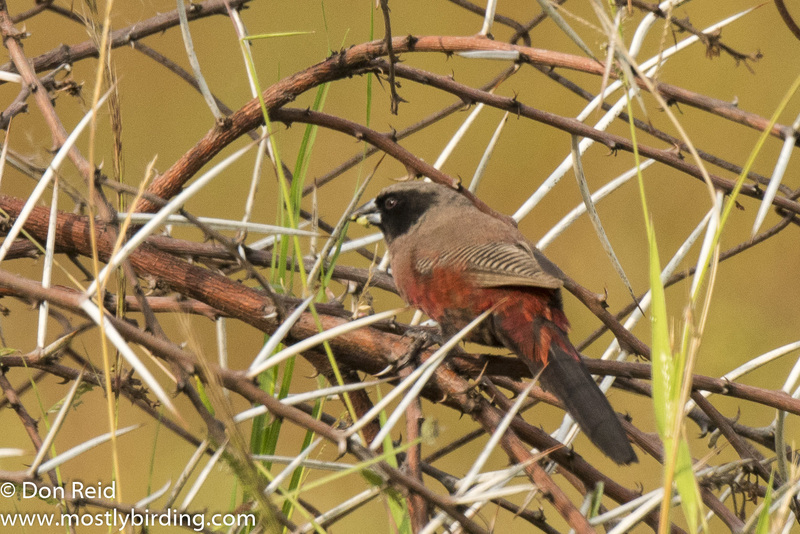 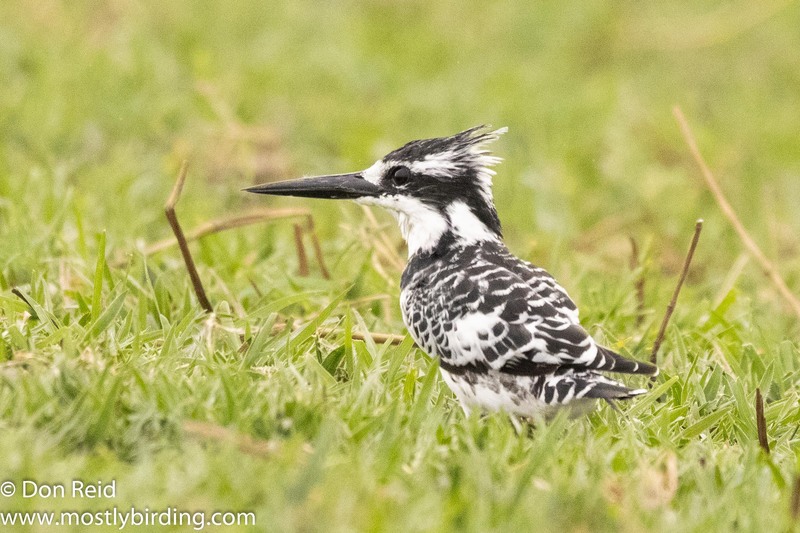 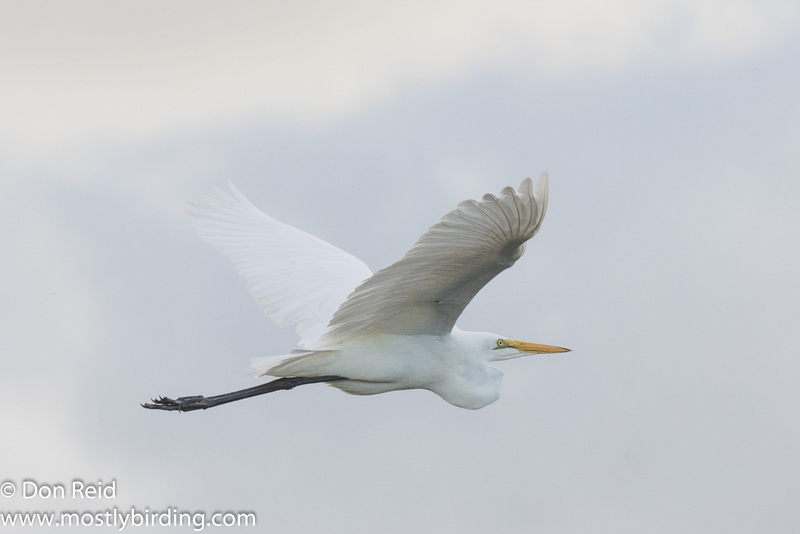 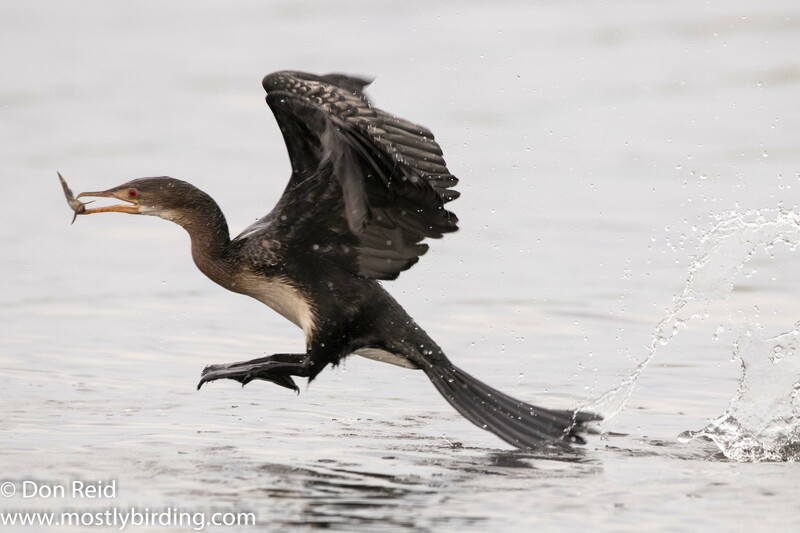 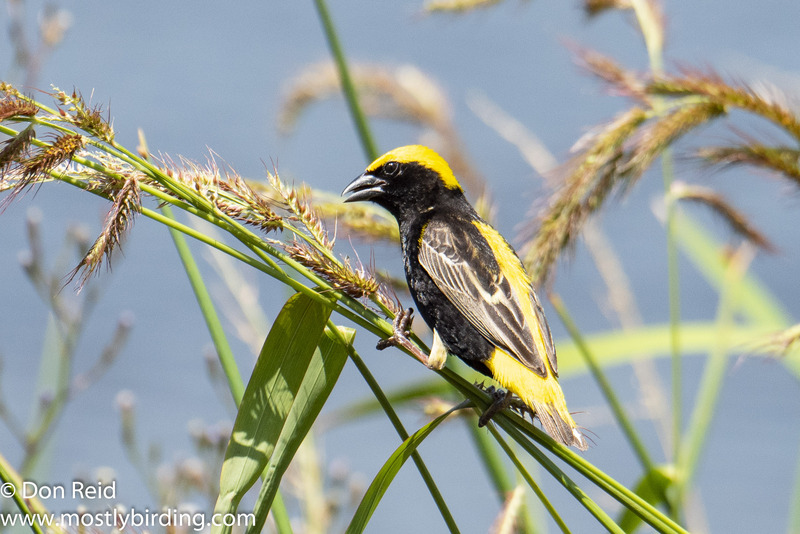 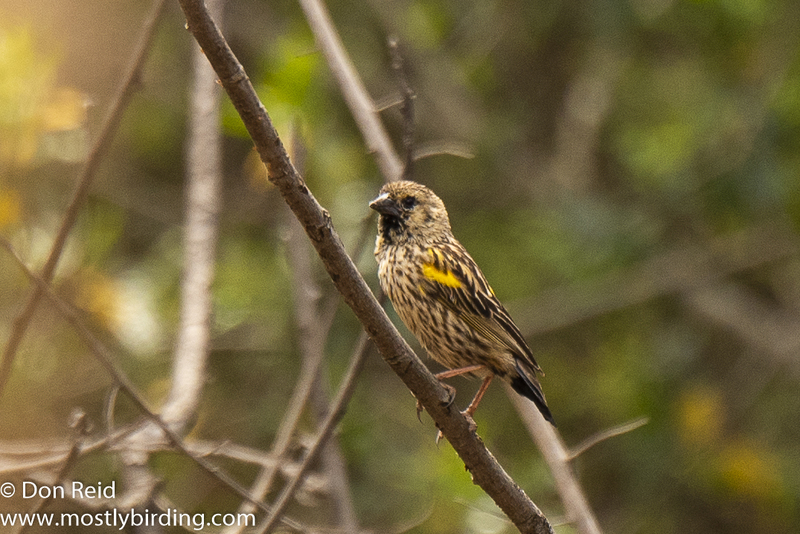 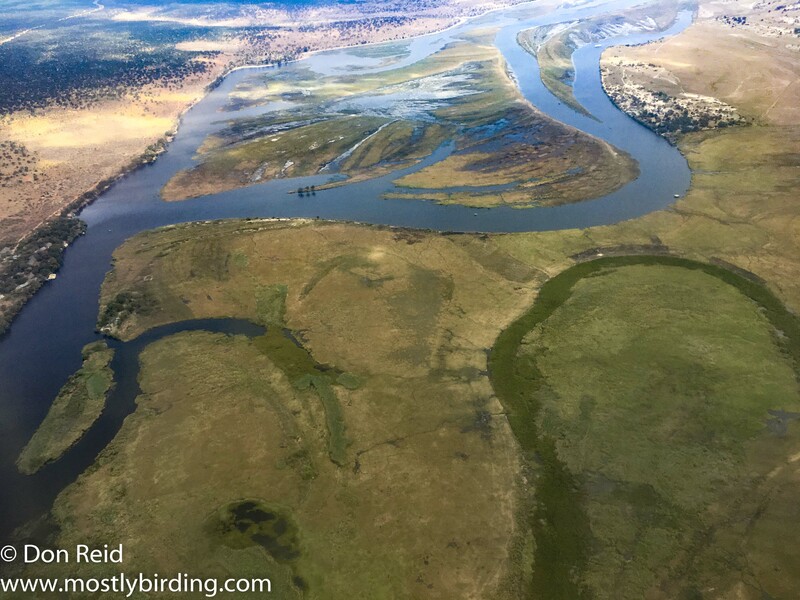 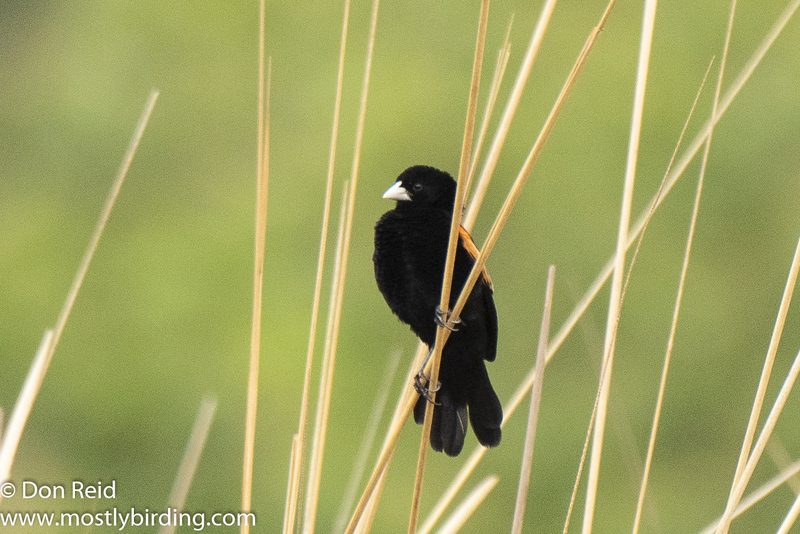 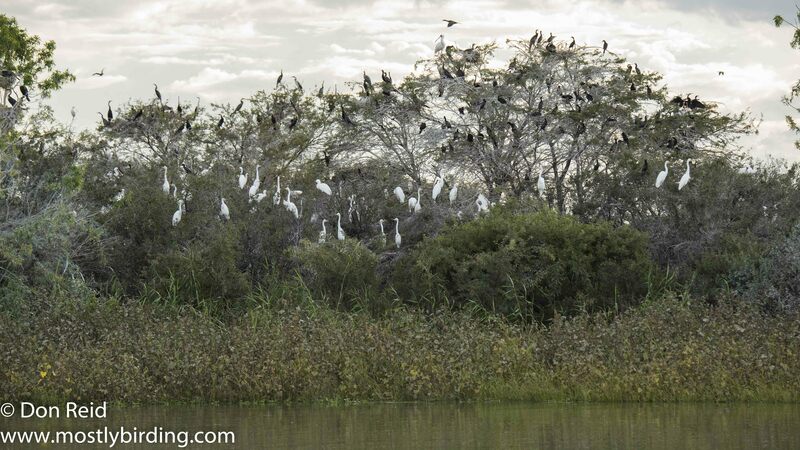 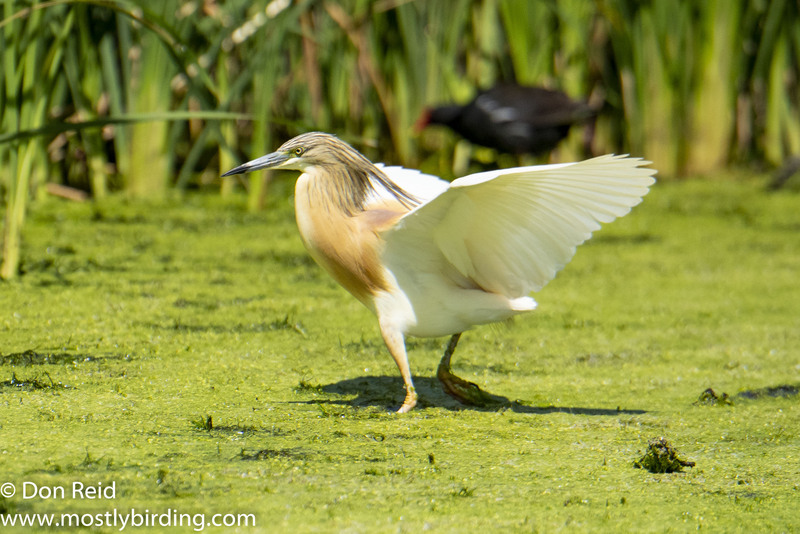 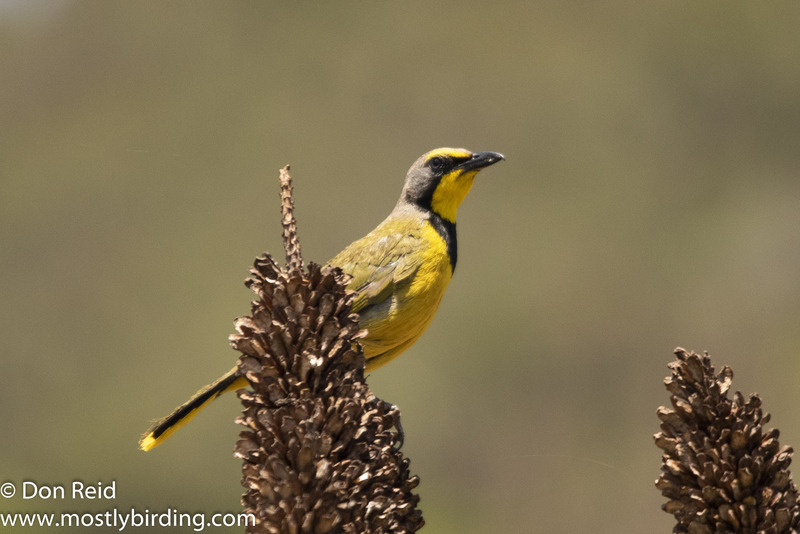 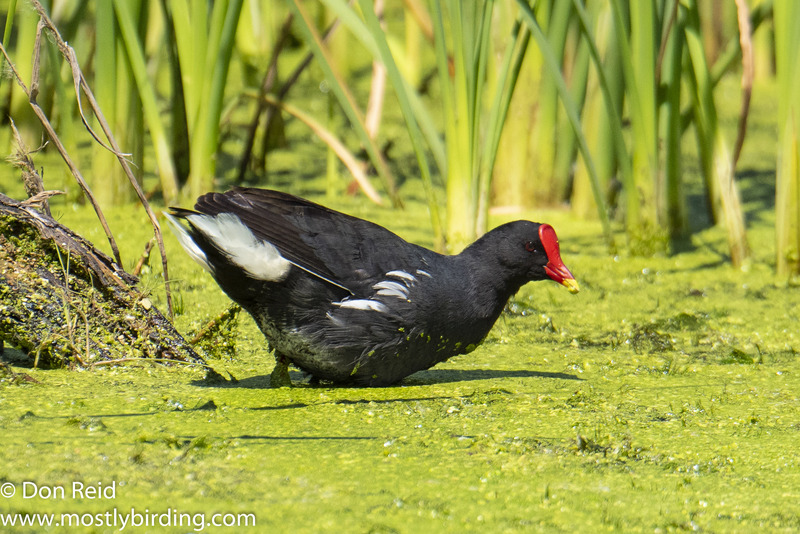 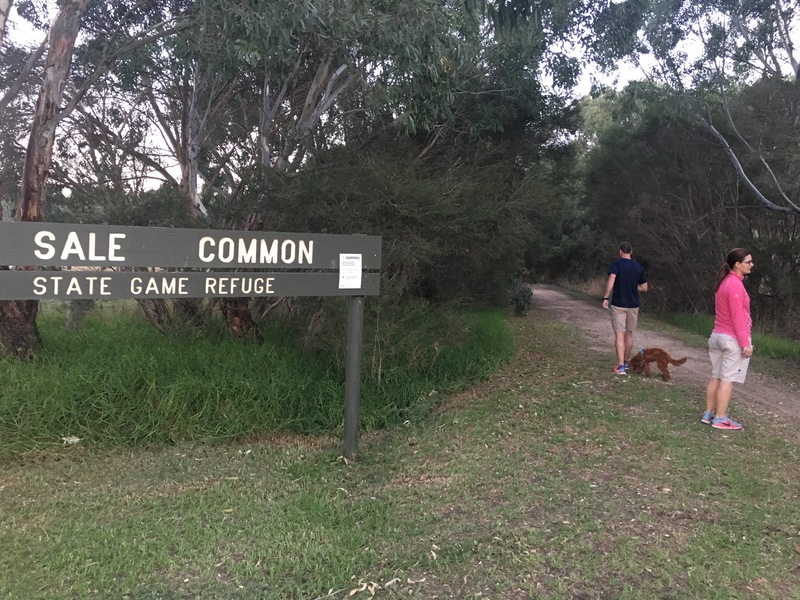 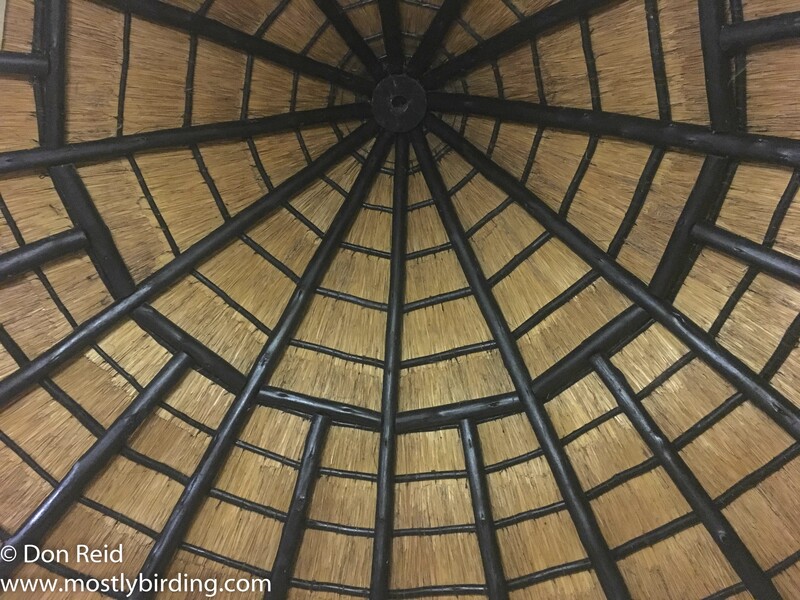 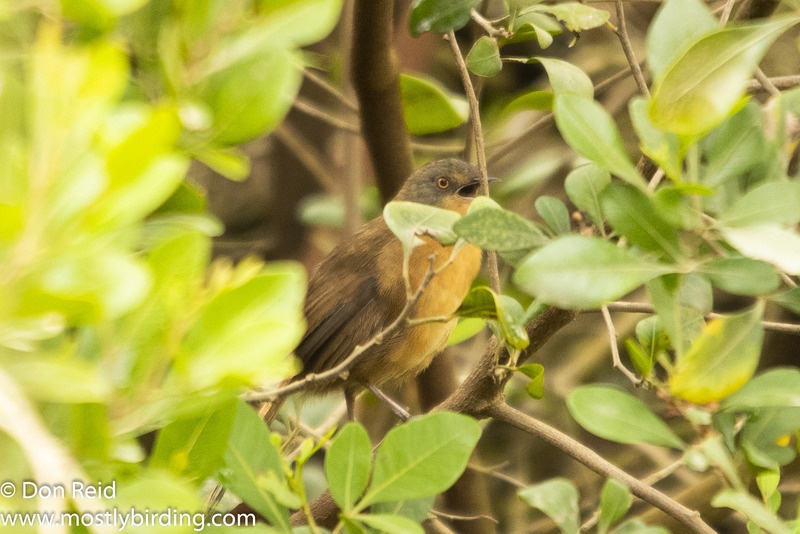 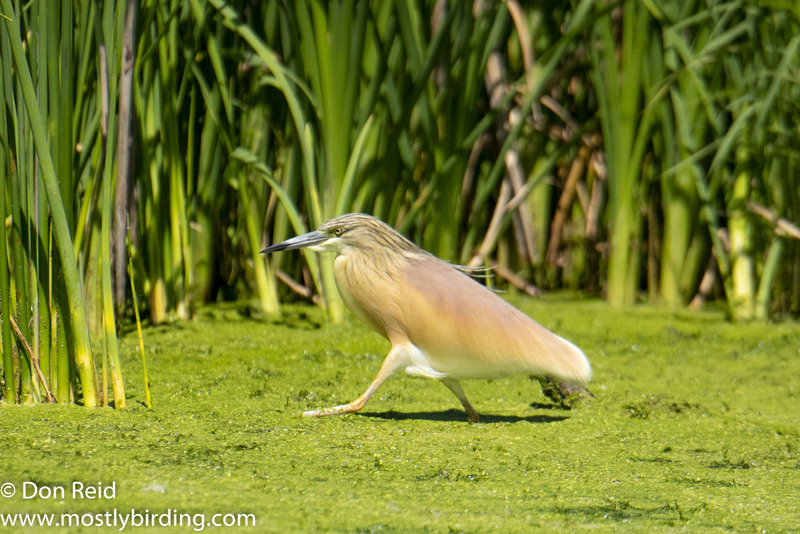 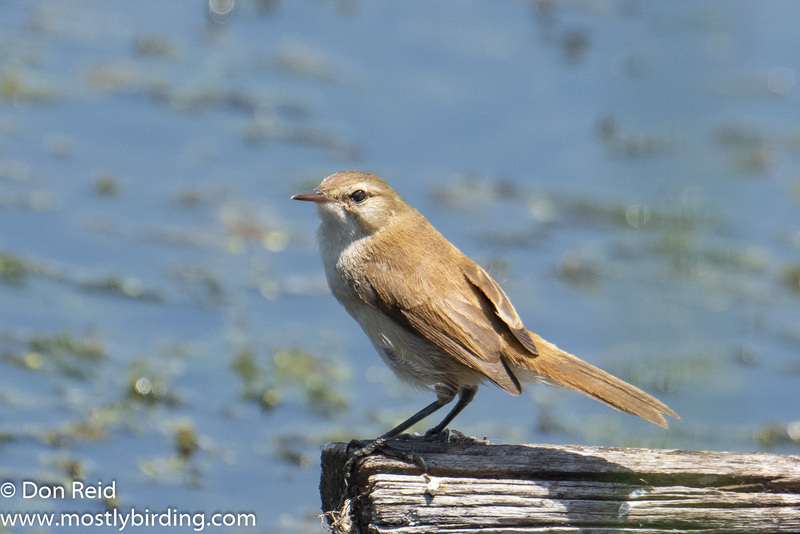 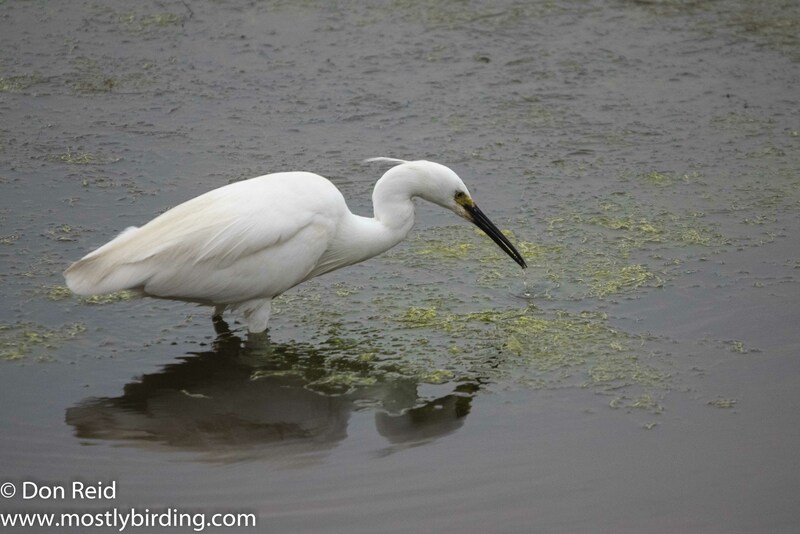 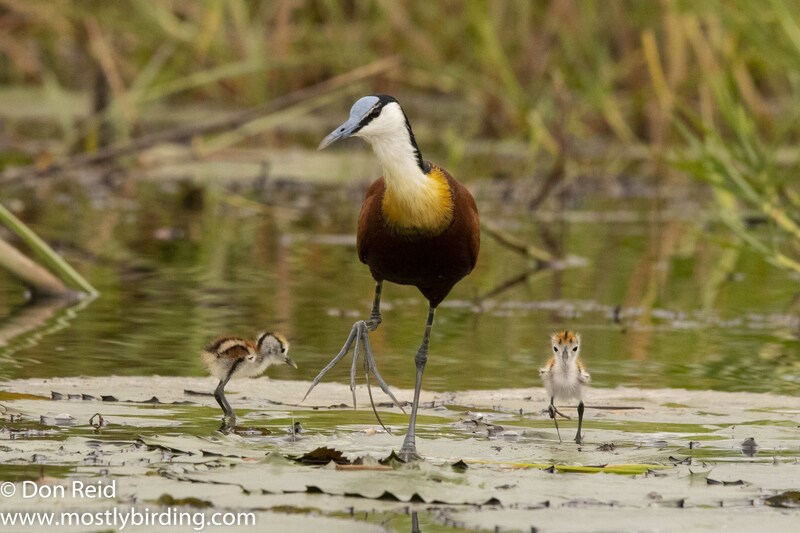 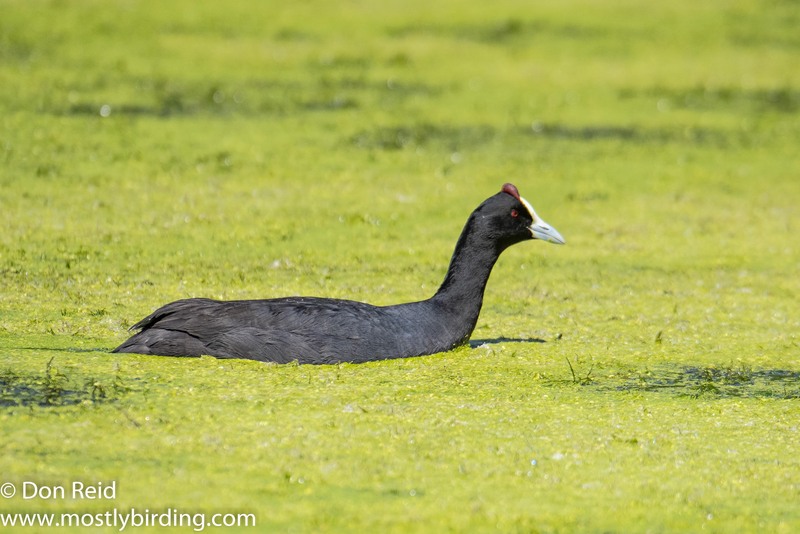 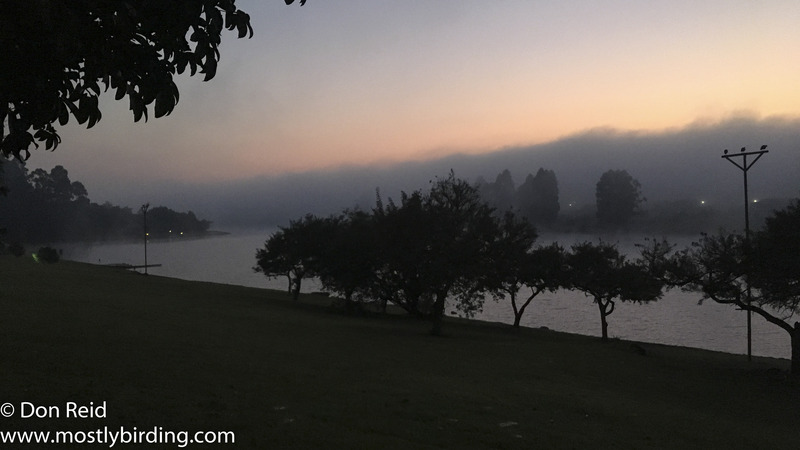 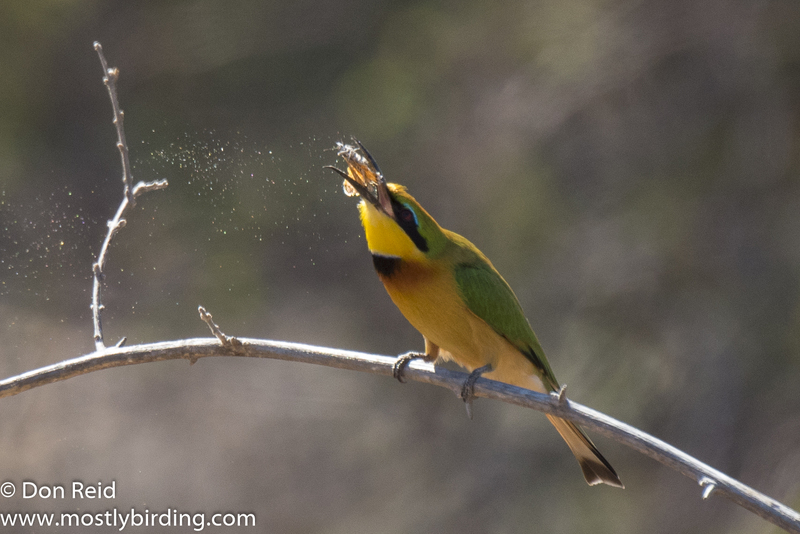 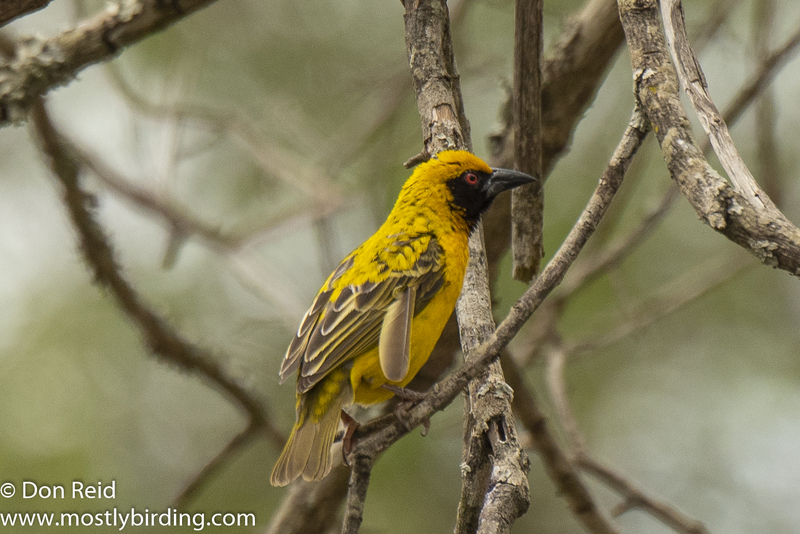 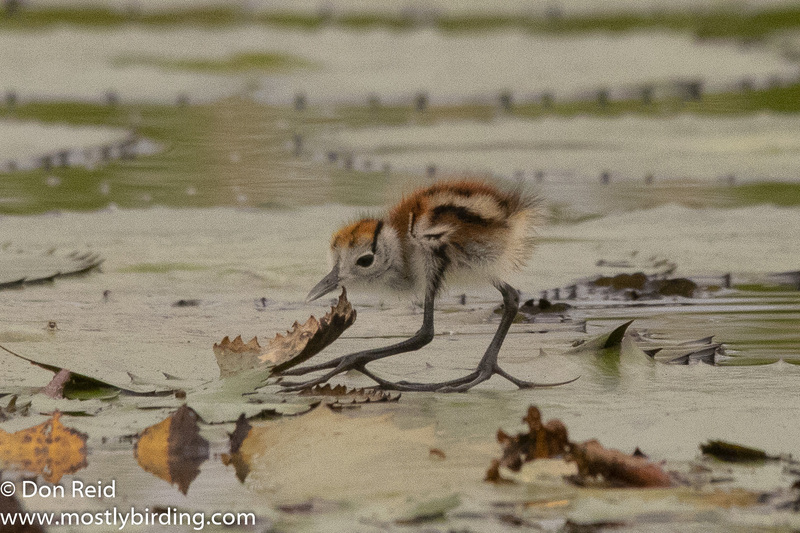 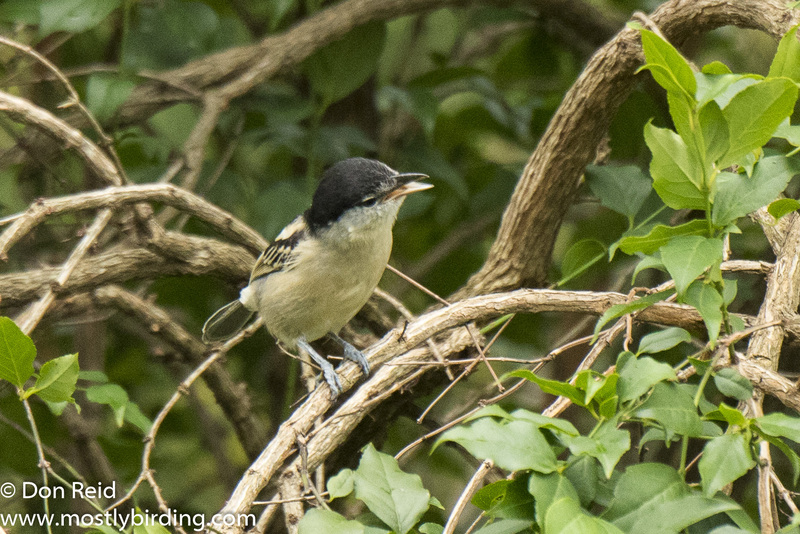 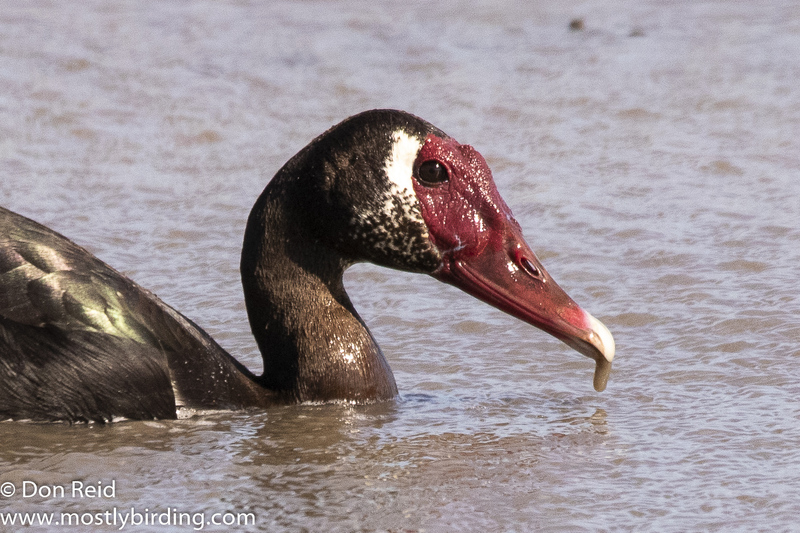 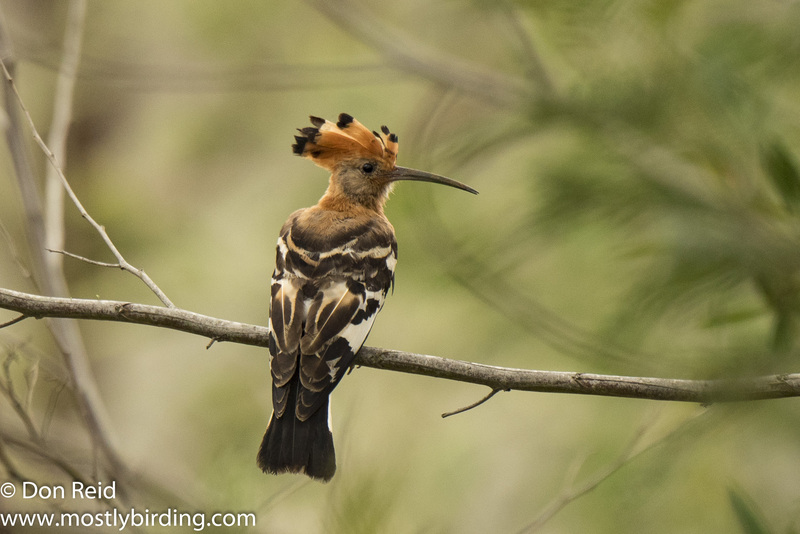 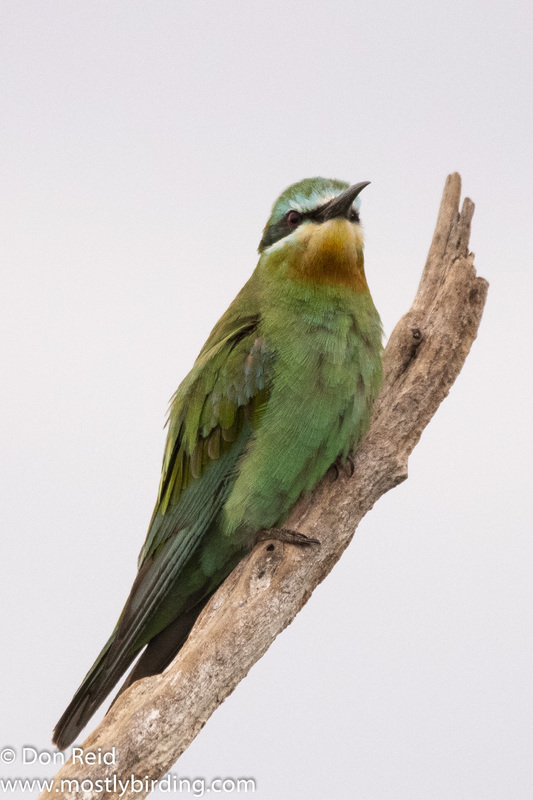 I could hardly wait for my next birding outing with Niki once again at my side and planned a trip to one of Gauteng’s prime birding destinations – Marievale Bird Sanctuary to put our combined skills to the test again. 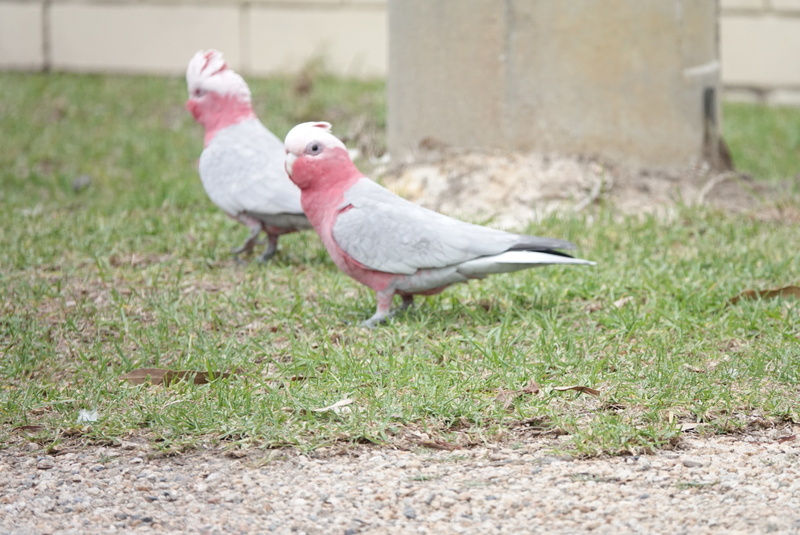 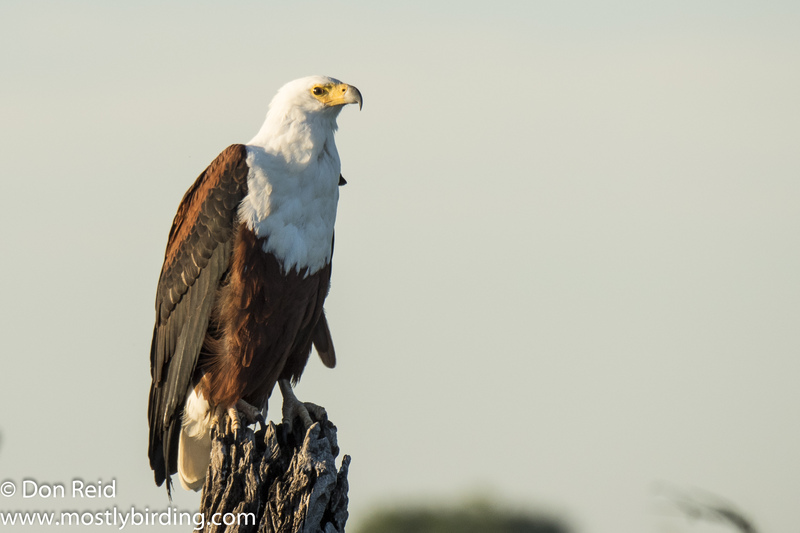 Niki, also known as my Nikon D750 DLSR camera with Nikon 80-400mm lens, performed admirably – but I will leave you with a few photos from the morning at Marievale, so you can judge for yourself. 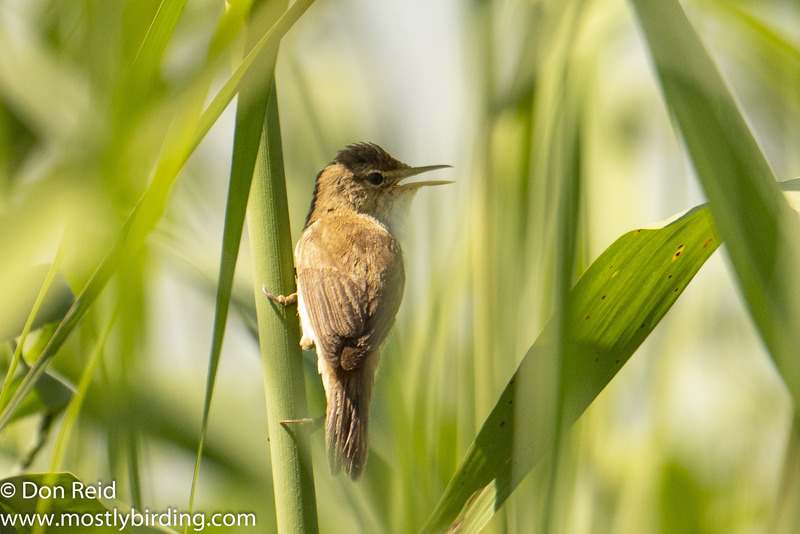 African Reed-Warbler / Kleinrietsanger (Acrocephalus baeticatus) – at one spot along the power-line track which has wetlands on both sides (shown in the featured image at the top of the post) I seemed to be surrounded by calling Warblers, with this species most prominent, calling vigorously and showing briefly amongst the reeds. 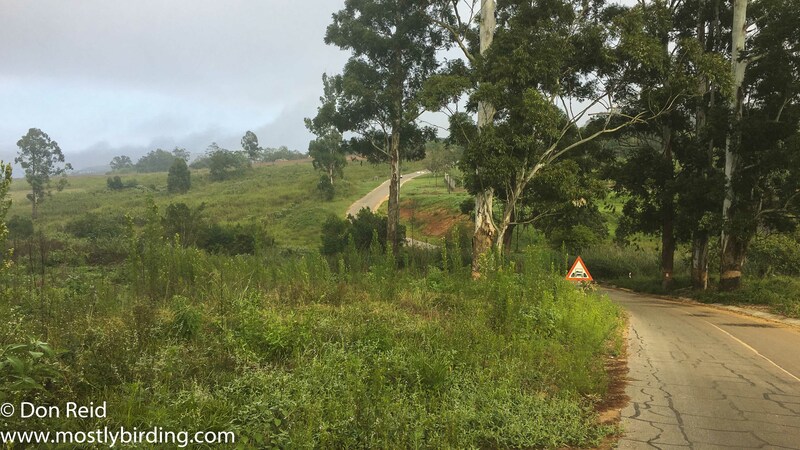 I have been fortunate during my working career to have been involved in construction projects which have taken me to some interesting, even exciting, parts of the world. 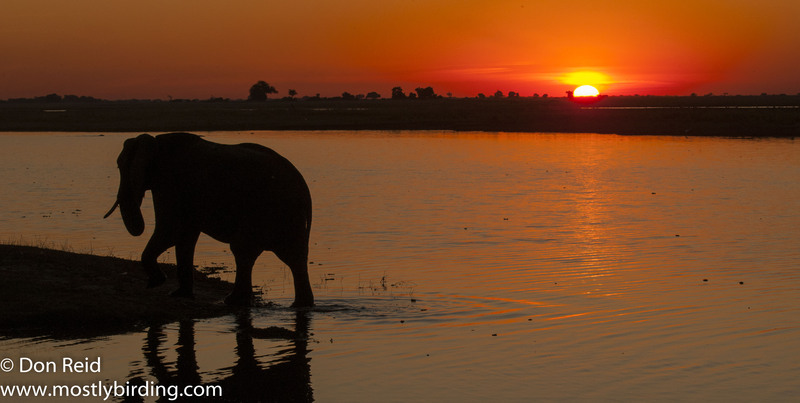 Top of that list is Kasane, a small town on the Chobe River in the far north of Botswana, South Africa’s neighbour on its northern side and one of the nicest countries you will find just about anywhere. 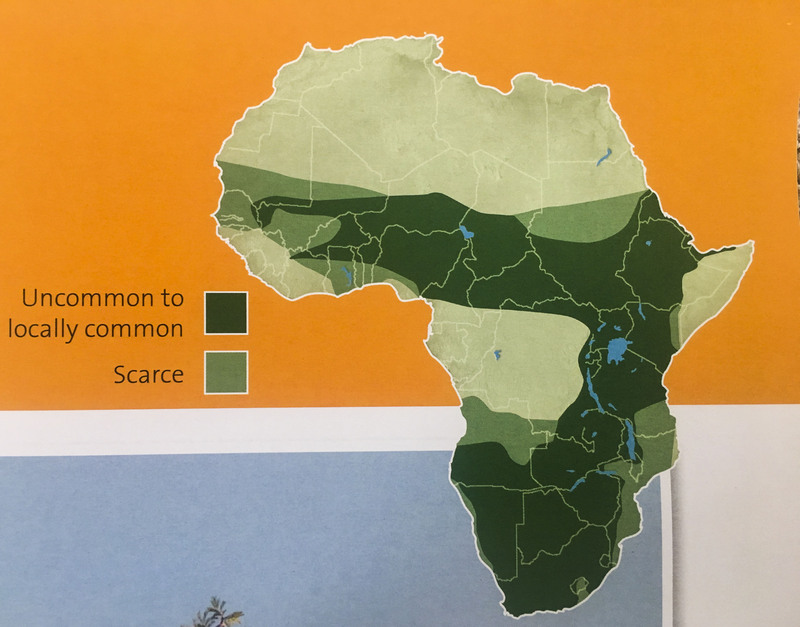 Nice because it is one of the most sparsely populated countries in the world, with just 2,3m people at an average density of 3 people per square kilometre, and the vast majority are inherently friendly, decent people. 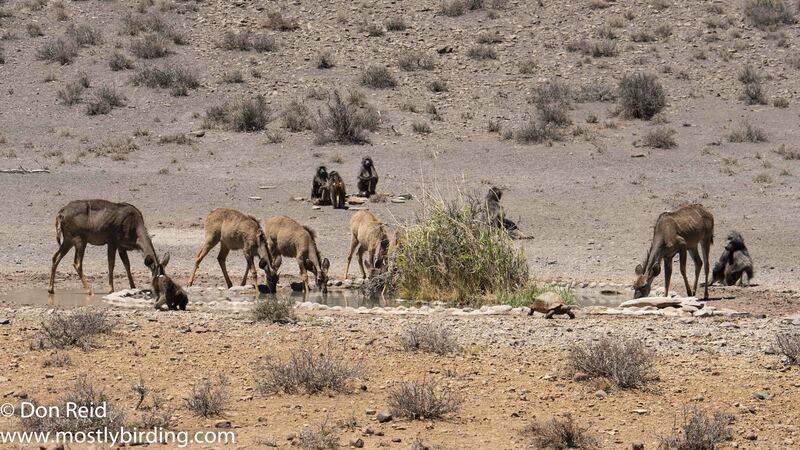 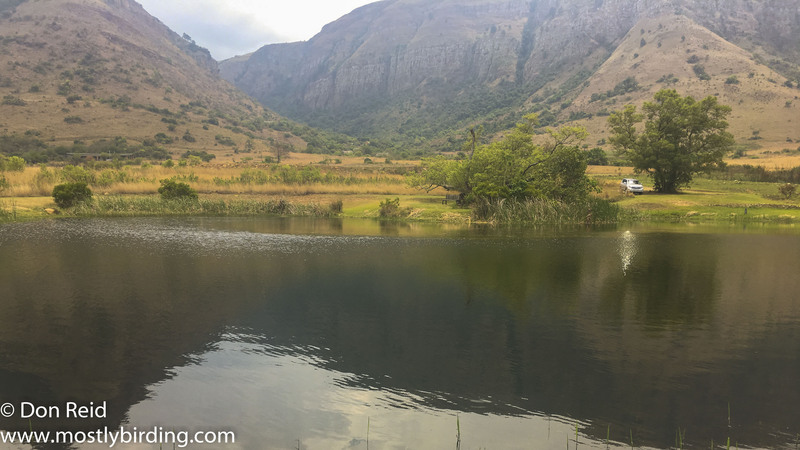 The country is blessed with large tracts of unspoilt wilderness where you will find some of the last vestiges of the Africa that existed before human interference made its mark. 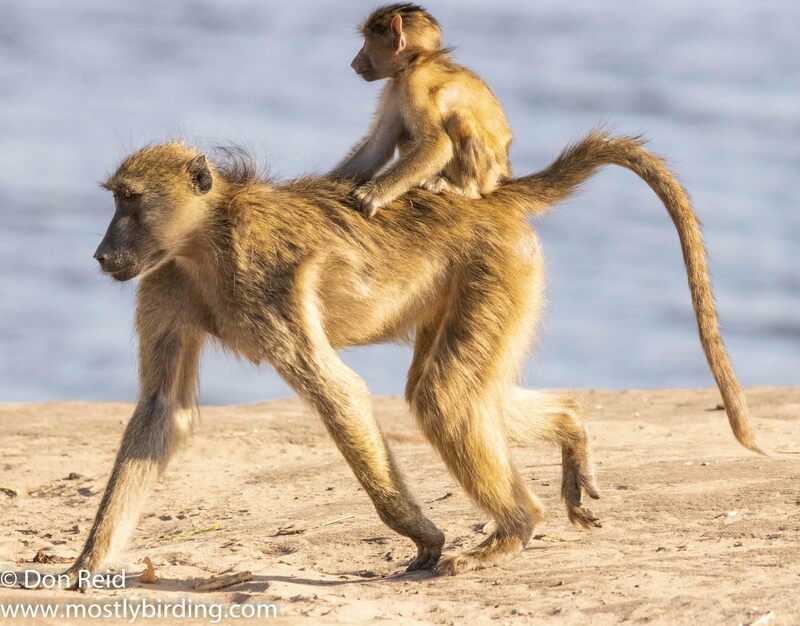 My involvement in the Kasane Airport project, now complete and functioning well, meant I spent an accumulative 60 days or more in Kasane during monthly visits spread over 3 years and I used every opportunity to spend free time in Chobe Game Reserve and on the Chobe River, soaking up the incomparable African game-viewing and bird-watching on offer. 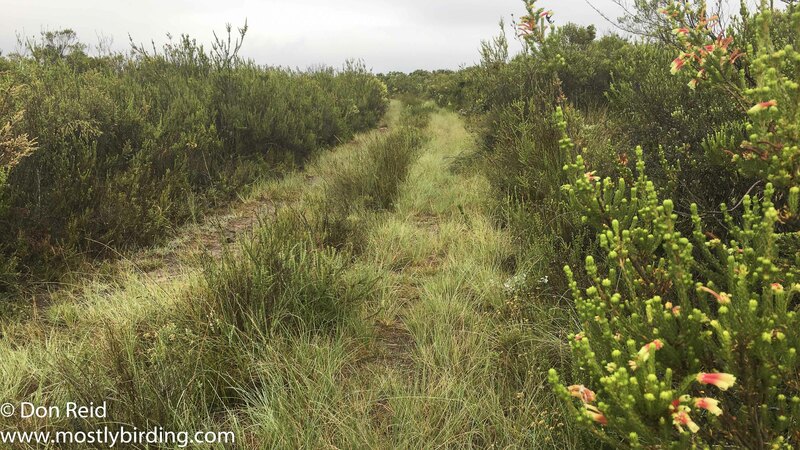 So where is this leading? 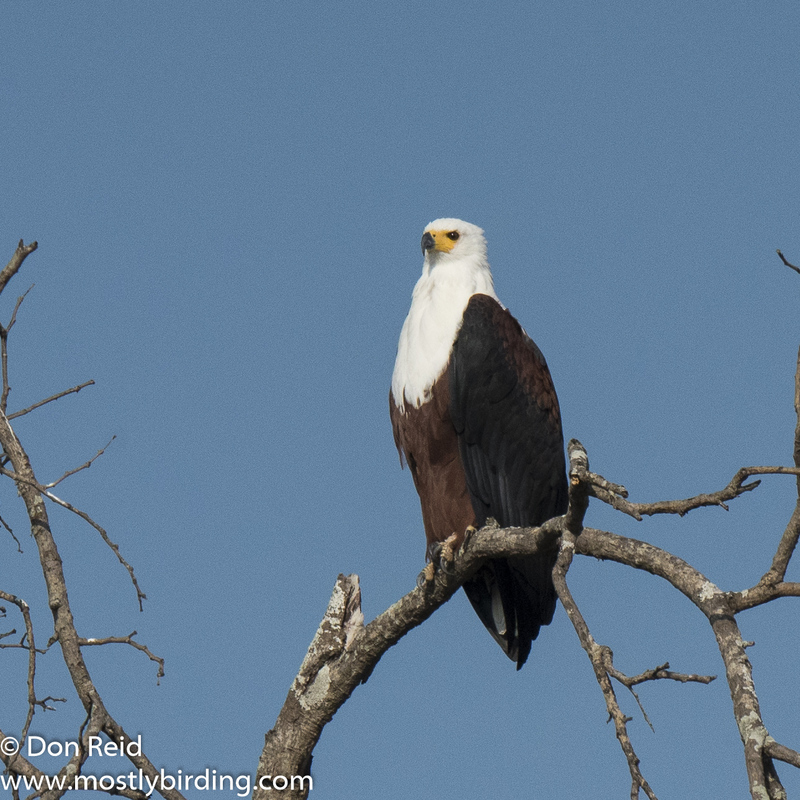 Well, I made what is likely to be my last visit to Kasane in November 2018, during which I joined a “farewell” photographic safari both on land and on the river, which left me with a head full of special memories and a memory card full of treasured images. 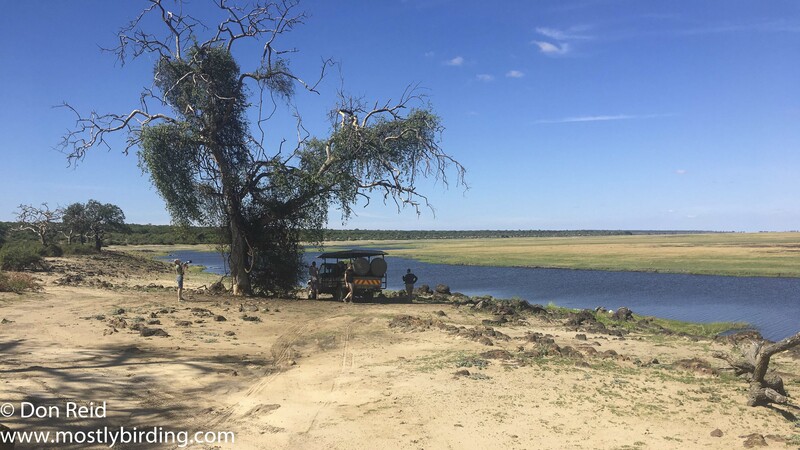 Leaving Chobe Game Reserve after the game drive that morning along the familiar sandy, bumpy track, through the Sedudu gate and out on to the tar road back to Kasane, it momentarily struck me that this was possibly the last time I would see this place and an almost tangible sadness washed over me for a few seconds, only to be replaced with the happy thought of all the memories I had gathered over more than 3 years, memories that I would love to share in the best way I can. 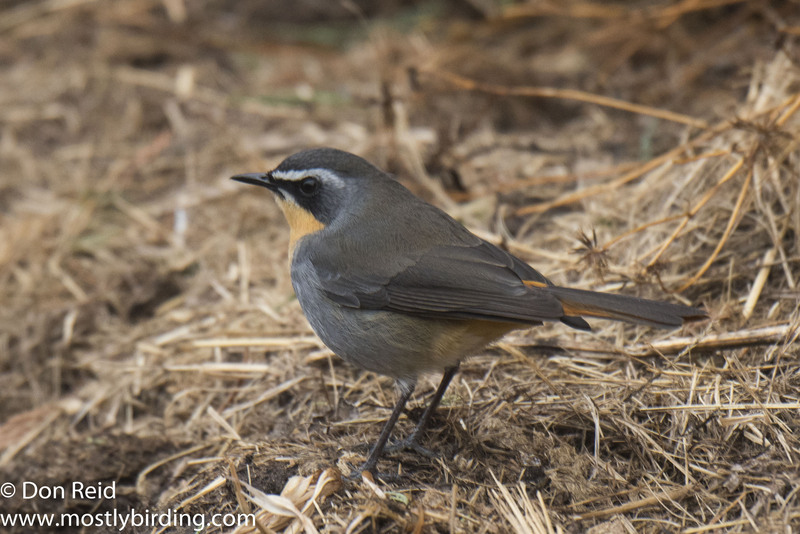 So here’s a synopsis of my birding activities during the last year along with photos of a few of the species encountered and places visited. 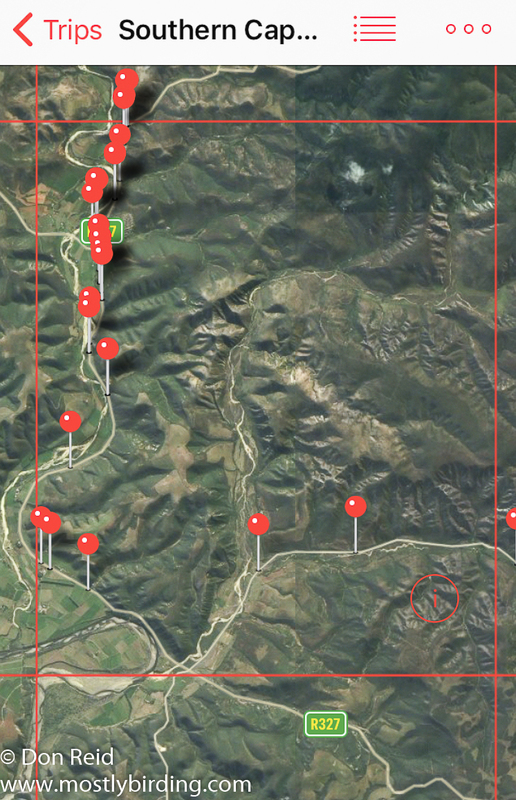 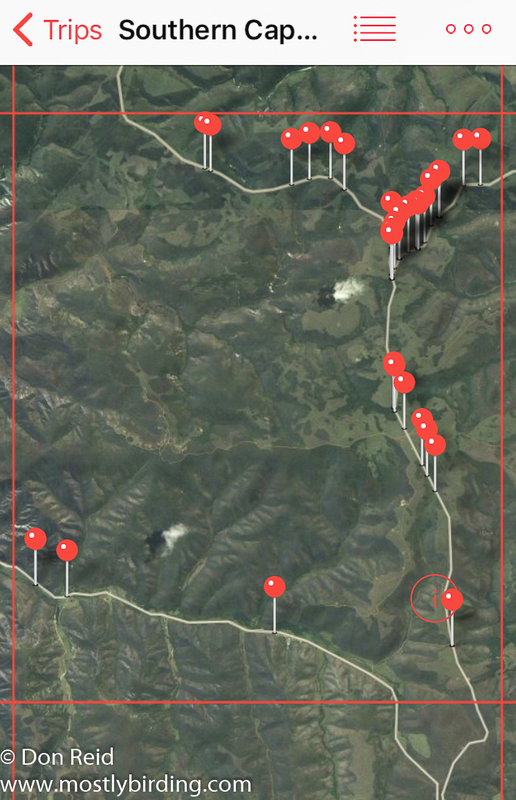 Some of the trips are covered in separate posts in a lot more detail. 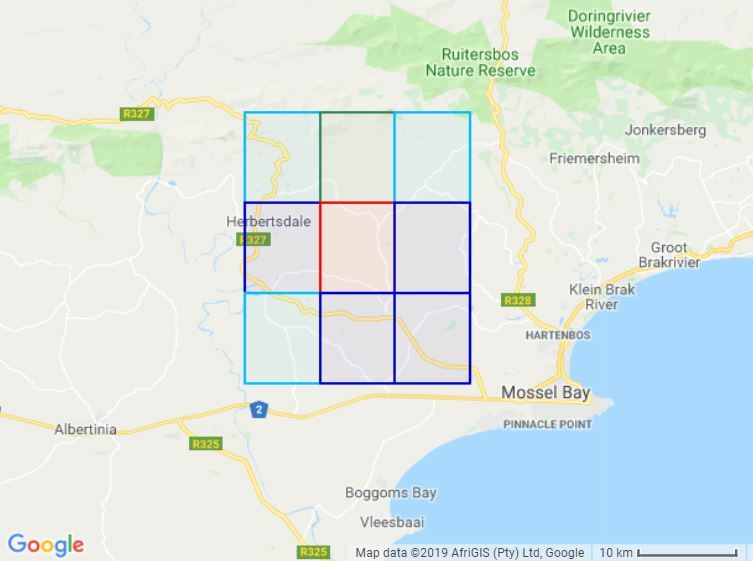 Mossel Bay is our home over the holiday season up to the third week in January, so I try to use this time to fit in as much atlasing as I can in the beautiful surrounding countryside. 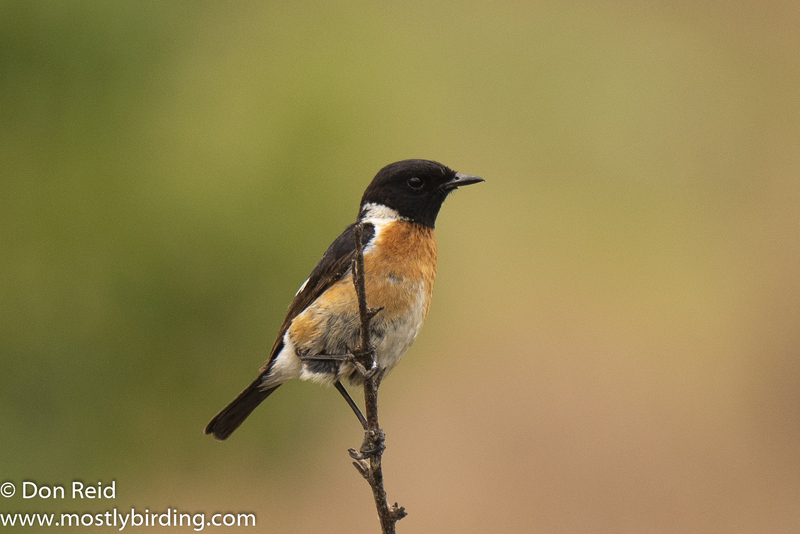 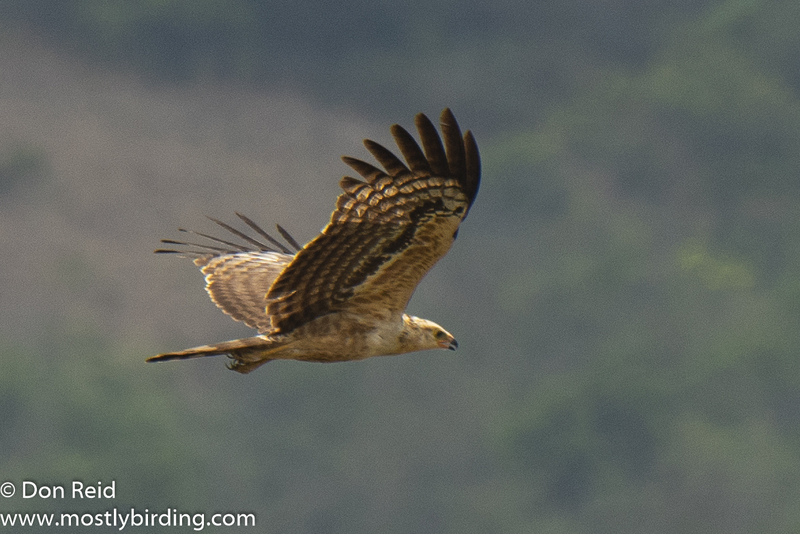 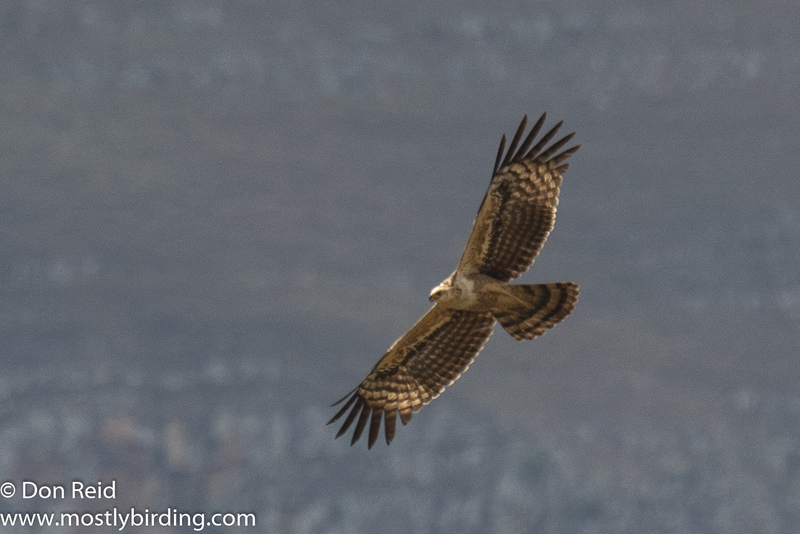 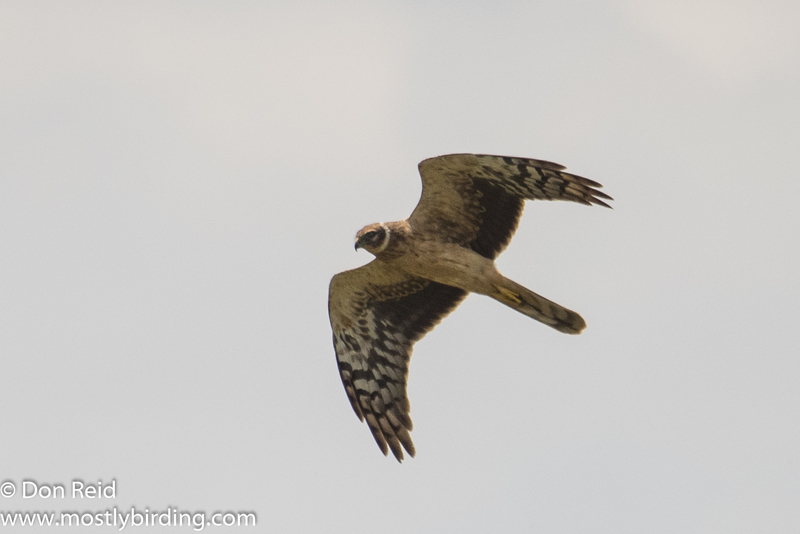 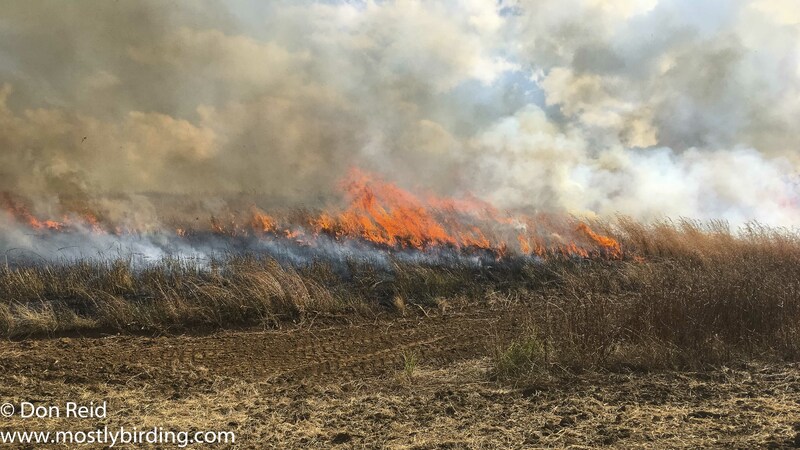 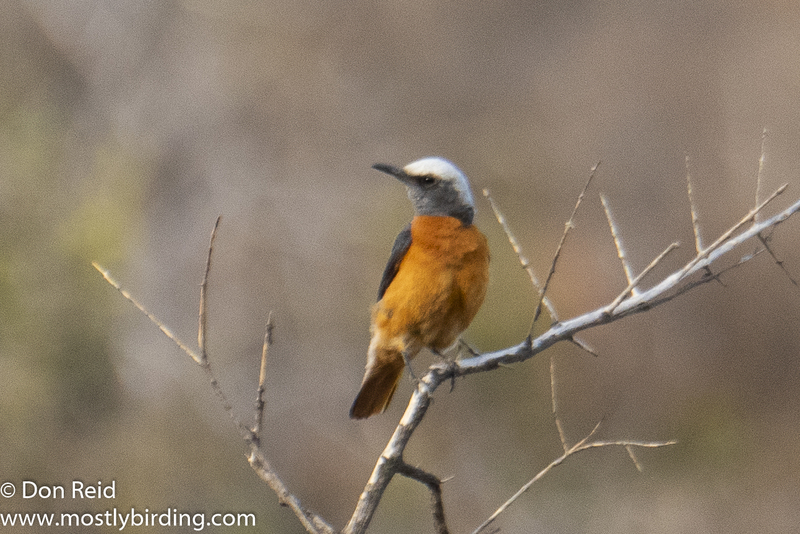 Back in Pretoria I could catch up on some highveld atlasing with a visit to Mabusa nature reserve along with Koos Pauw – an outstanding day with both Pallid and Montagu’s Harriers seen and Great Reed Warbler heard. 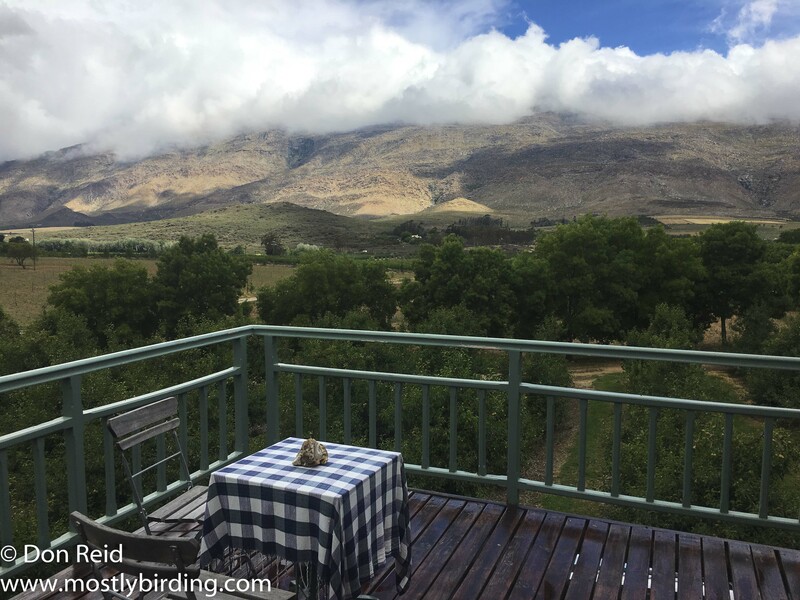 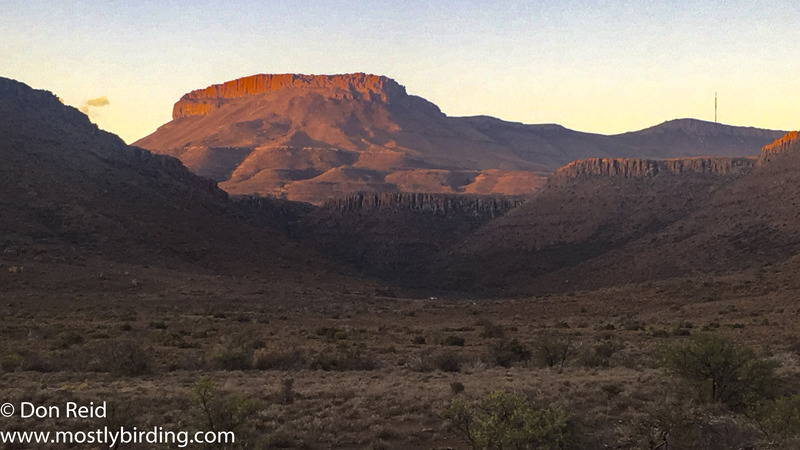 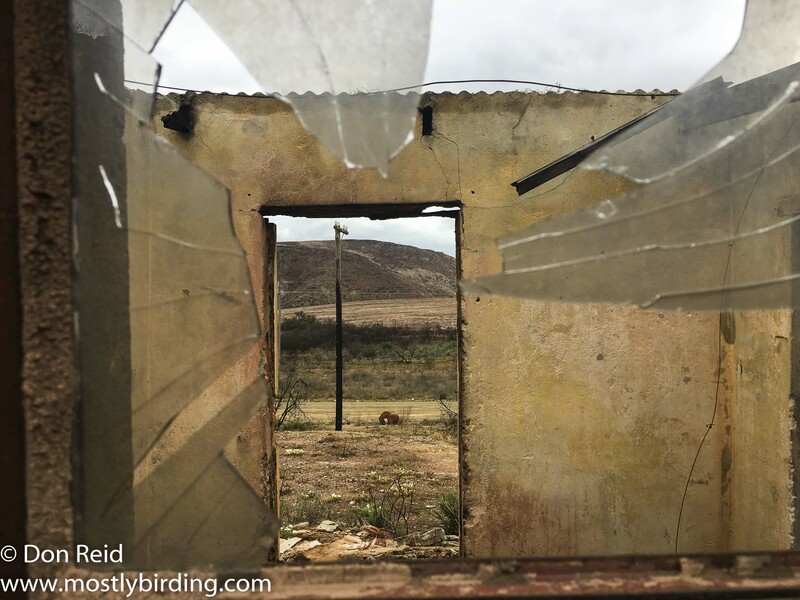 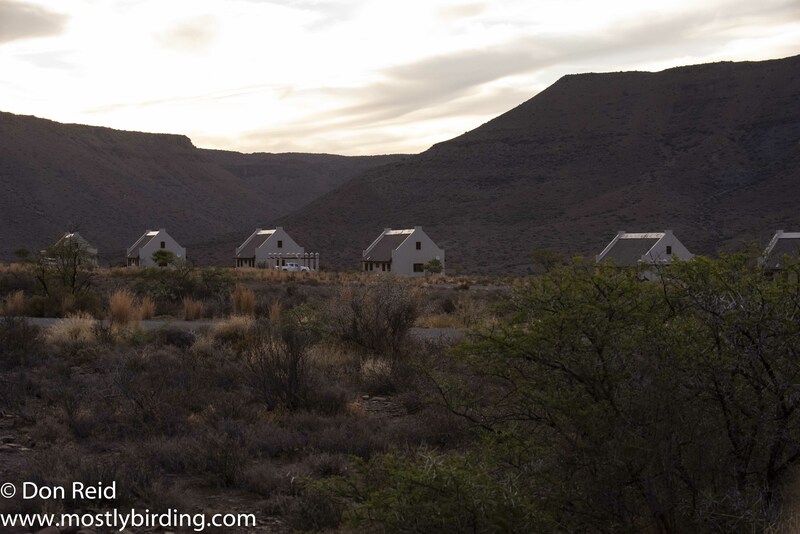 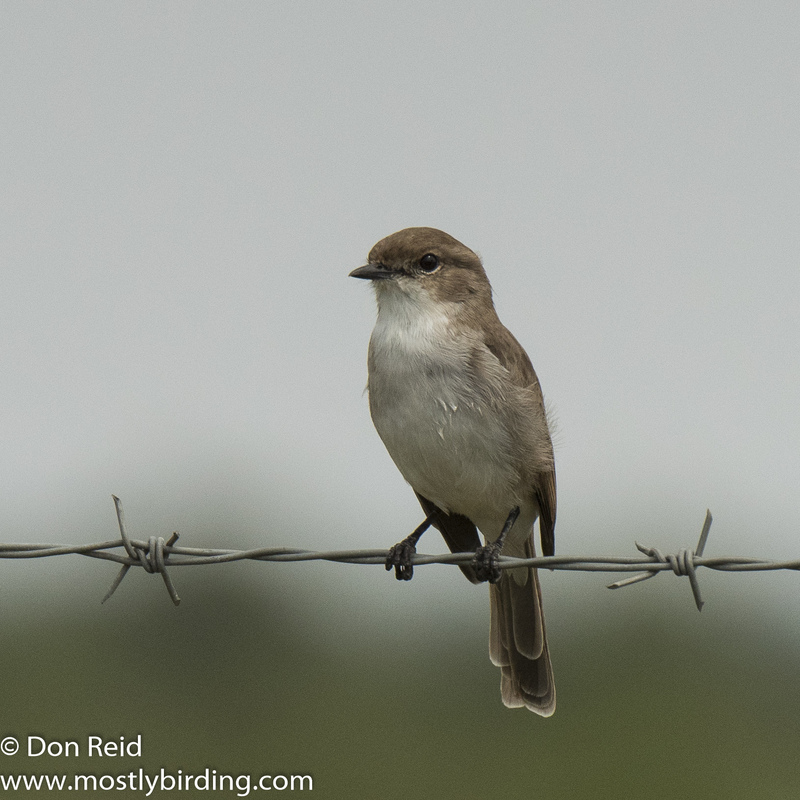 The following weekend we visited family on Annasrust farm in the Free State near Hoopstad – one of the highlights of our year and a superb birding spot in its own right. 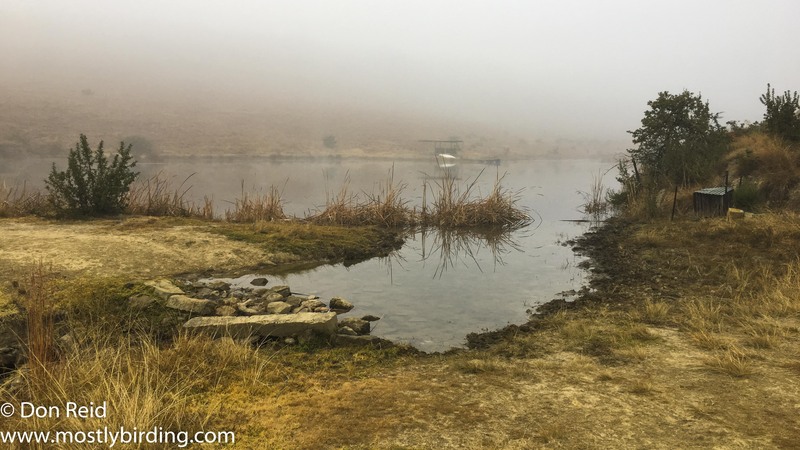 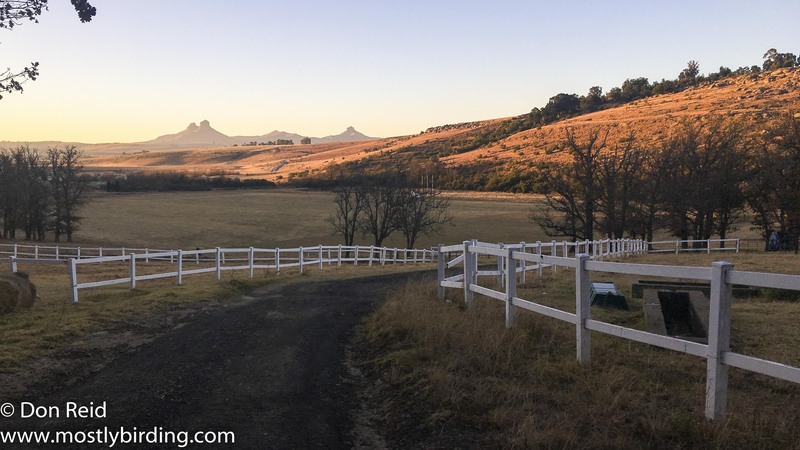 We took up Gerda’s Vryheid family’s invitation to stop over on their farm near the town on our way back – a worthwhile detour if there ever was one! 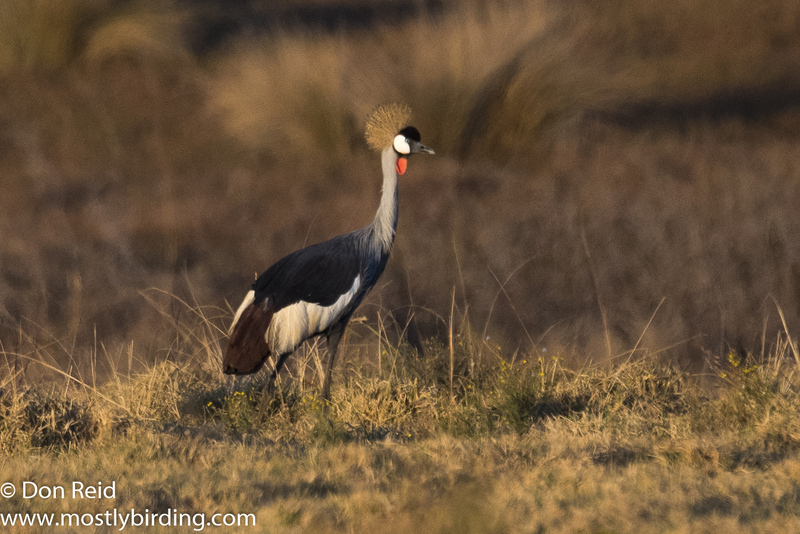 A pair of Crowned Cranes made the visit really special, although Anlia’s breakfast krummelpap (a coarse farm porridge) was a serious competitor for “best reason to visit”. 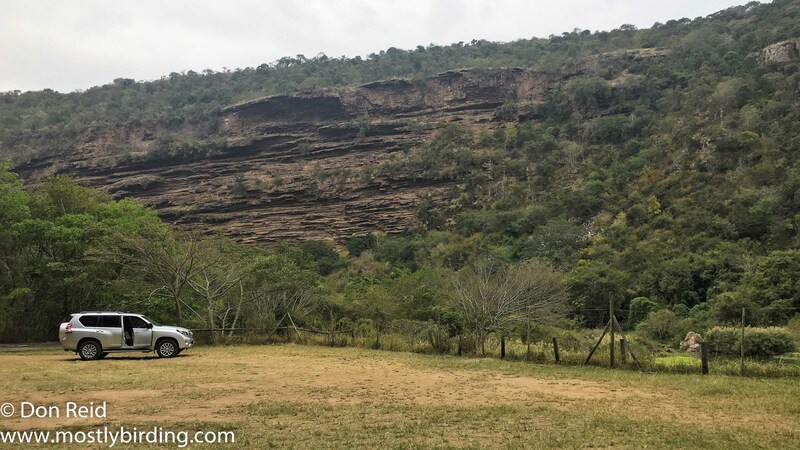 Mid-winter atlasing trips around Gauteng kept me sharp during August, despite cold (- 3 deg C at one stage), windy conditions that kept me mostly in my car. 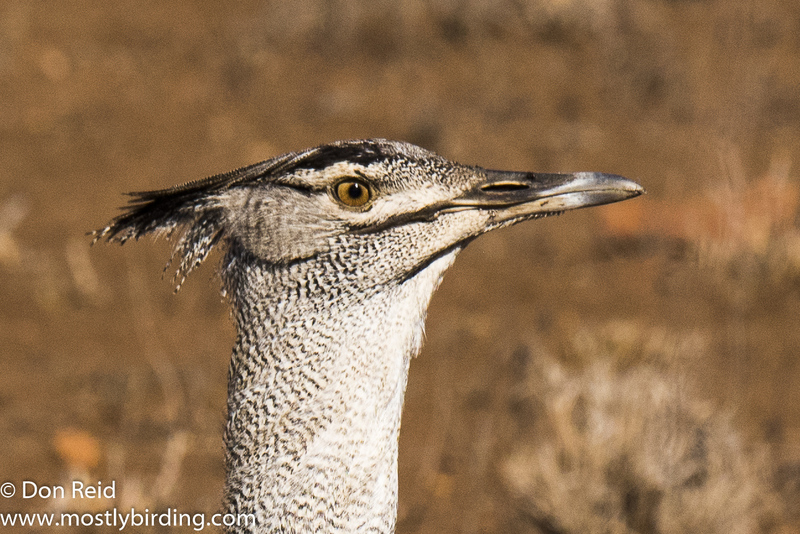 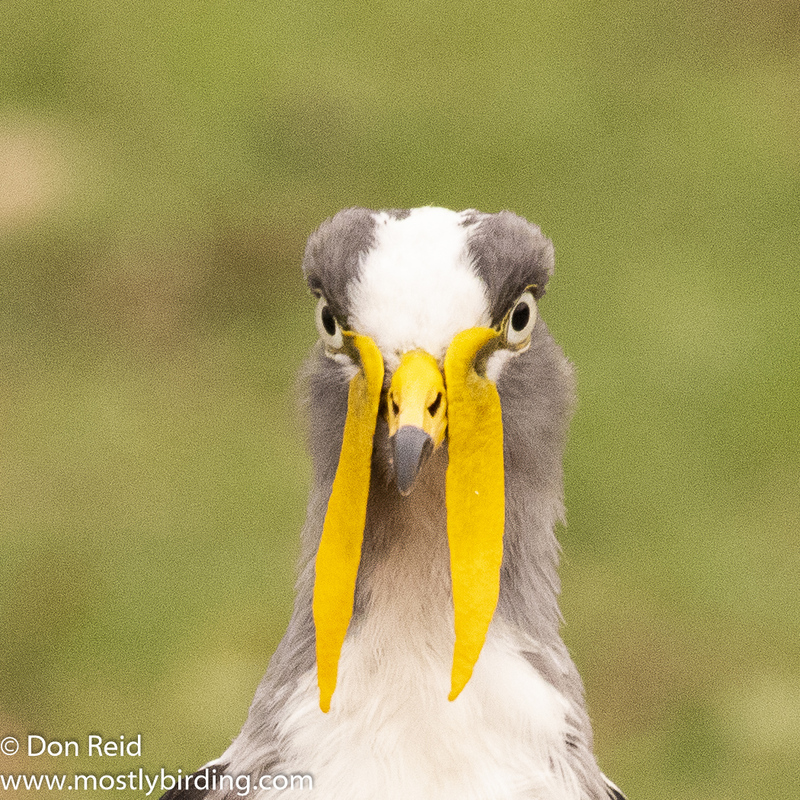 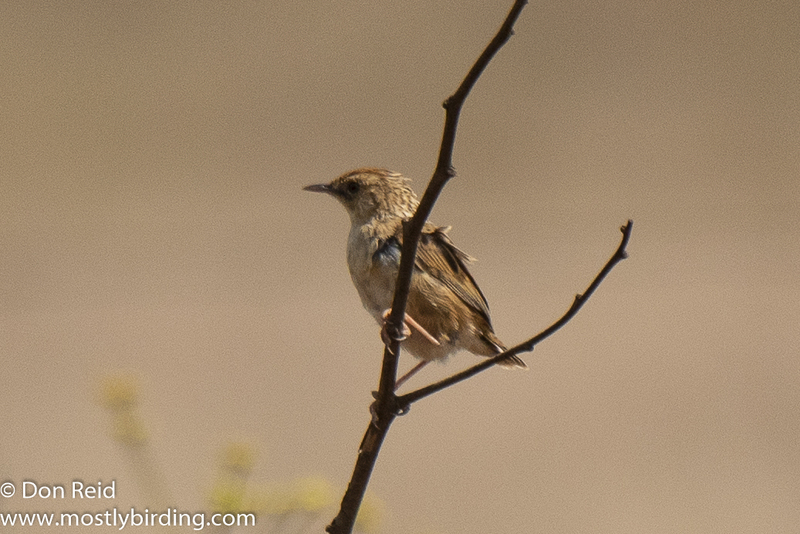 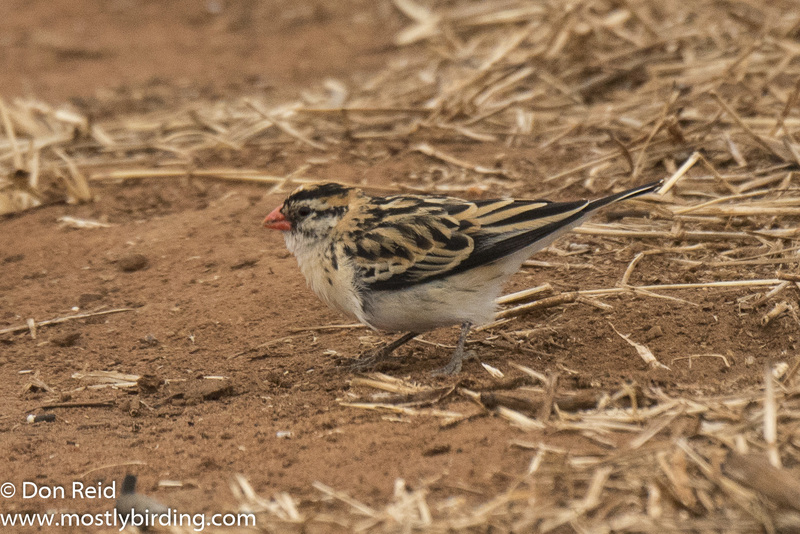 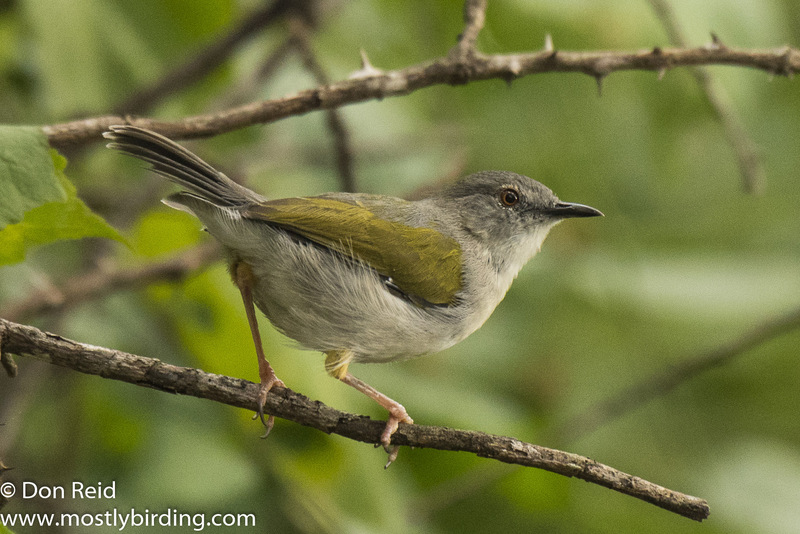 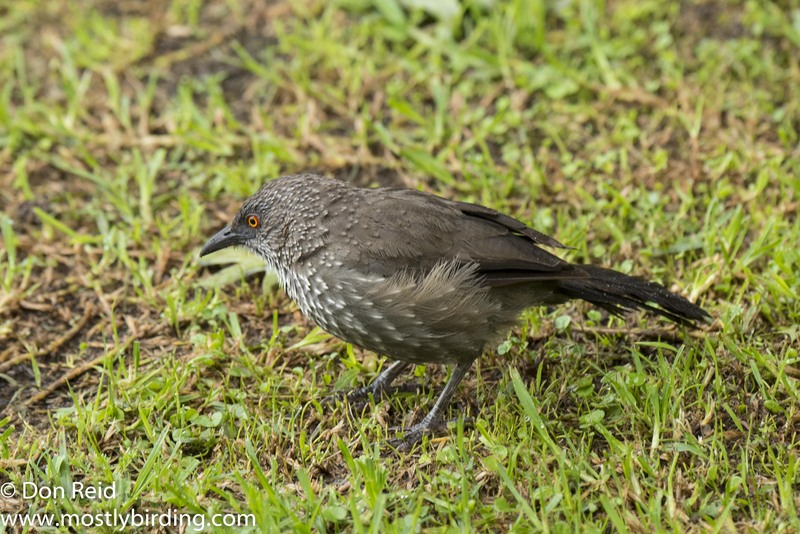 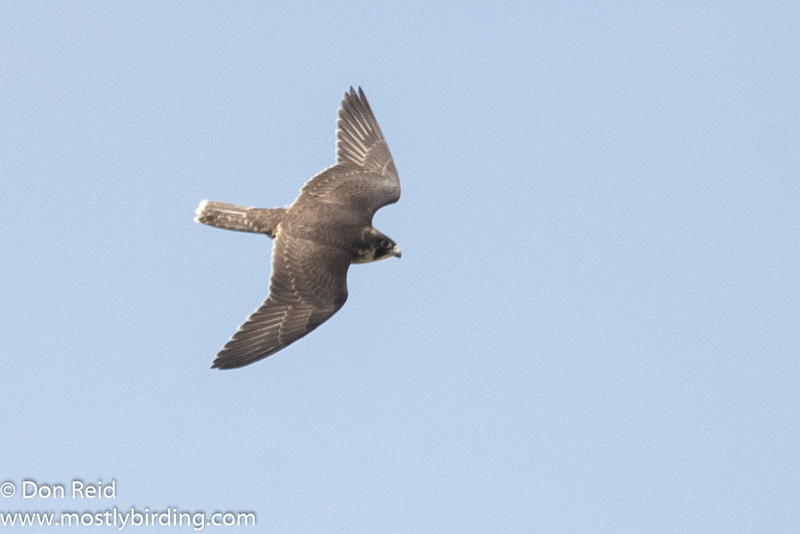 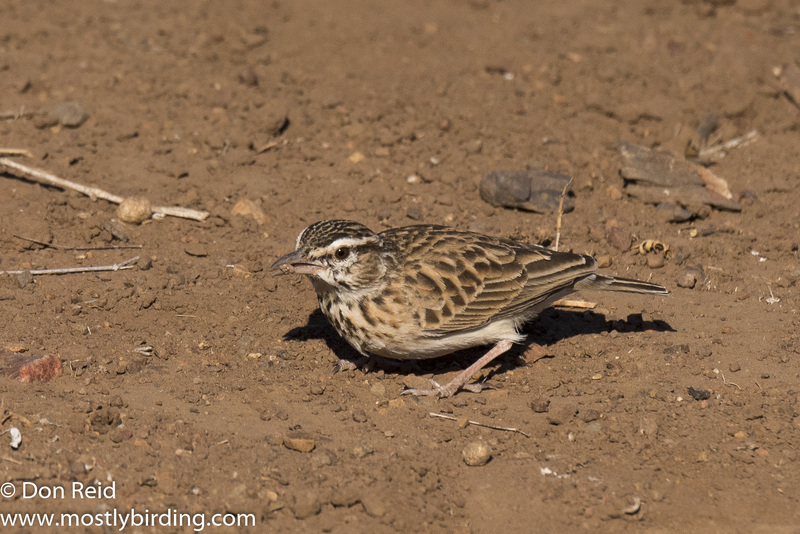 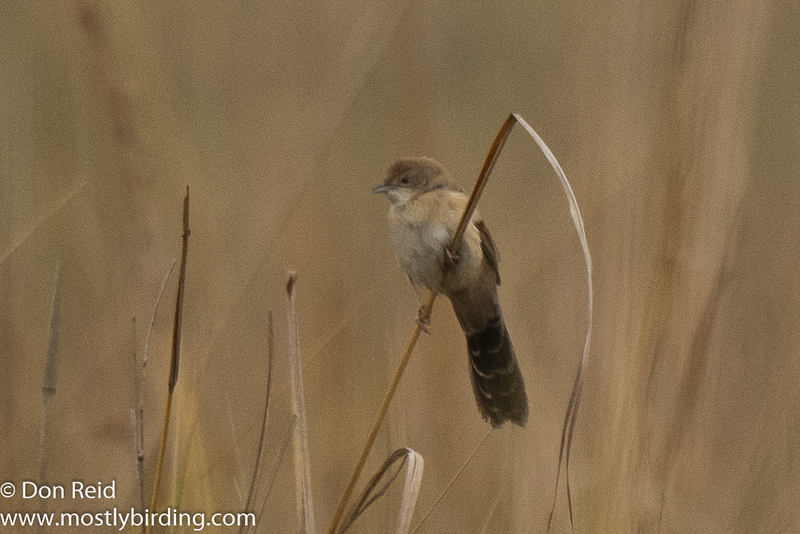 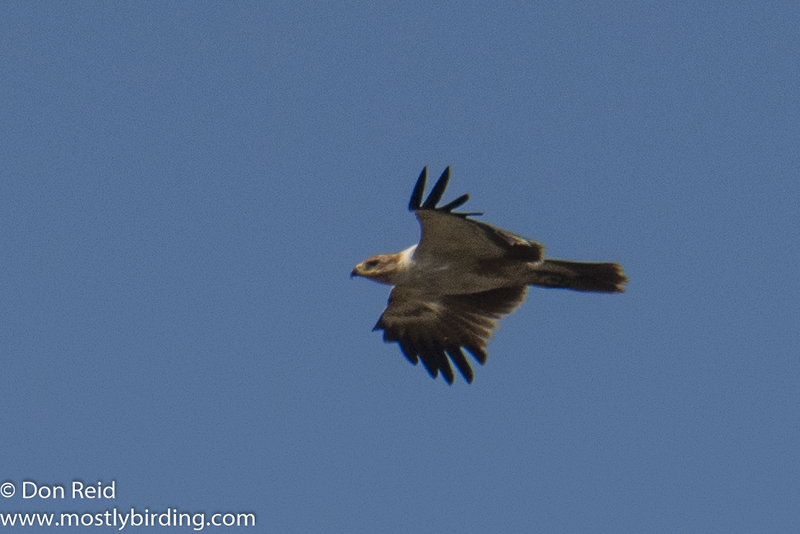 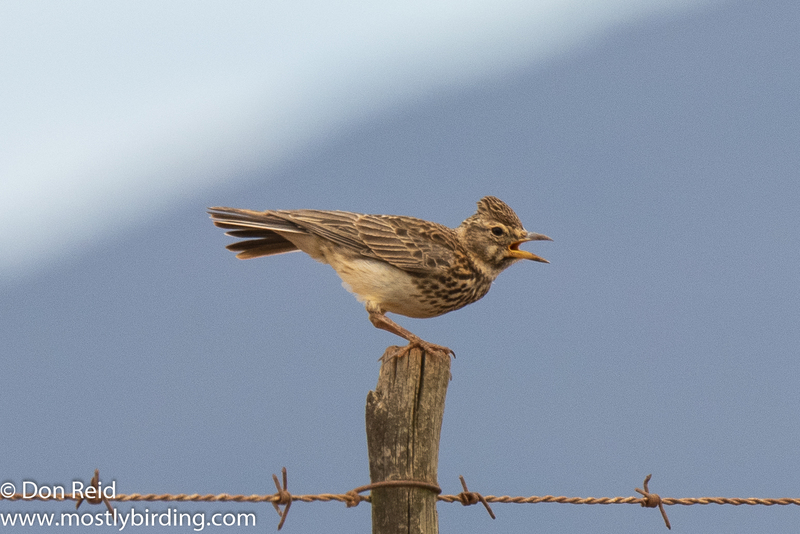 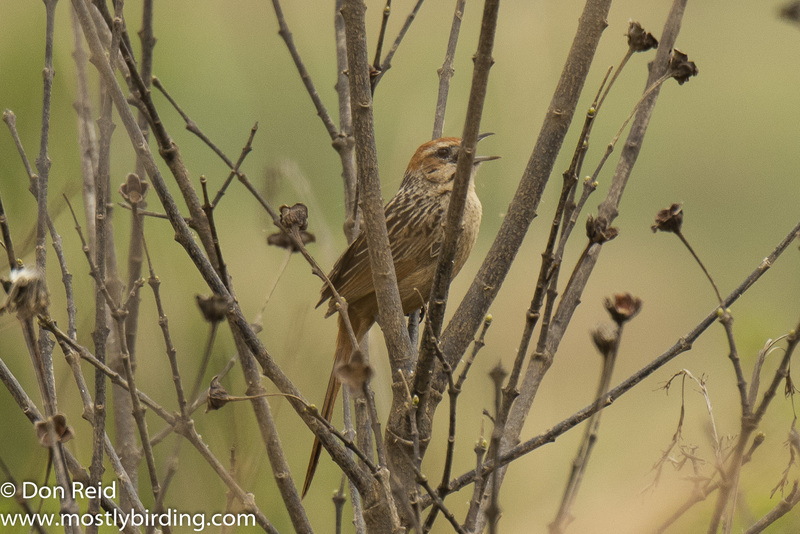 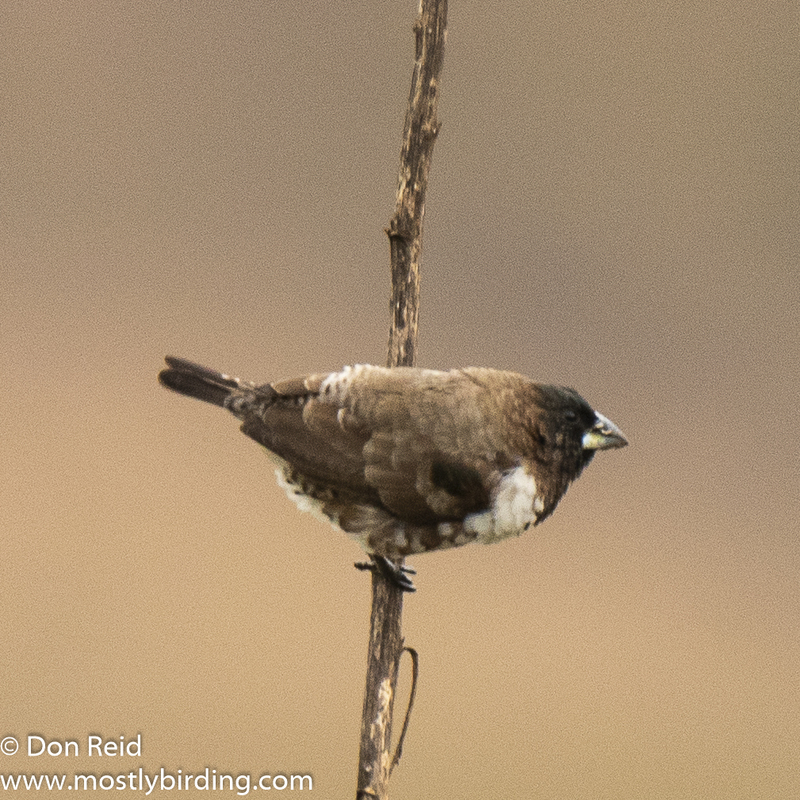 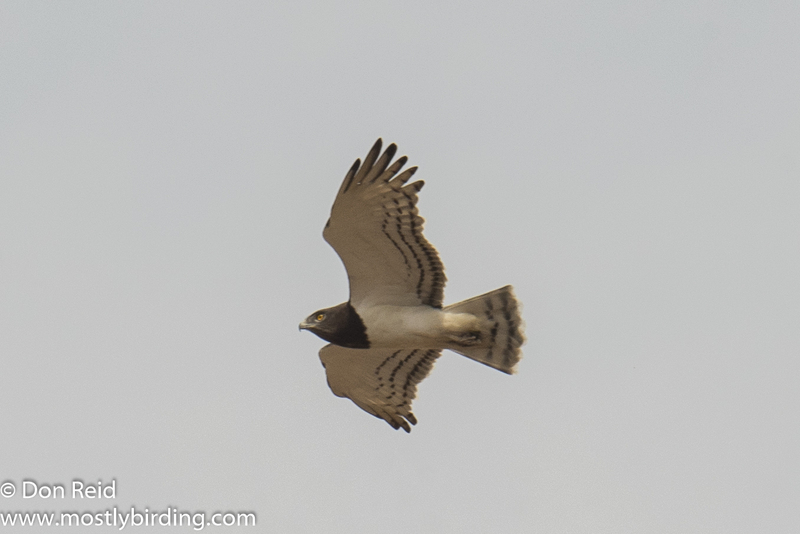 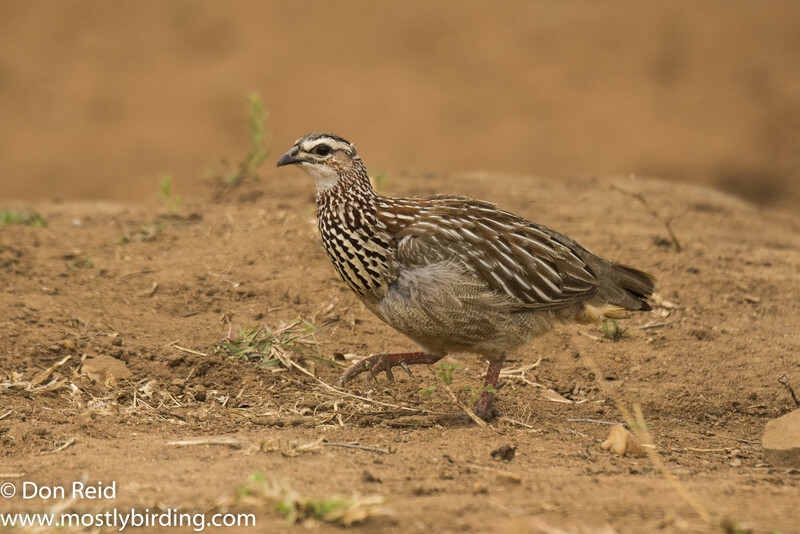 Spike-heeled Larks were a feature of both trips, while African Harrier-Hawk was an exciting find. 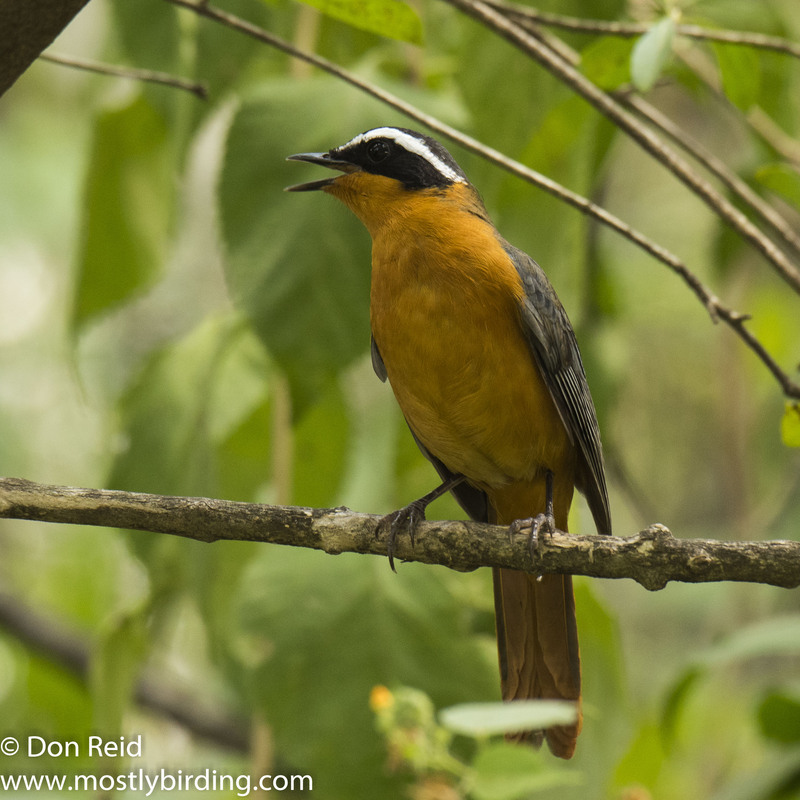 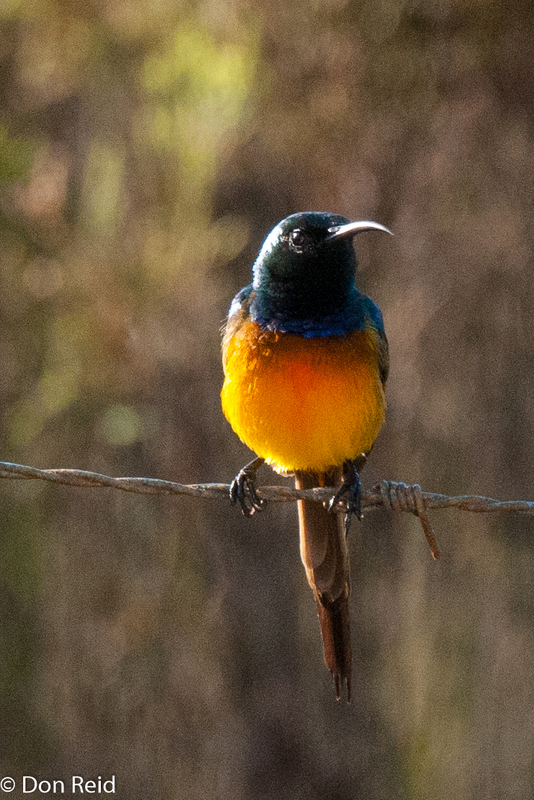 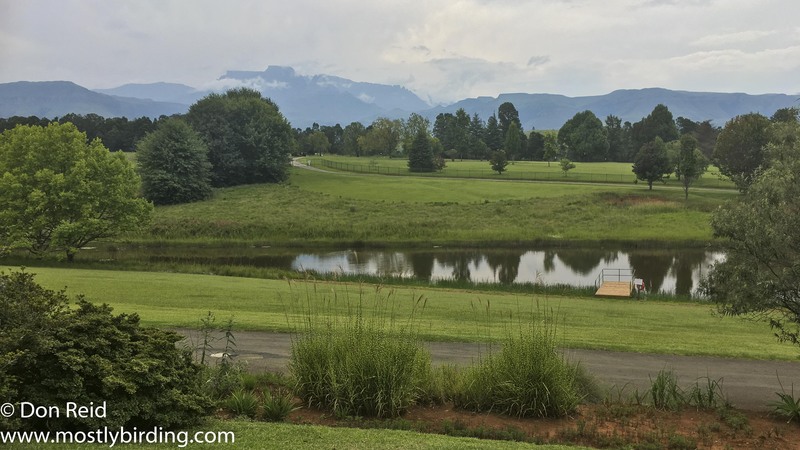 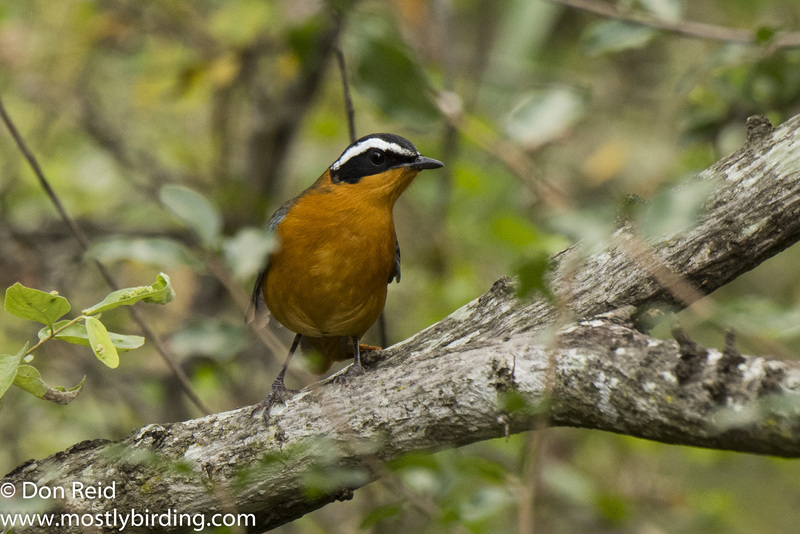 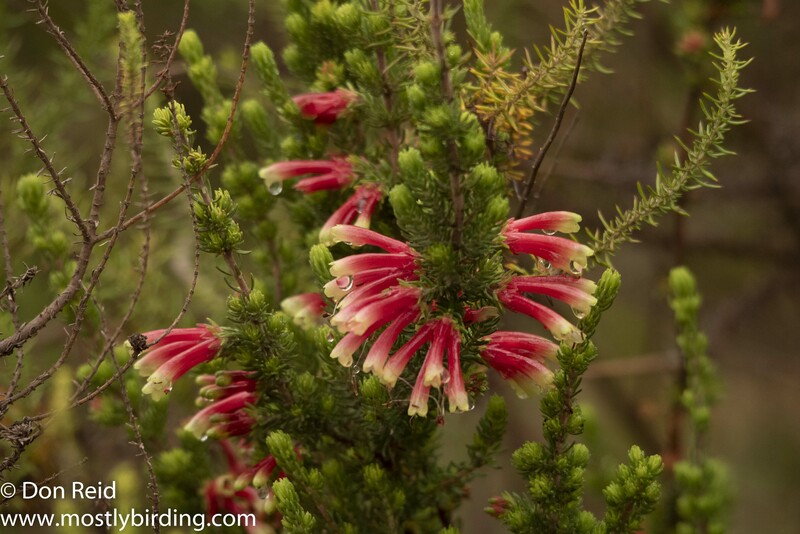 Time for our timeshare week at our favourite get away – Verlorenkloof, which produced fine birding once again and some interesting atlasing opportunities in the area. 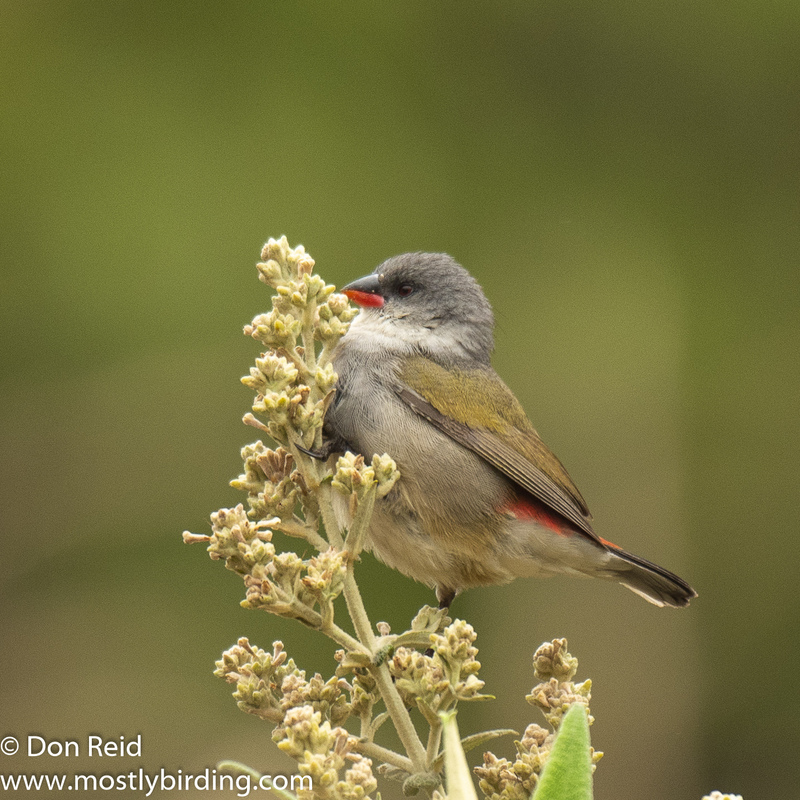 Back to the Cape in the last week of October for a short visit to Mossel Bay, followed by a quick visit to family in the western Cape town of Worcester, where I spent a morning enjoying the surprisingly good birding that was on offer in the adjoining hills. 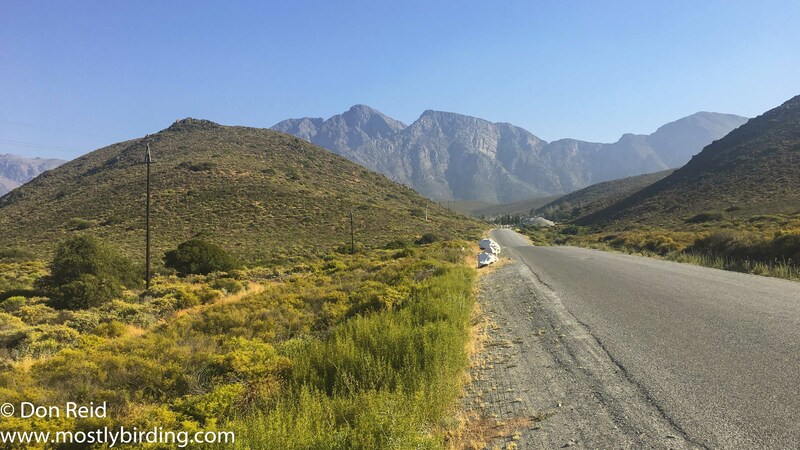 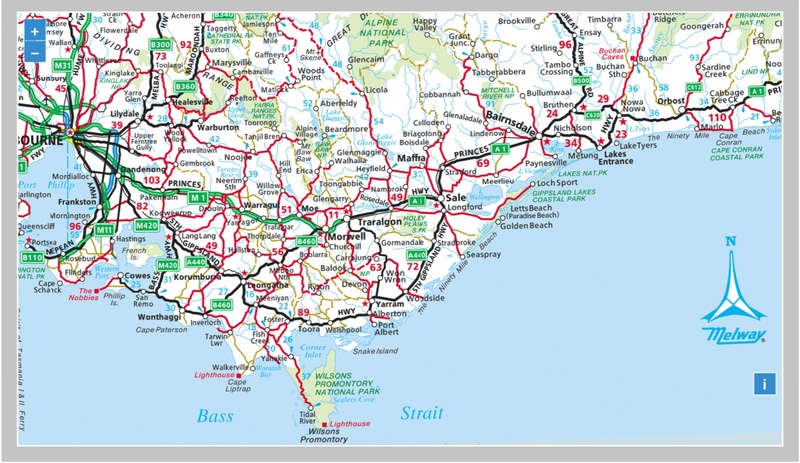 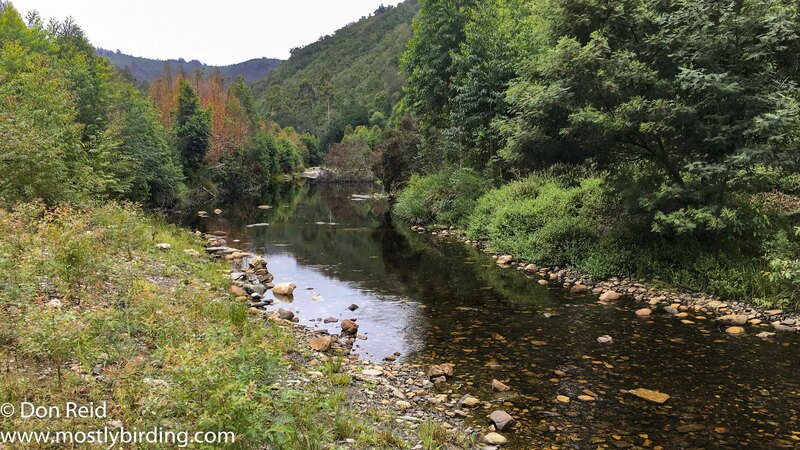 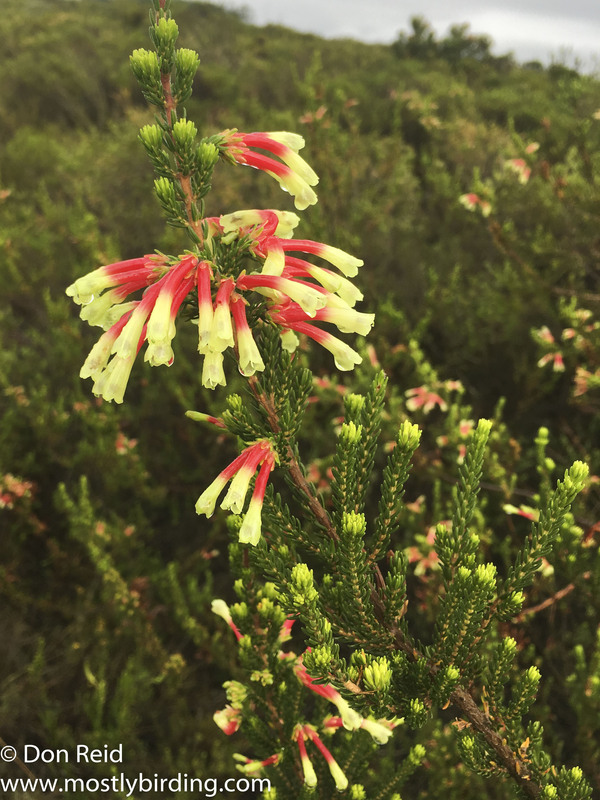 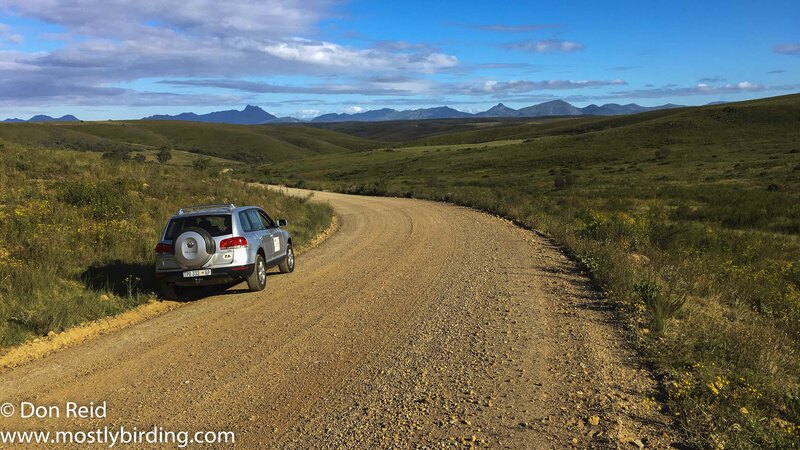 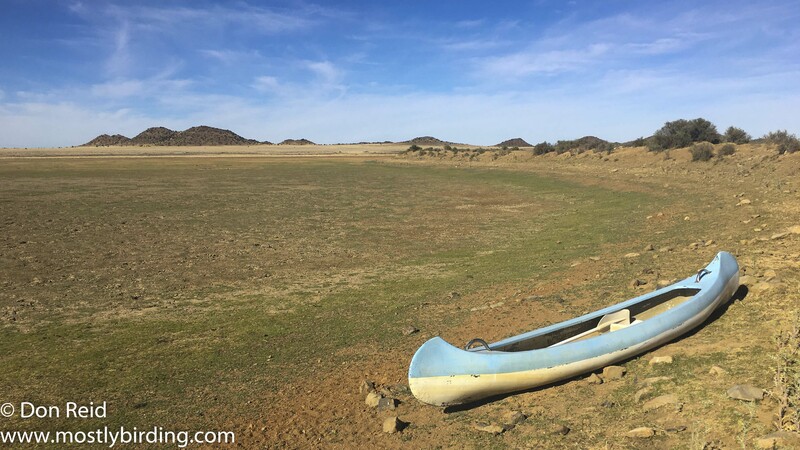 Further atlasing in the Mossel Bay area included trips to Herbertsdale and Gouritz River, before returning to Pretoria where we prepared for our return to Mossel Bay for a longer stay over December and January, as has become our custom over the last few years. 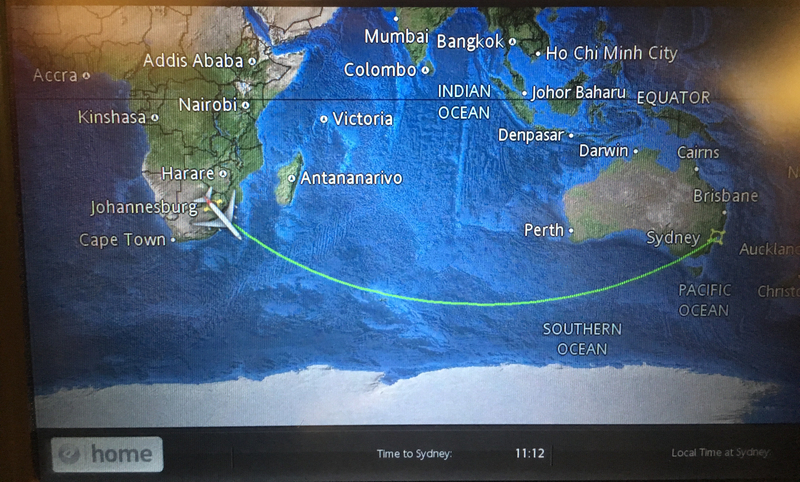 The following week saw me returning by air to Gauteng and onward to Kasane in northern Botswana for a final inspection visit to the airport project that I was involved in. 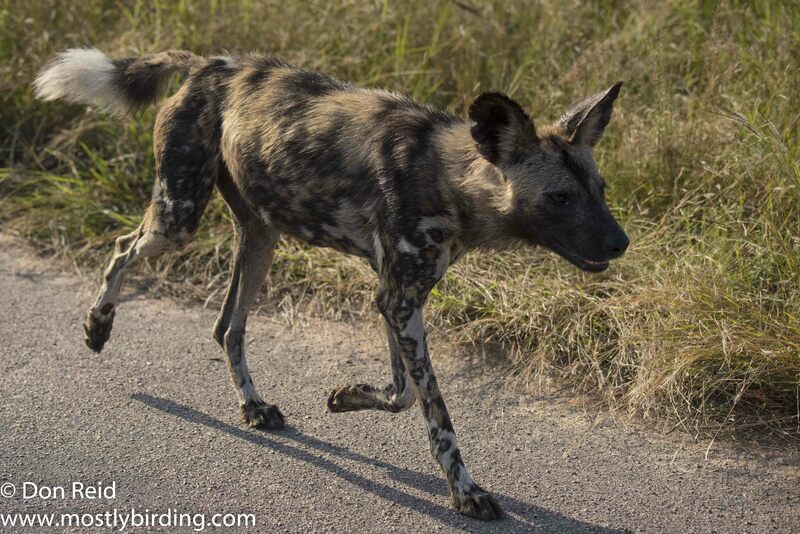 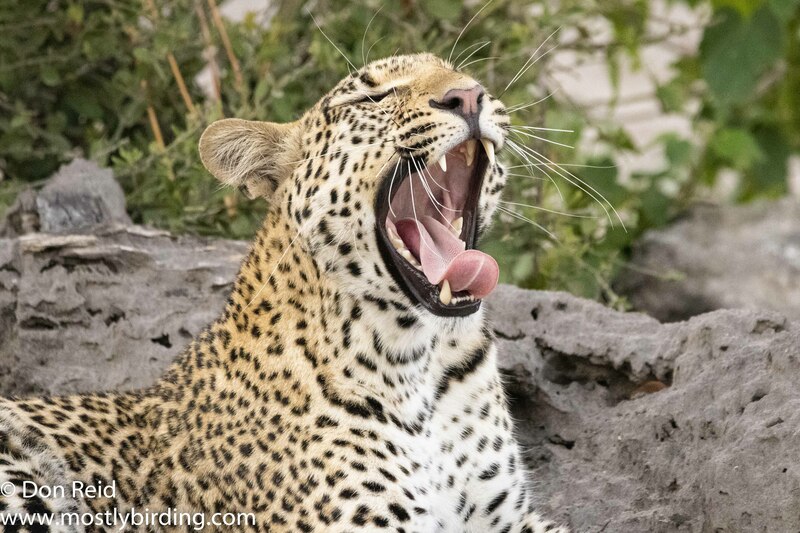 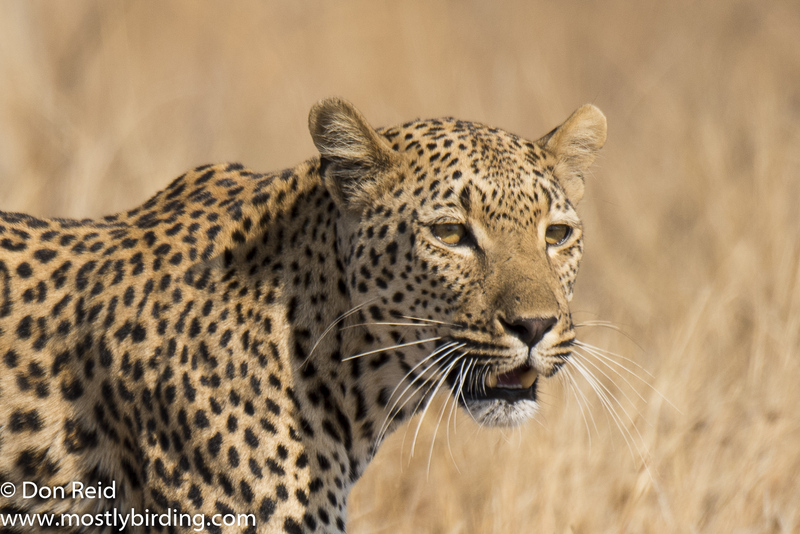 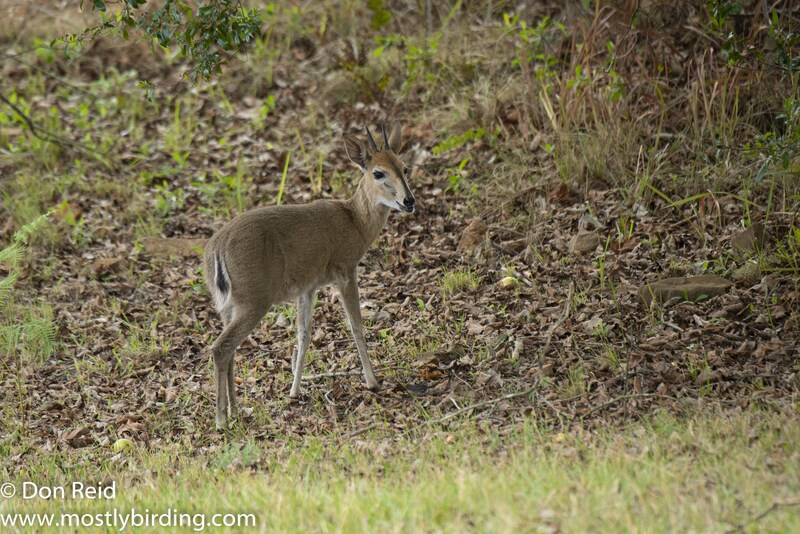 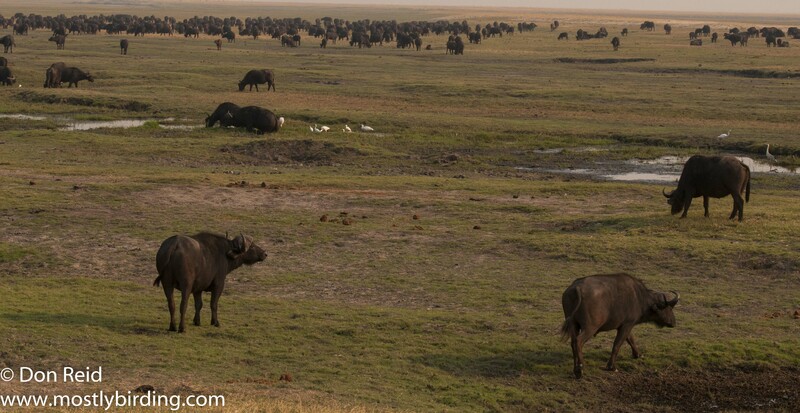 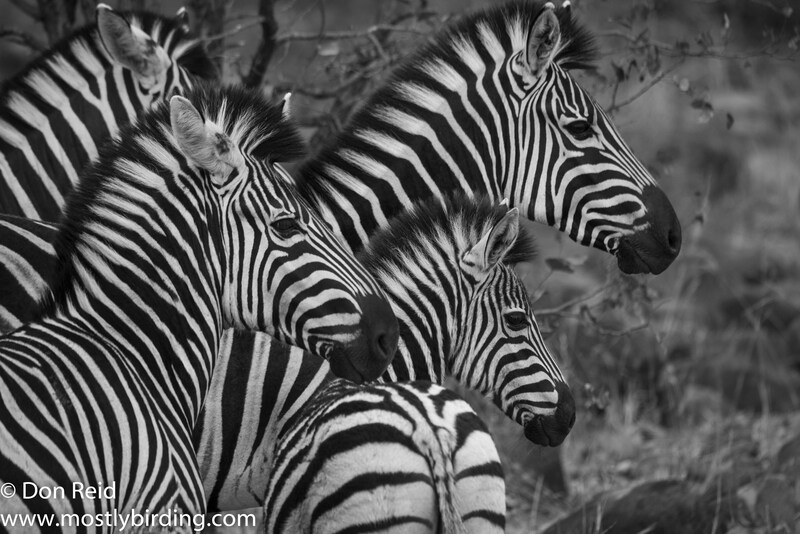 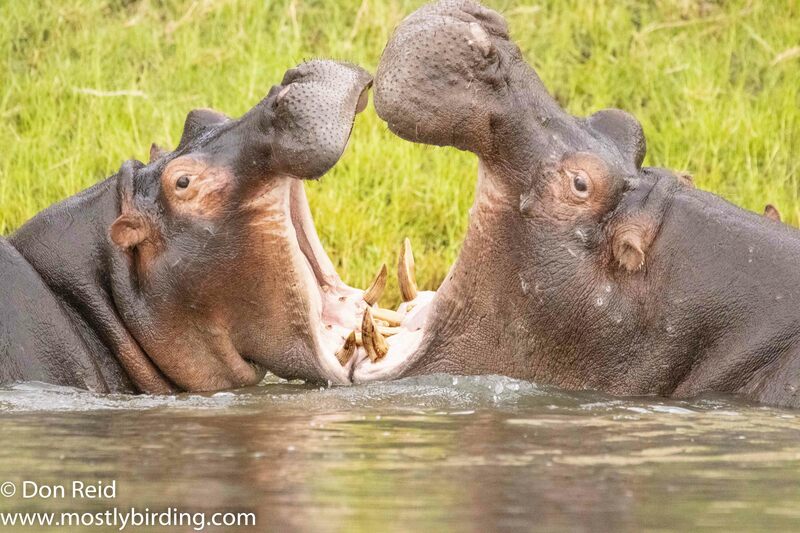 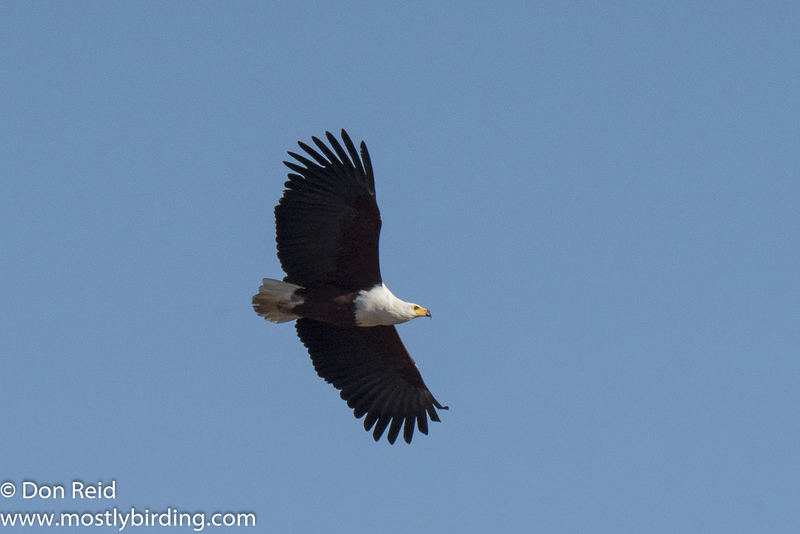 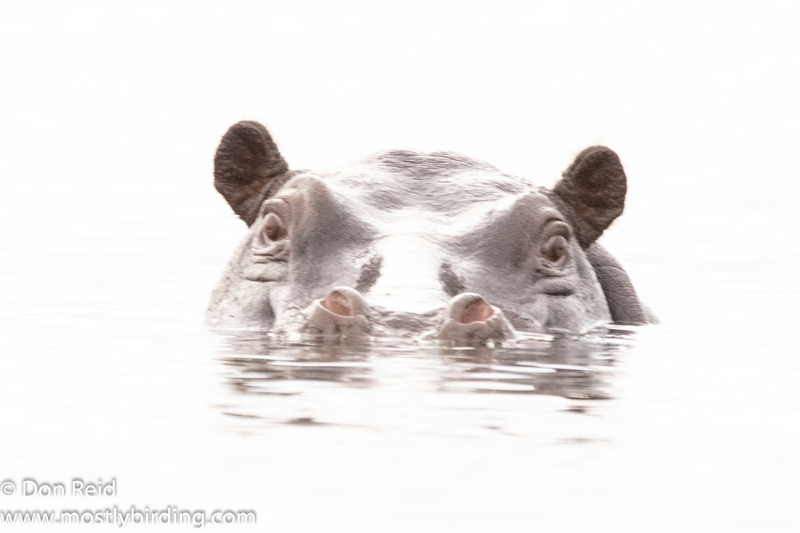 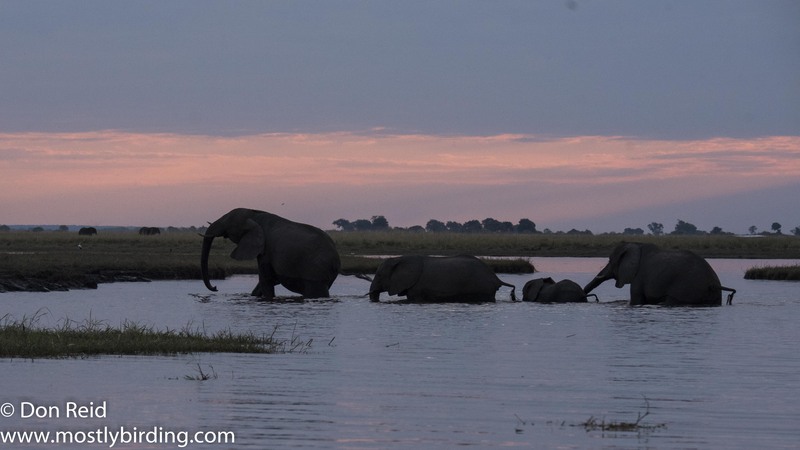 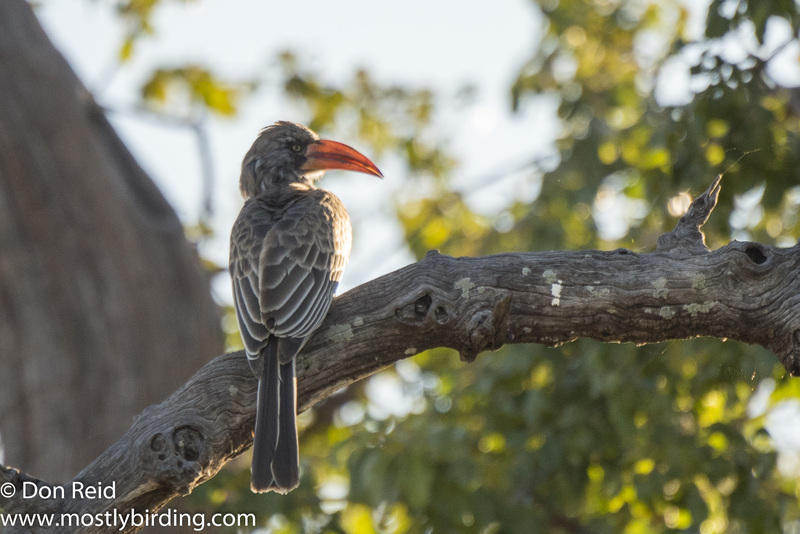 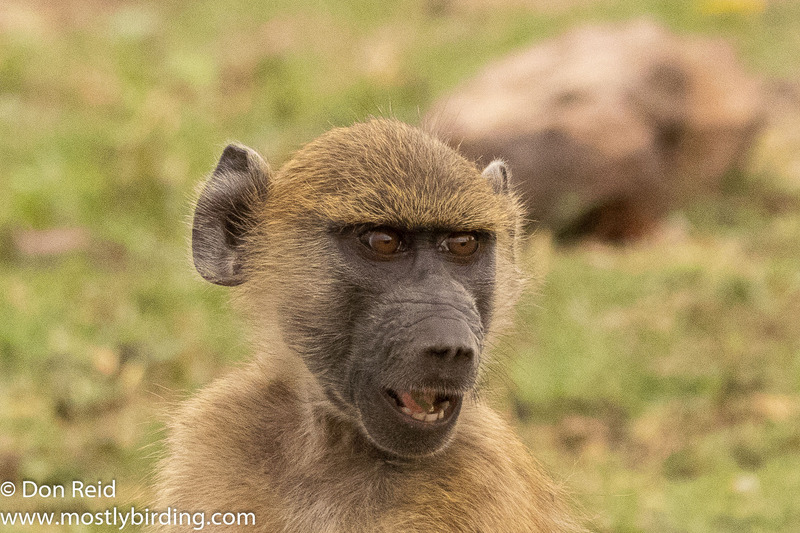 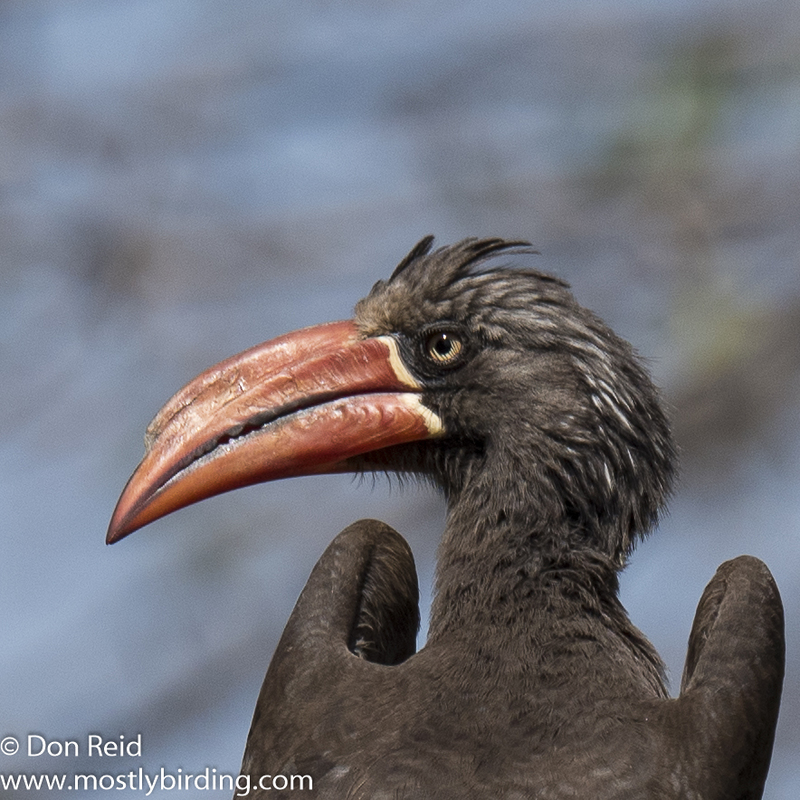 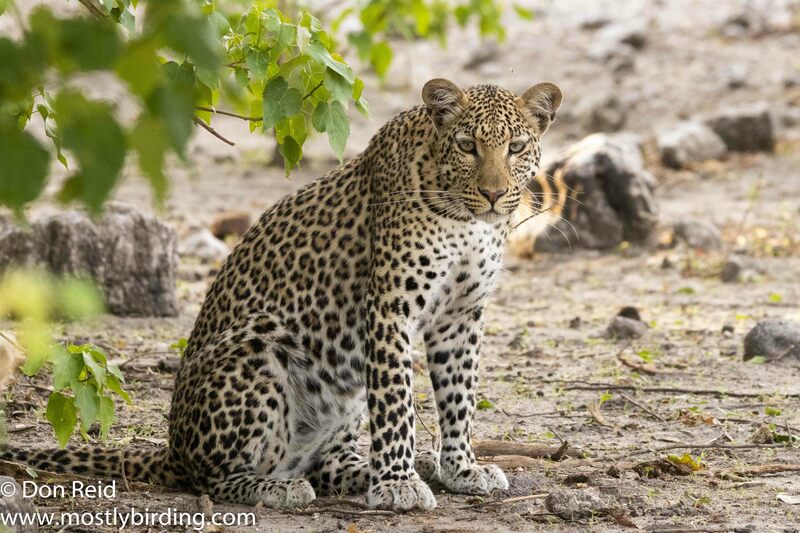 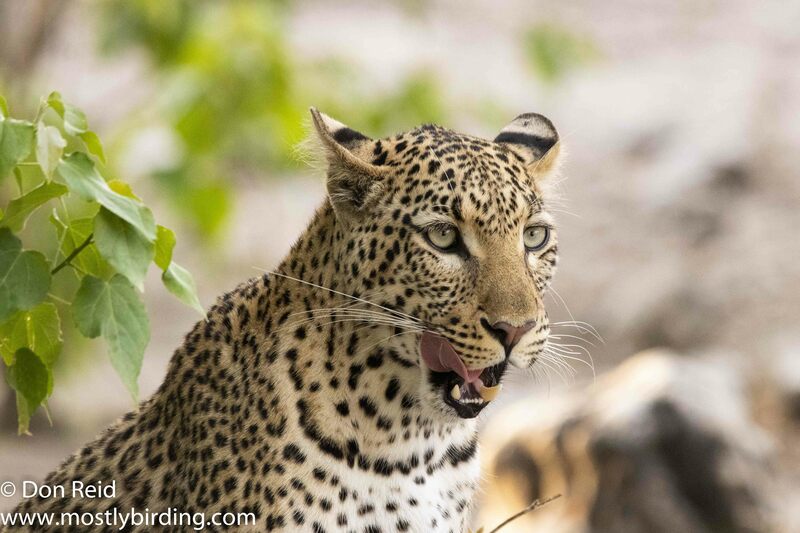 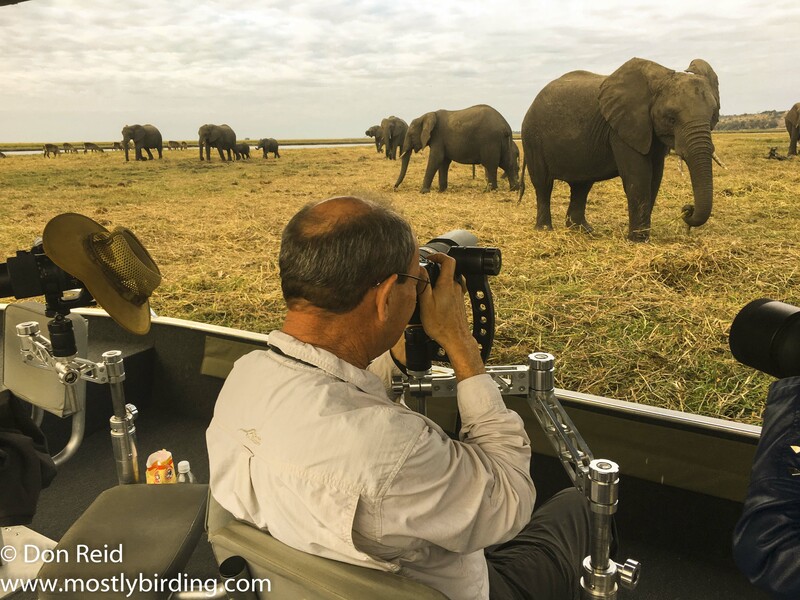 I booked a boat-based and vehicle-based game drive during my stay, in order to make the most of this last visit to Chobe game reserve, both of which provided some amazing sightings and photographic highlights. 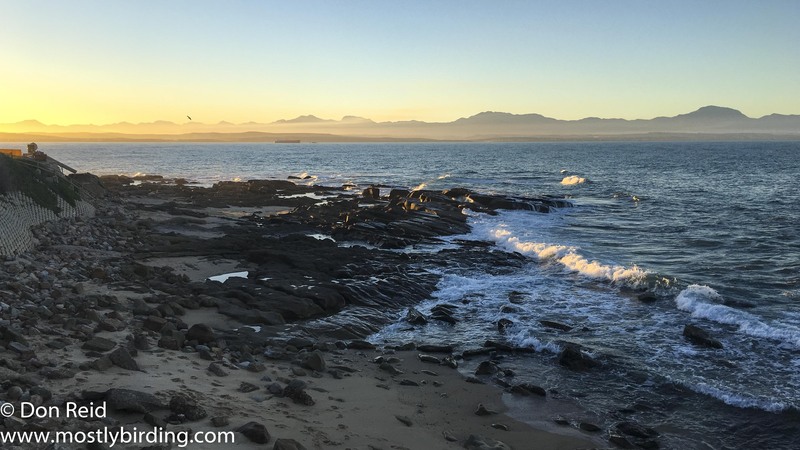 Back in Mossel Bay, it was time to get into relaxed mode and I looked forward to some atlasing of the area, including Mossel Bay itself. 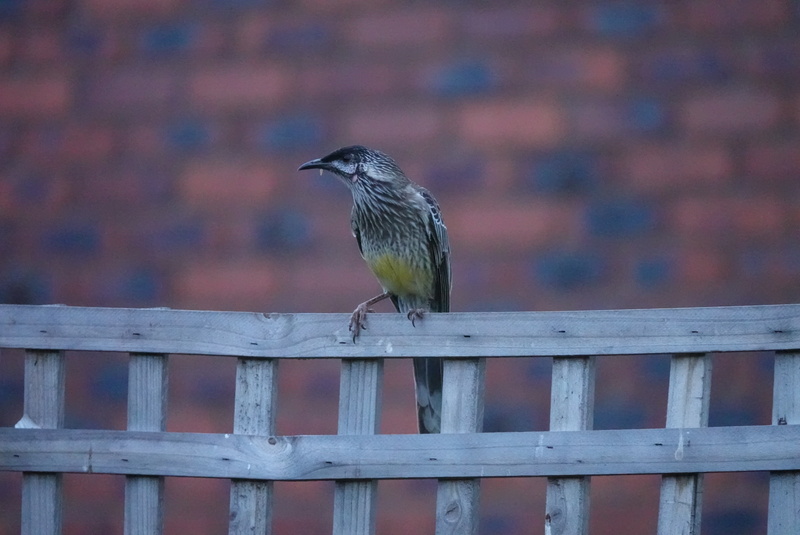 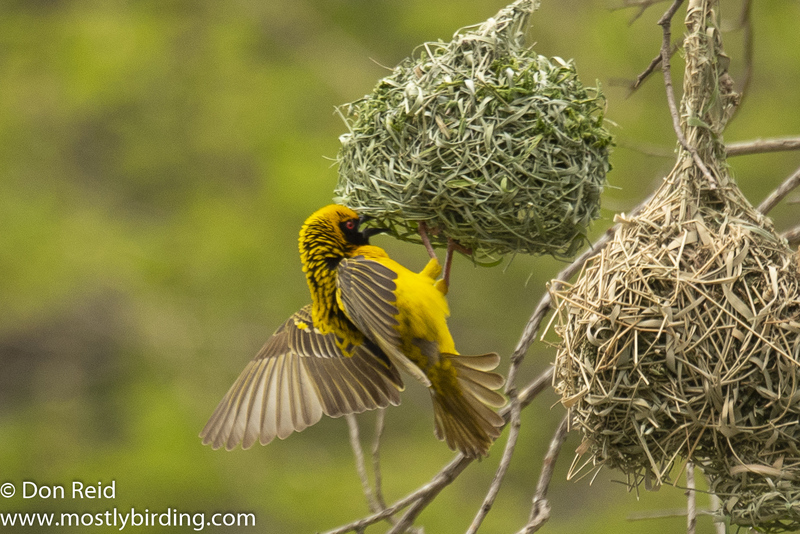 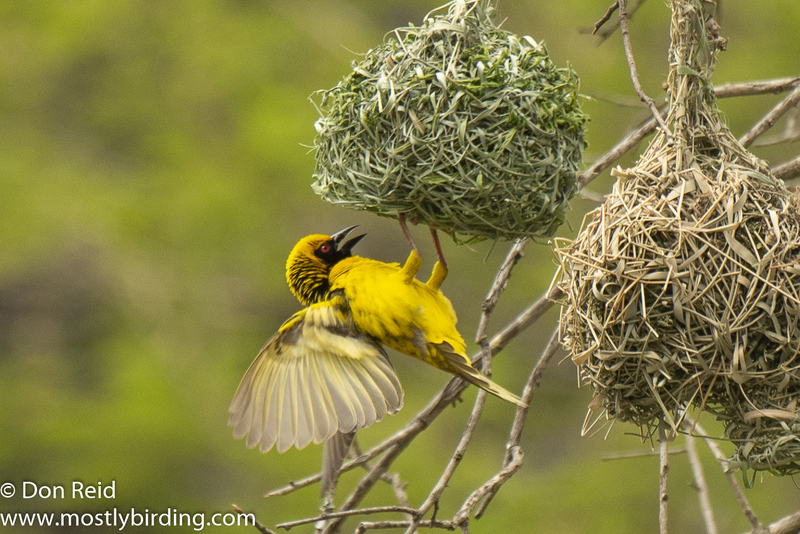 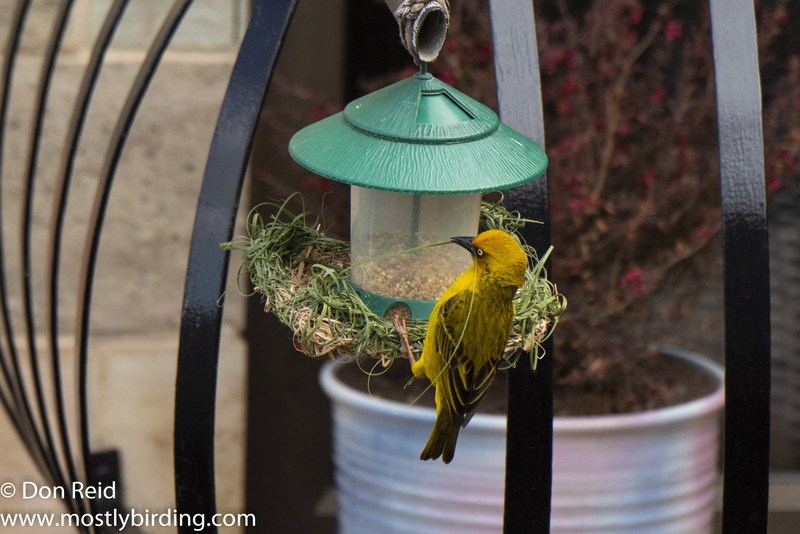 This Cape Weaver decided to use the bird-feeder in our neighbour’s garden as a base frame for its nest – probably an inexperienced juvenile practicing his skills. 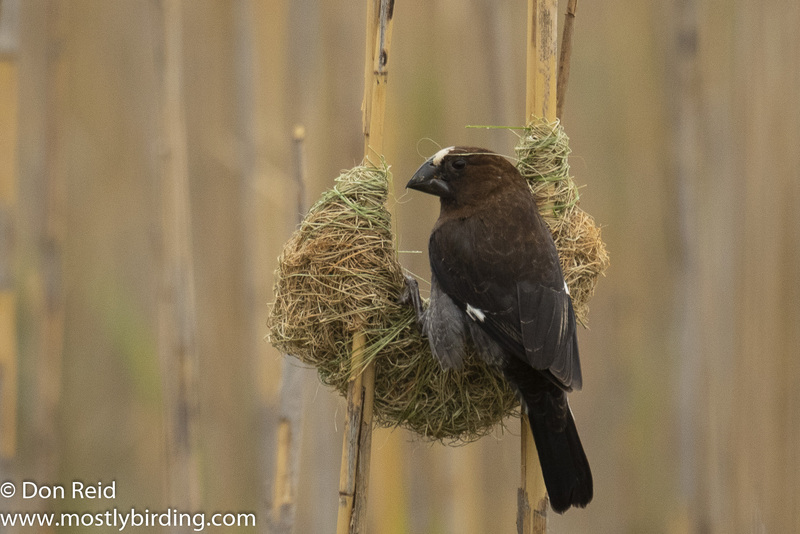 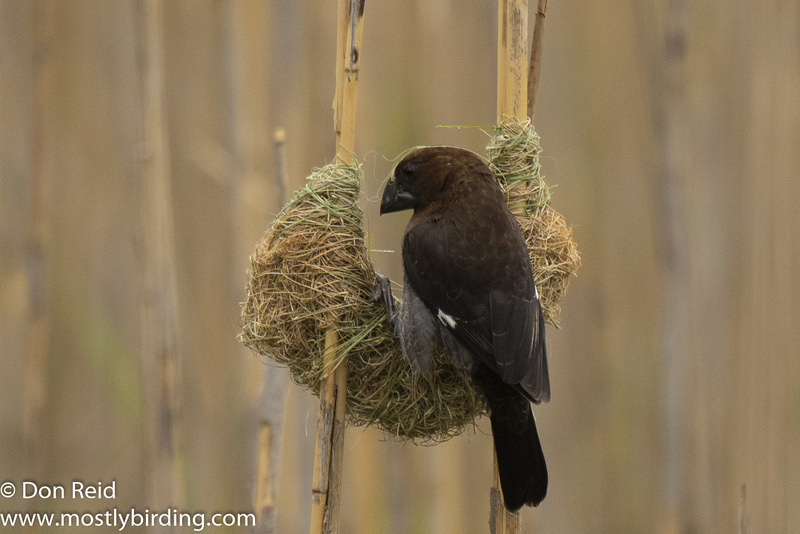 He never did complete the nest. 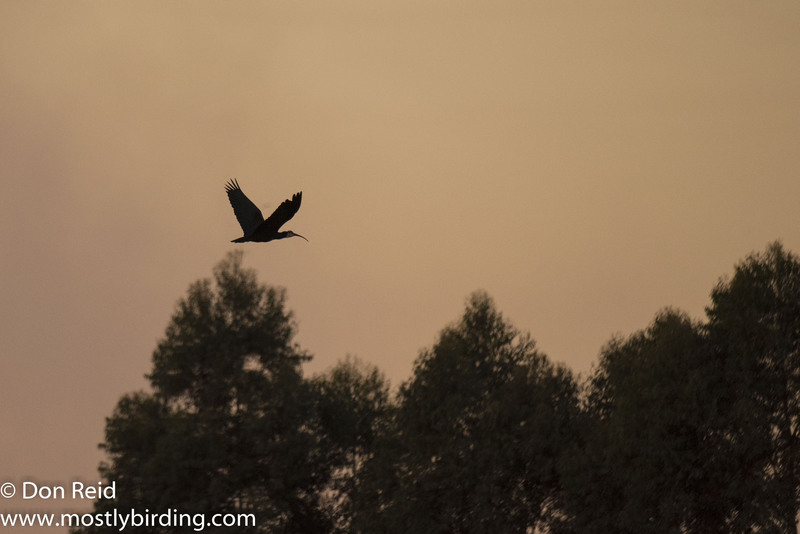 If you have any favourites, do let me know by adding your comment! 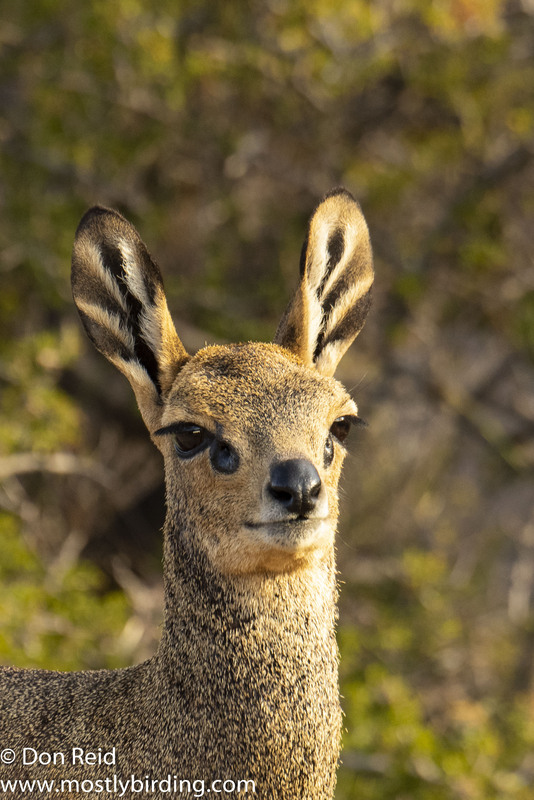 Wishing all who may read this a 2019 that meets all of your expectations! 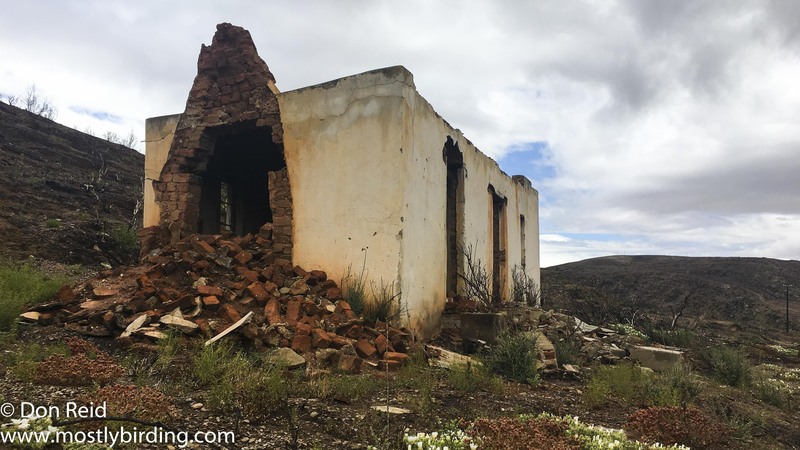 While atlasing along the back roads of the Little Karoo south of the small town of Van Wyksdorp, I was drawn to an abandoned house not far from the gravel road, all on its own and looking picturesque in the soft, filtered light of a cloud-covered sky. 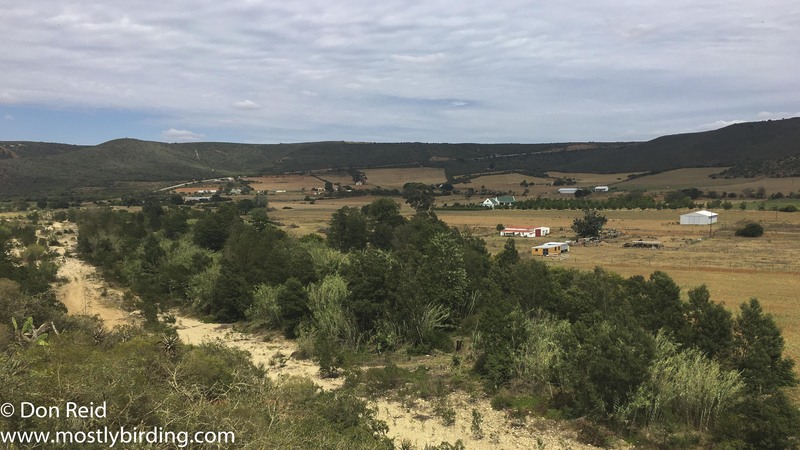 I just could not resist taking a few photos with my iPhone and walked up the short slope to where the house stood, picking my way through low bushes and across the stony ground. 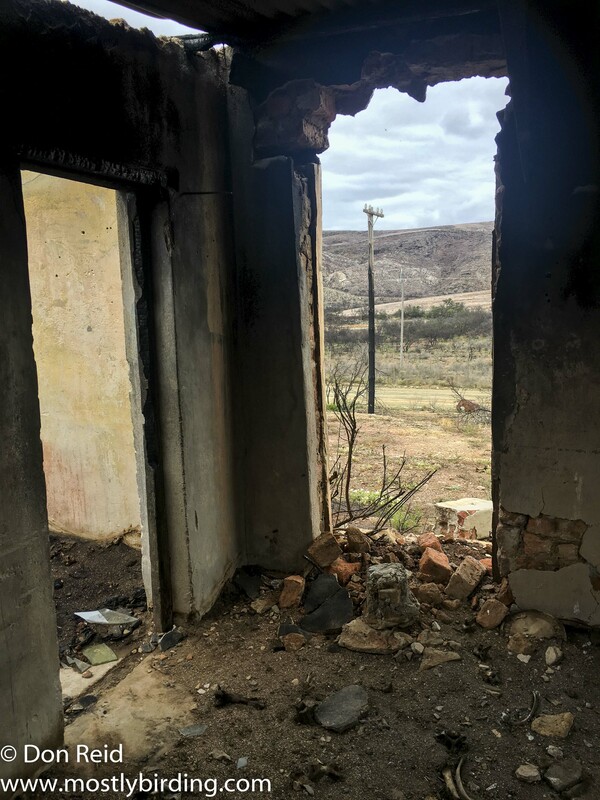 All went well as I carefully made my way around the old house, choosing my angles while stepping around the rubble, bent wire and various other remnants of a once simple but proud home, which was probably occupied by workers on a nearby farm. 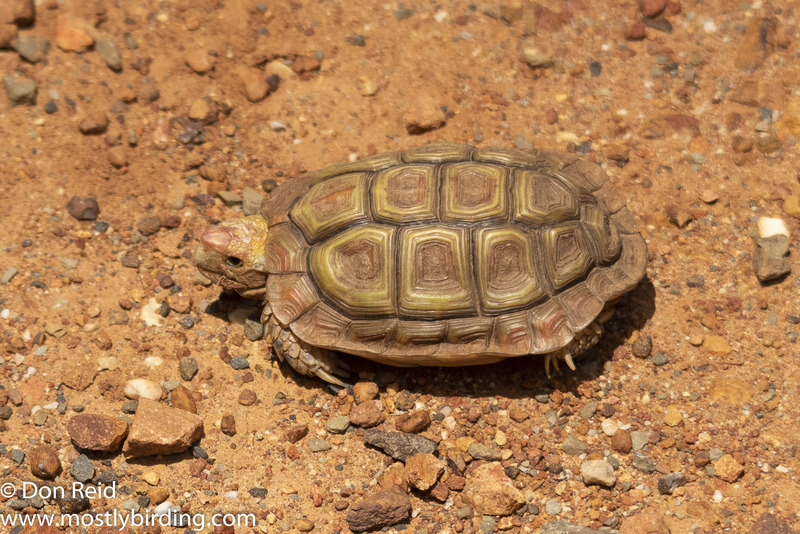 I had done a full circuit of the house and was rounding the last corner when I was stopped in my tracks by what lay on the ground, the only real sign of the previous habitants. 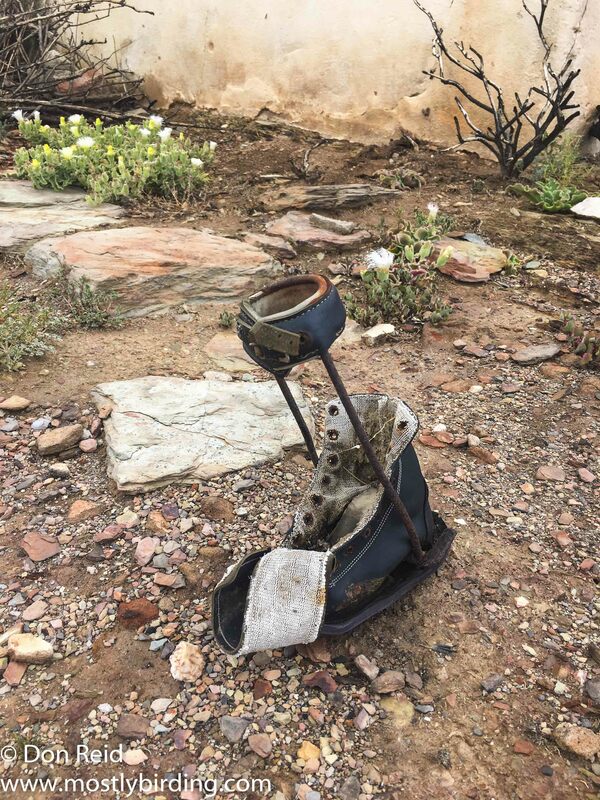 I picked it up to make sure it was what I thought it was – indeed, a small child’s orthopaedic shoe with steel leg brace, left behind as a poignant reminder of whoever had lived and played here. 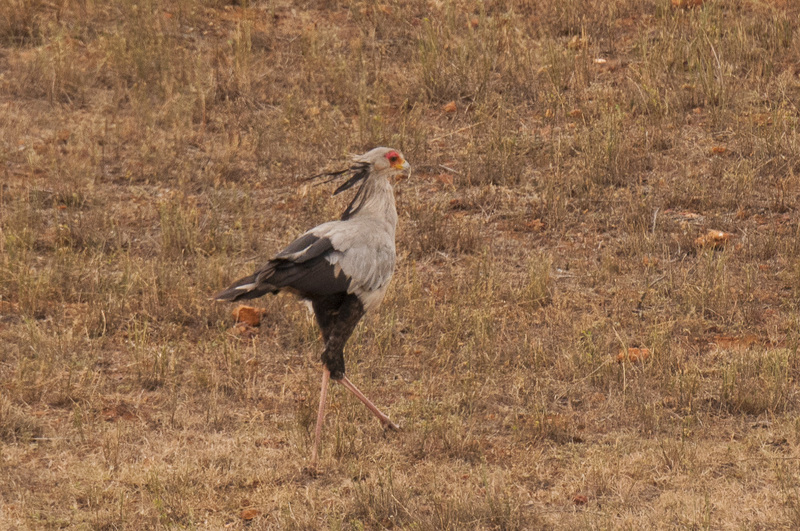 At a guess the shoe would have fitted a child of no more than 3 or 4 years old. 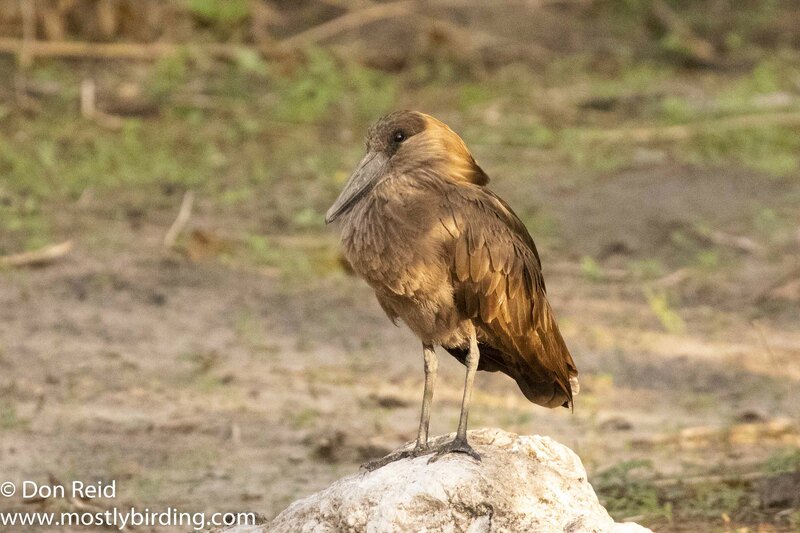 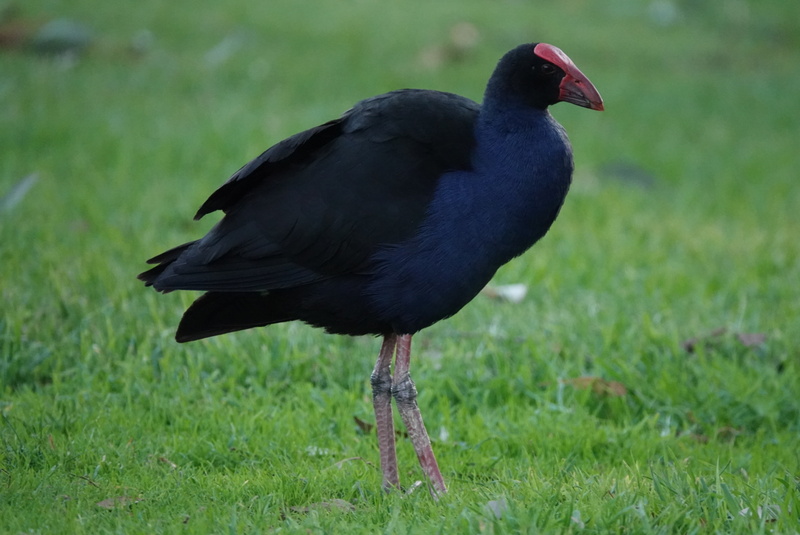 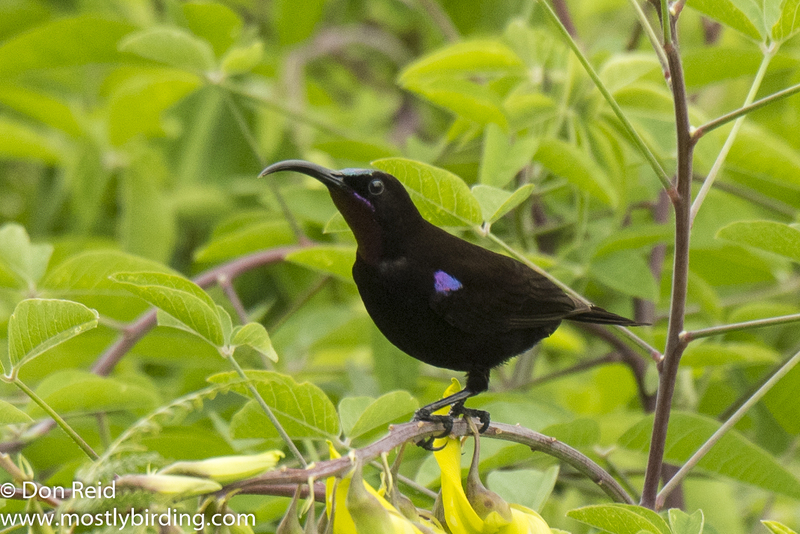 I could hardly concentrate on my birding for the next while as my mind conjured up all kinds of questions on what I had found – who did the shoe belong to, why did they leave, where are they now, why did they leave this one shoe and nothing else? 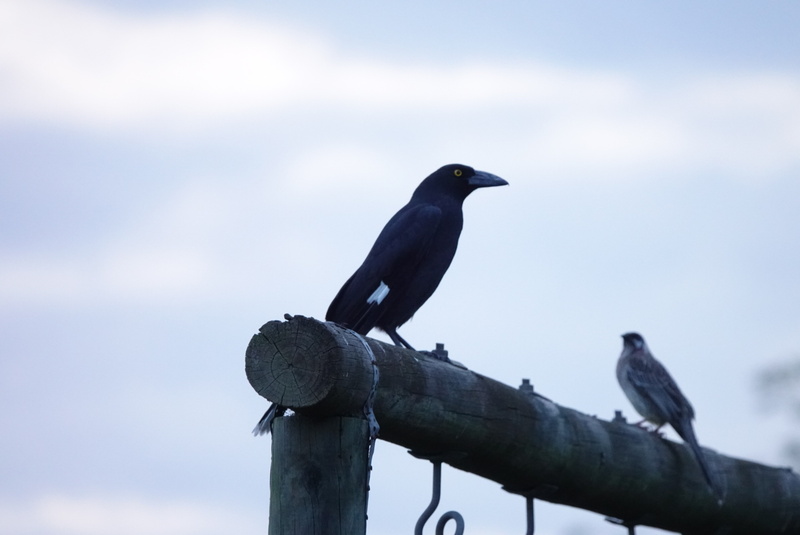 I’ll leave you to ponder these and other questions yourself. 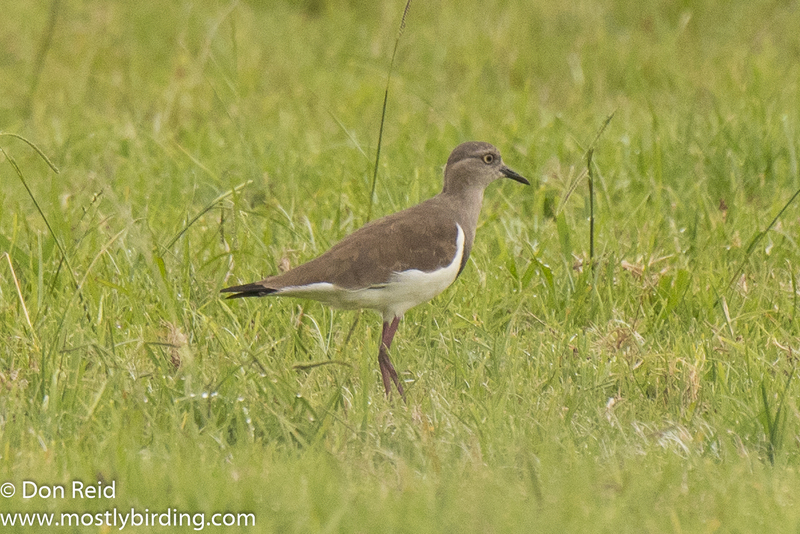 An easily identified wader or shorebird compared to others of its ilk, darn difficult to find in Southern Africa if my experience is anything to go by. 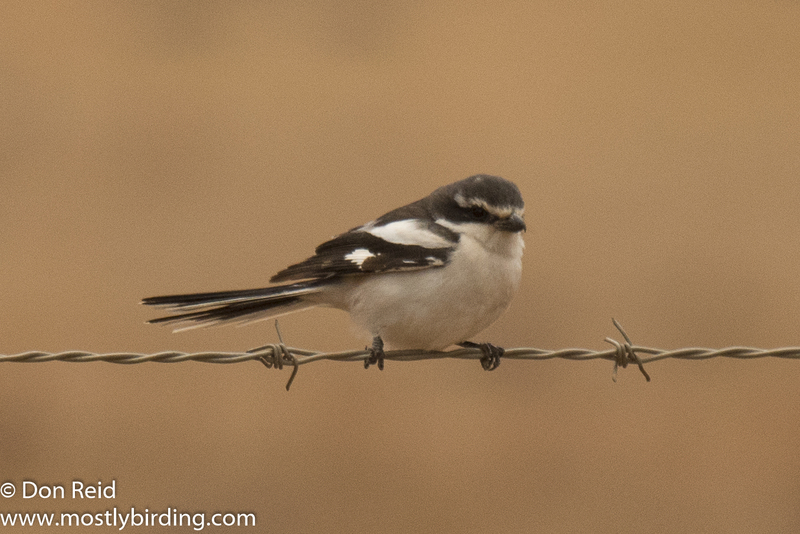 It’s been on my list of “birds to get” for far too long and I have tried to find it on a couple of occasions, without success. 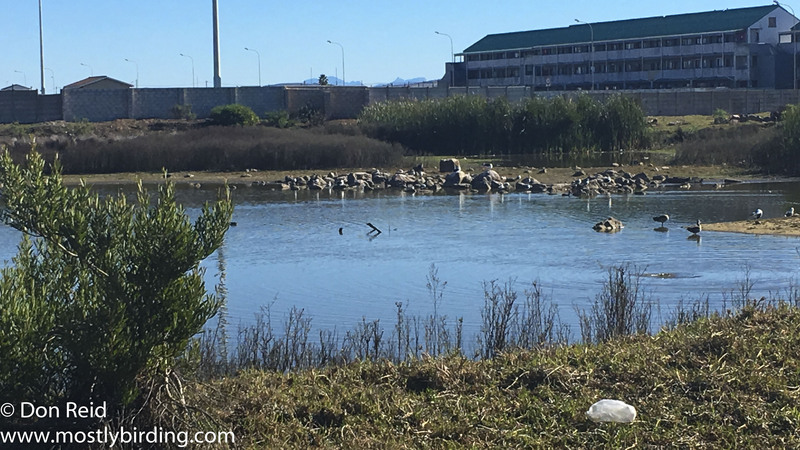 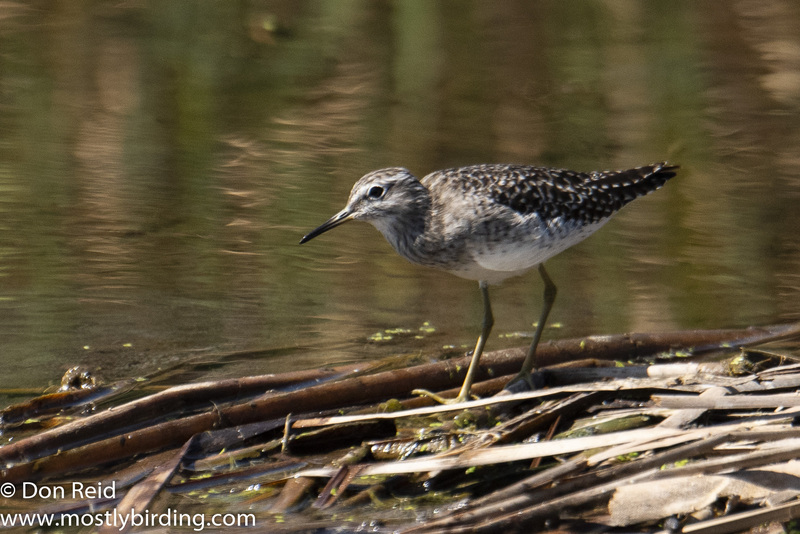 So, when a message appeared on the Mossel Bay Birding WhatsApp group – “Terek Sandpiper at Great Brak“ – I made a quick decision to see if I could find it. 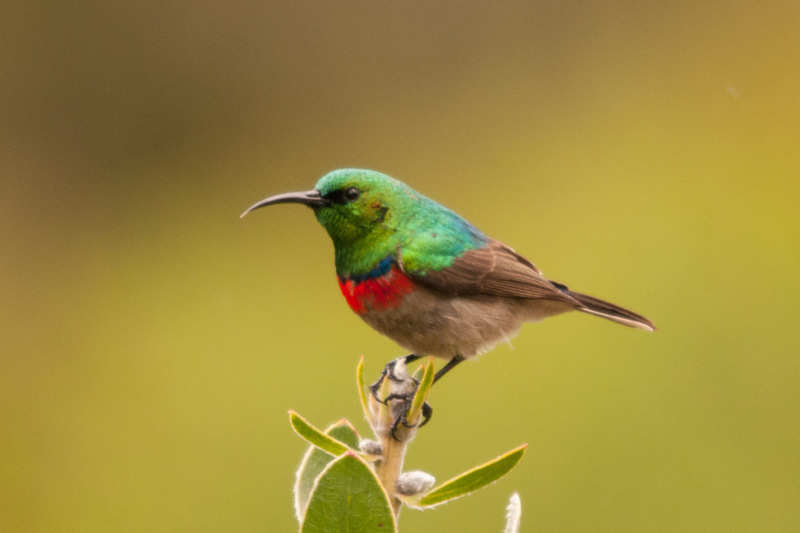 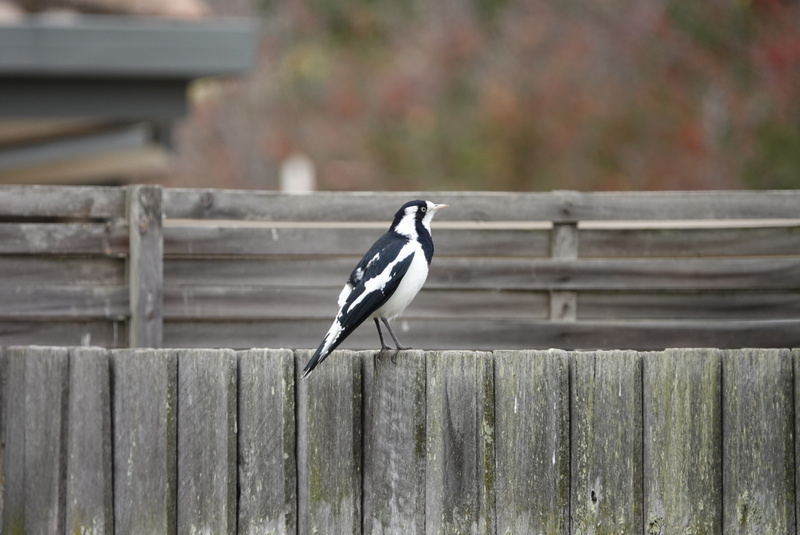 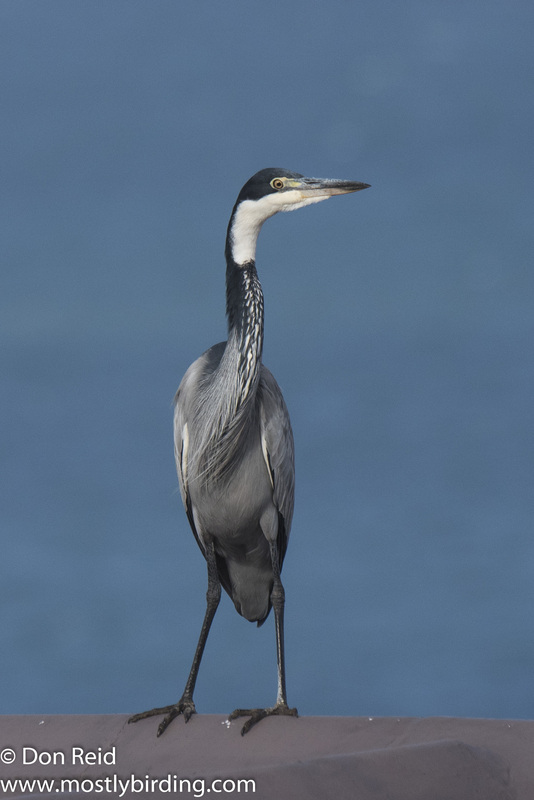 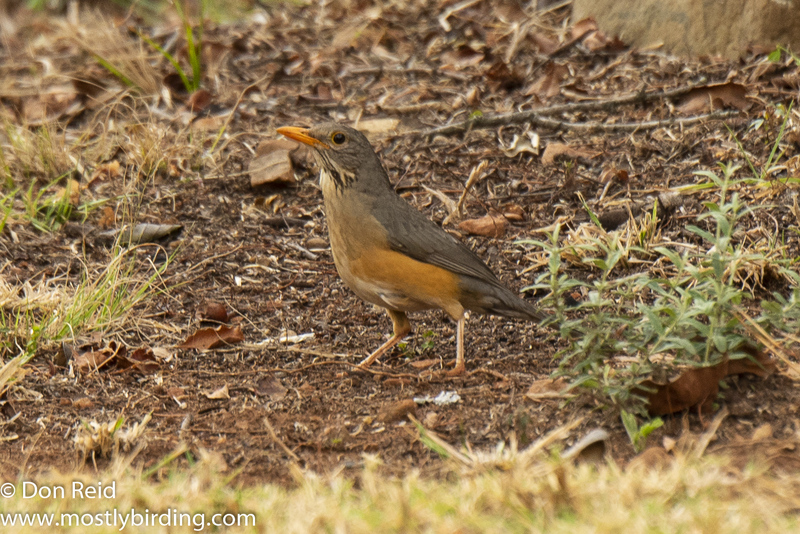 Being a summer migrant and occasional winter migrant (non-breeding) to the southern Cape town of Mossel Bay from our home in Pretoria, I was just a half hour’s drive from Great Brak River, so that would make it an easy decision, you would think. 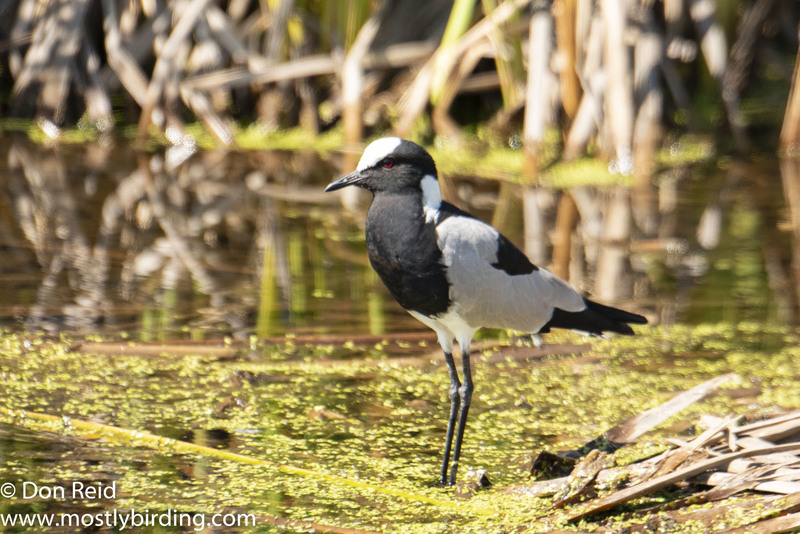 However, I had been bird atlasing since 5.30 am that morning in the Oudtshoorn area, returning home at 2.30 pm, so I already had 9 hours of driving/atlasing under my belt. 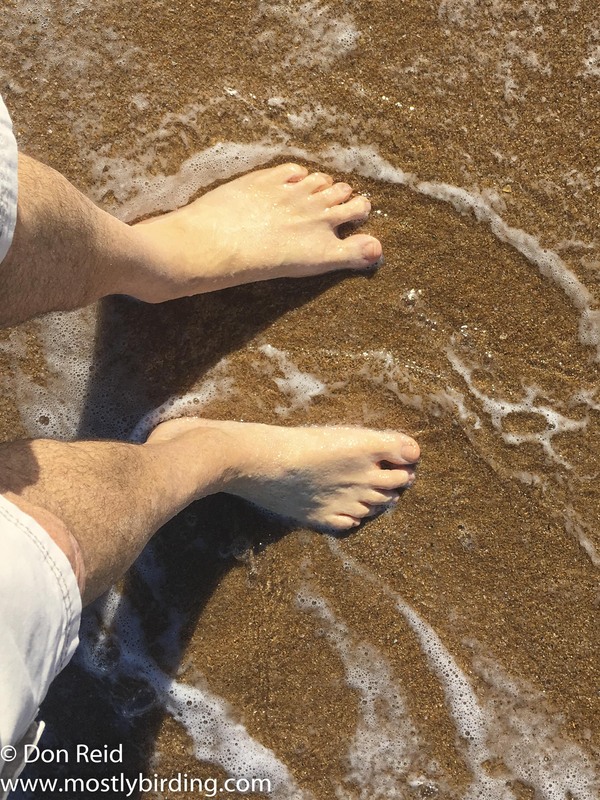 This was followed by some domestic chores and a trip to the shops so by the time I read the message I was ready to put my feet up and relax for the rest of the late afternoon and evening. 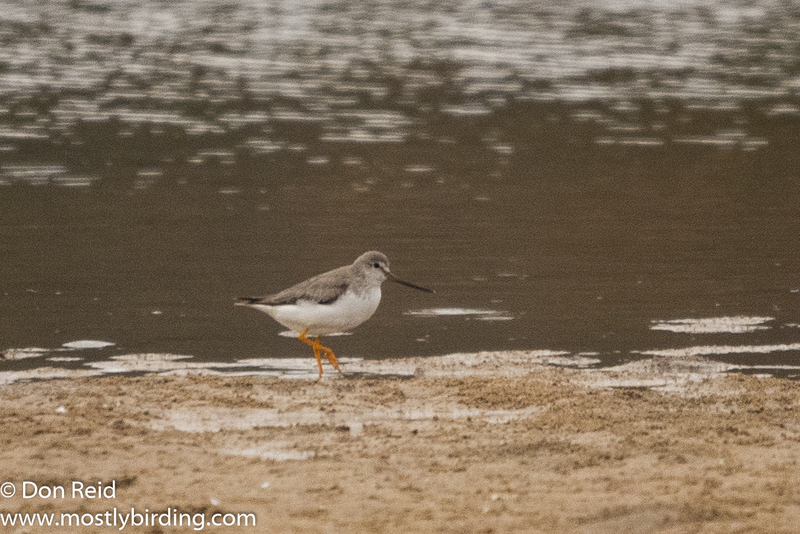 The Terek Sandpiper message changed all that and after a quick reviving coffee I was off to beat the sunset, which was still an hour and a half away, but light was fading…..
By 6.30 pm I was at the spot along the Suiderkruis road which skirts the Great Brak river mouth and ends at a parking area adjoining a picnic spot where several groups seemed to be celebrating the end of their working year in loud style – not quite the accompaniment you want when searching for a lifer but I did my best to ignore the raucous goings on and remain focused on my mission. 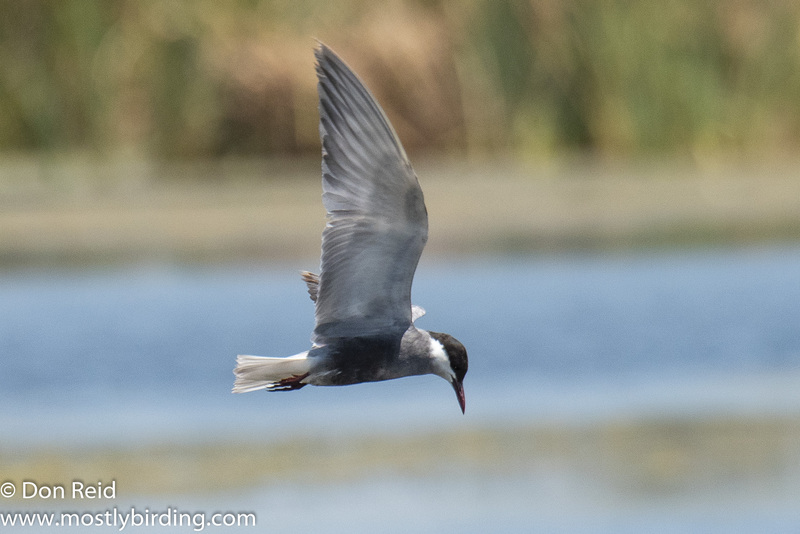 Once parked, I got out to scan the sand banks in the middle of the river and could immediately see dozens of Terns and Gulls, but more importantly many smaller shapes moving about in the subdued light. 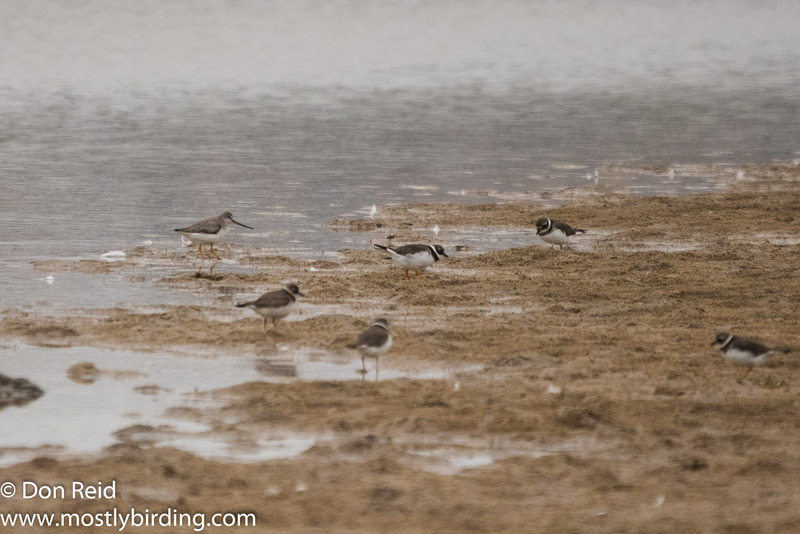 Checking these with my binos made my heart sink momentarily as all I could make out were many groups of small shorebirds which all looked pretty much the same in the less than ideal light. 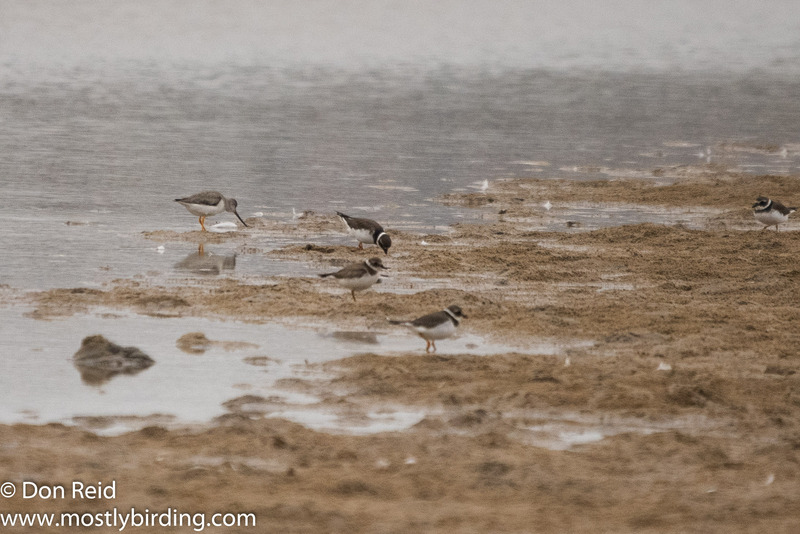 I had to get closer, so I set off along the sandy edge of the river until I could get a better view of the sand banks – this turned out to be the right move and I carefully scanned the gathered hordes of small shorebirds, mostly Common Ringed Plovers, for something different. 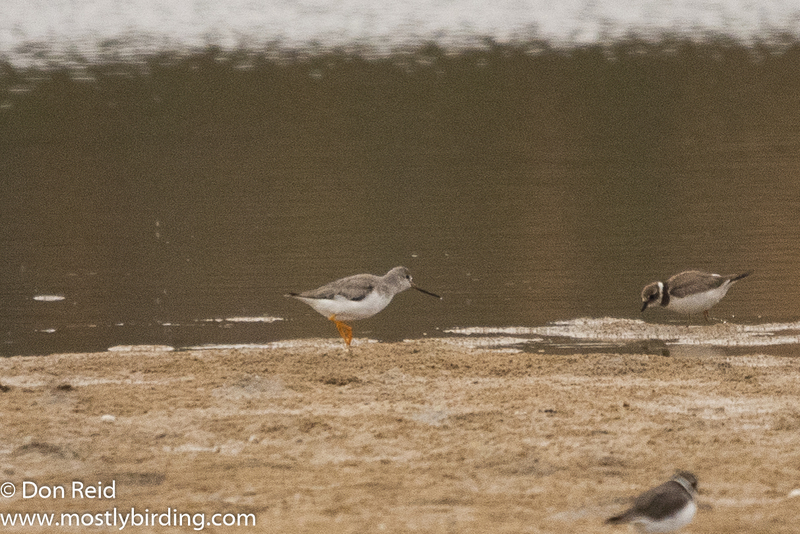 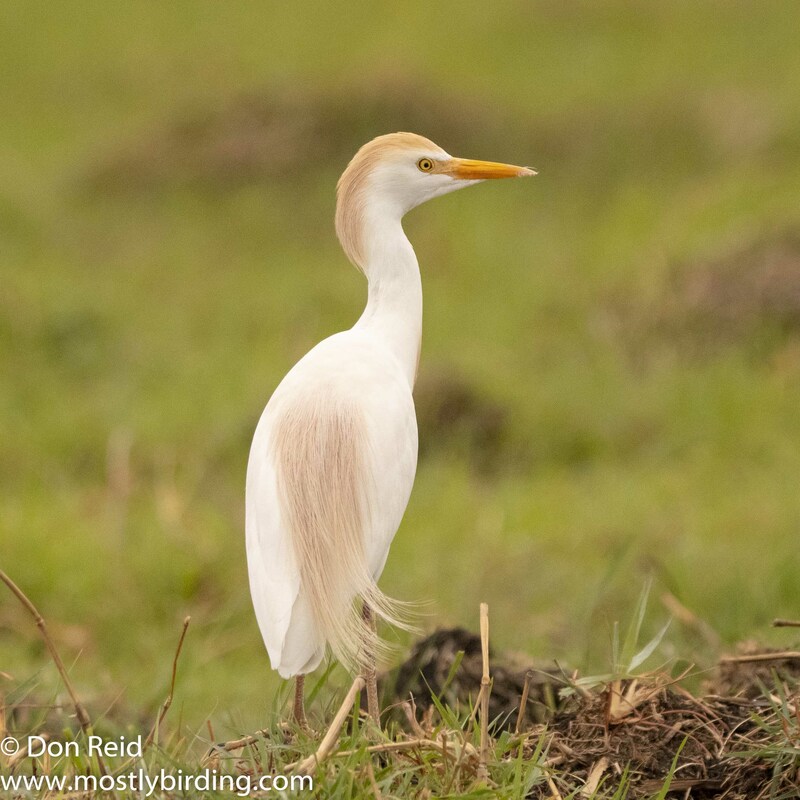 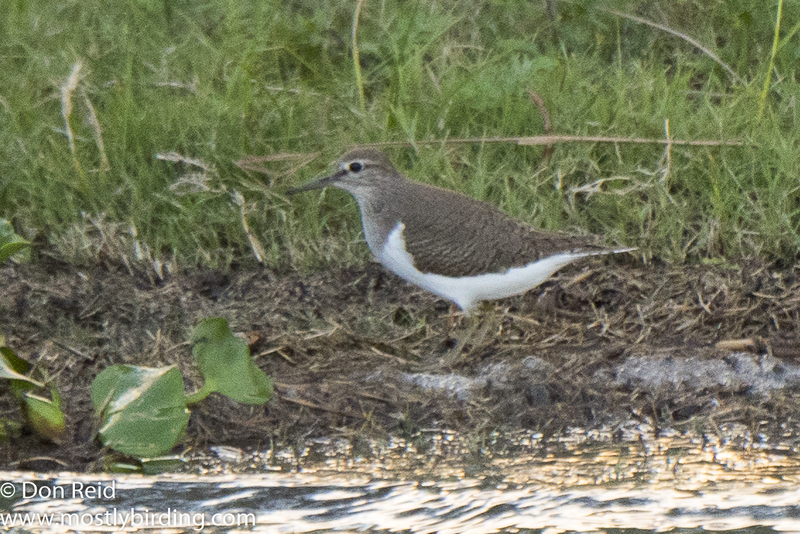 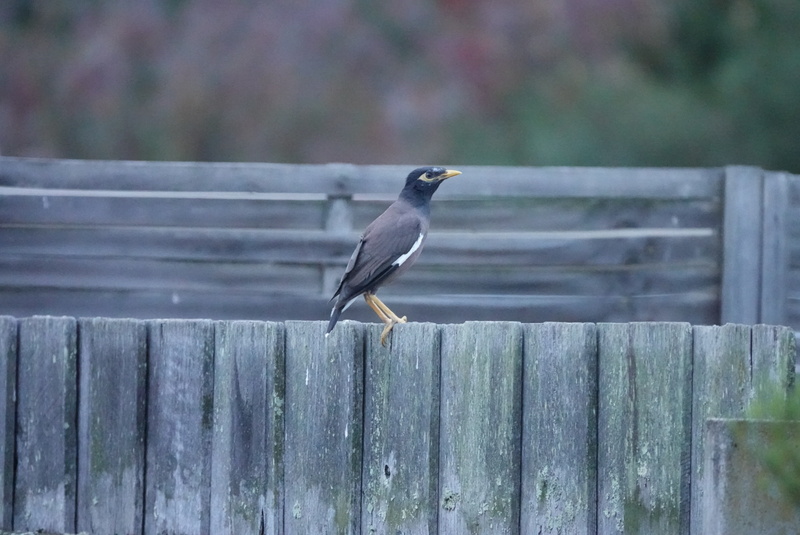 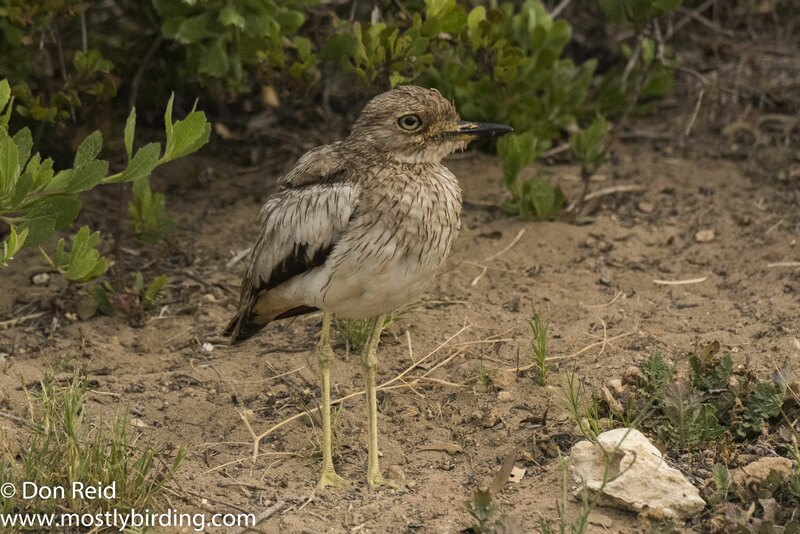 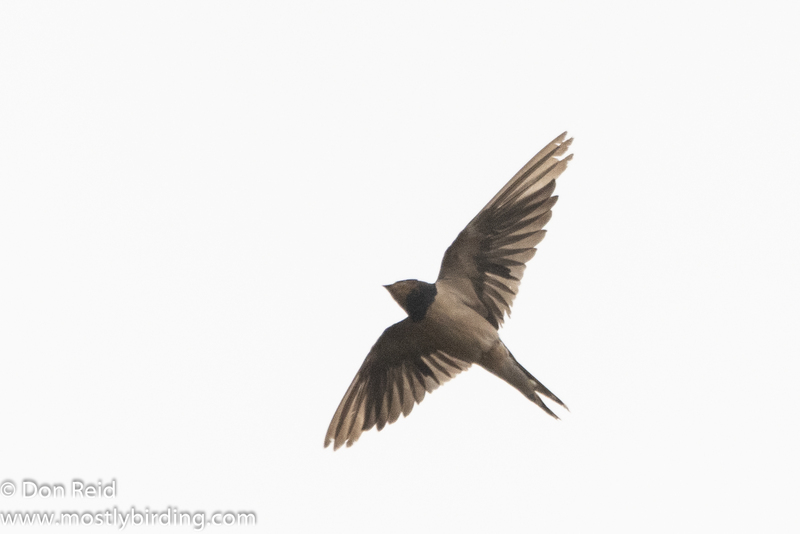 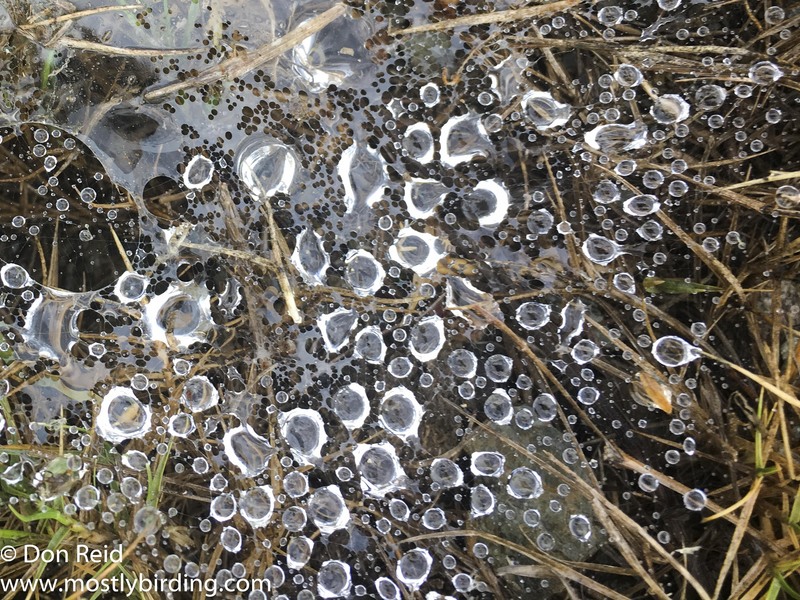 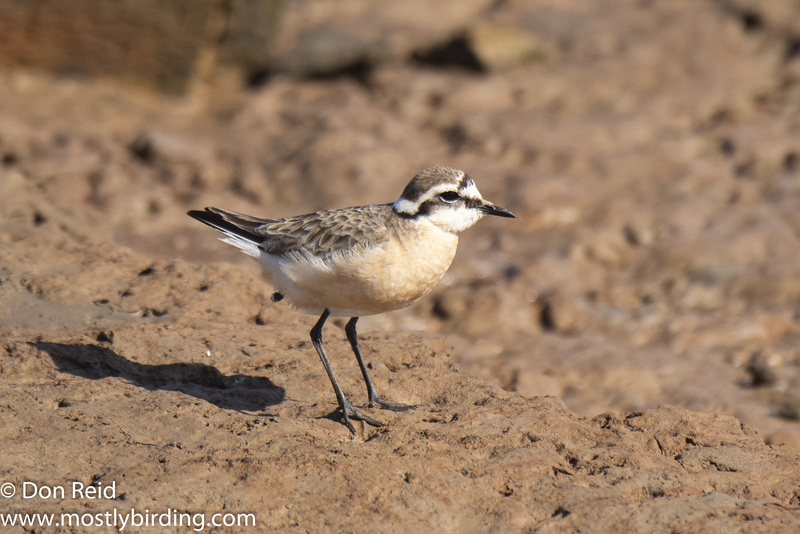 I gasped audibly when I spotted it – the low-slung body on short, bright orange legs and with a long slightly upturned bill stood out like a beacon amongst the more rounded, upright Ringed Plovers with short bills. 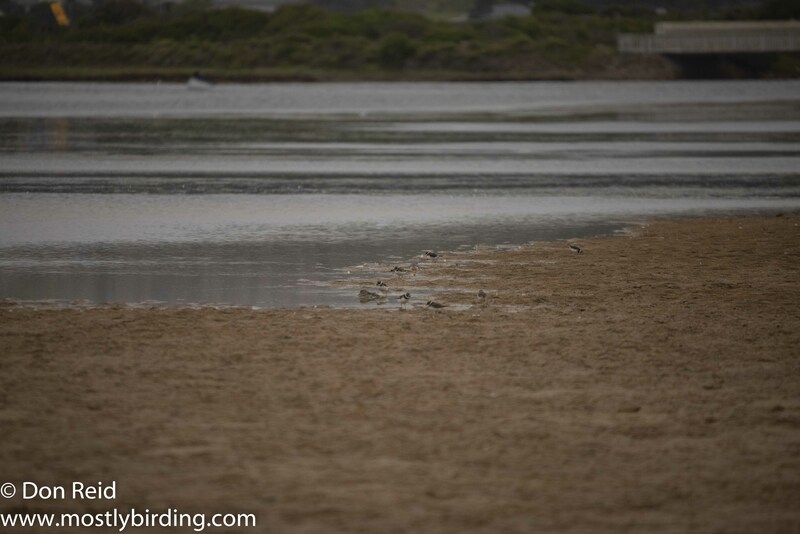 Savouring the moment, I waded cautiously into the shallow, wide stream separating the sand bank from the shoreline to try to get a little closer for a photo, but the birds were on to me and promptly moved further away. 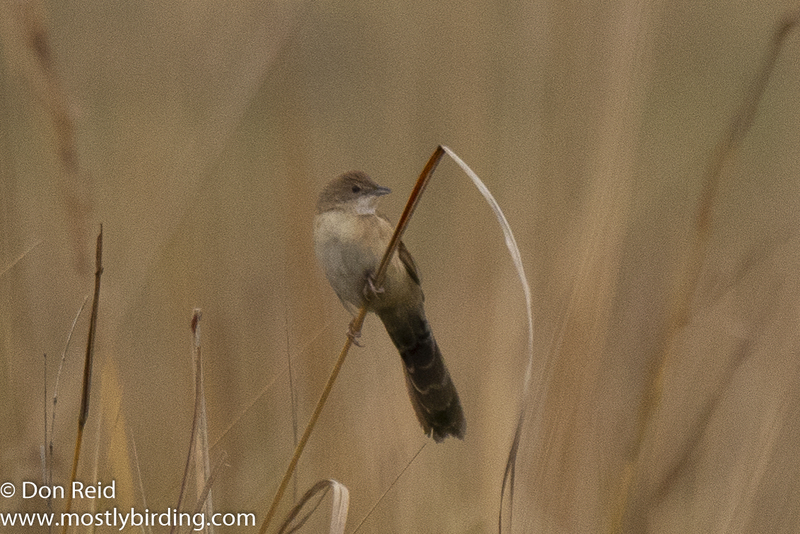 So I had to be content with a long-distance photo, which was quite a challenge in itself. 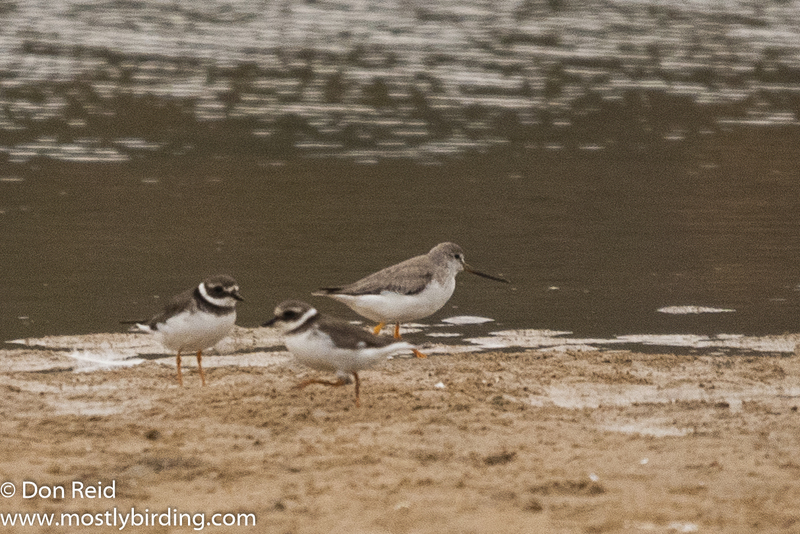 The Terek was moving in unison with groups of Ringed Plovers and just getting it vaguely into the camera viewfinder was all but impossible at the distance I was. 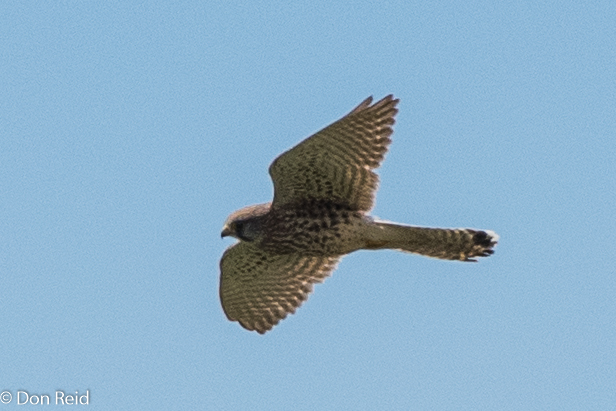 So I resorted to getting a lock on its position through my binos then quickly swopping over to the camera, pointing it at the same spot and rattling off a few shots. 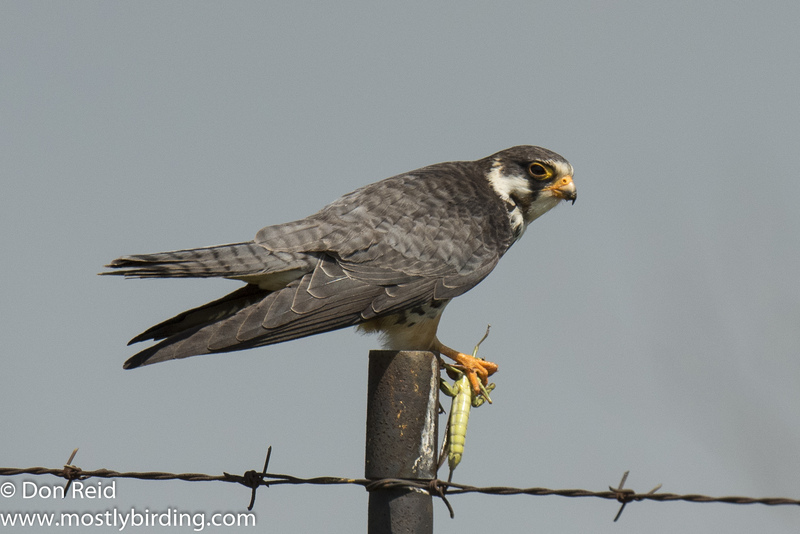 This worked up to a point but the best of the shots was well below my usual standard, so I crept a bit closer and repeated the process. 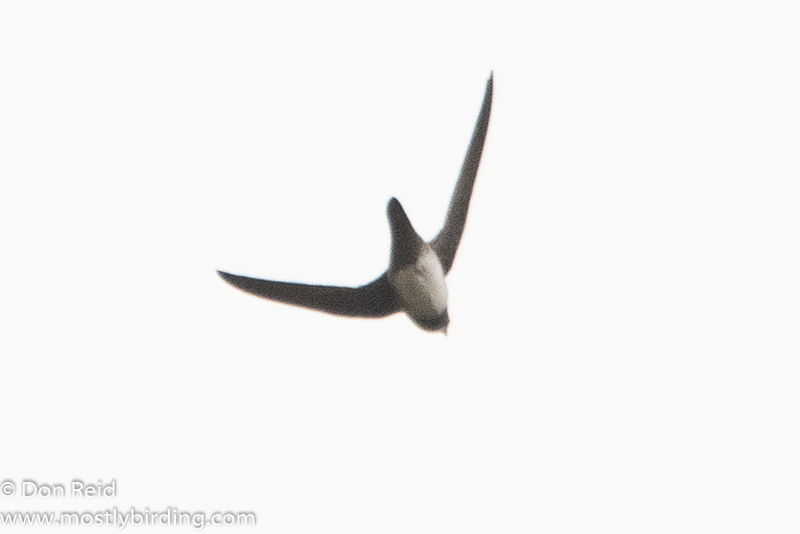 Deciding that this was about the best I could do and with the light conditions now very poor I trudged back to the car and set off homewards, very pleased with this long-awaited sighting.